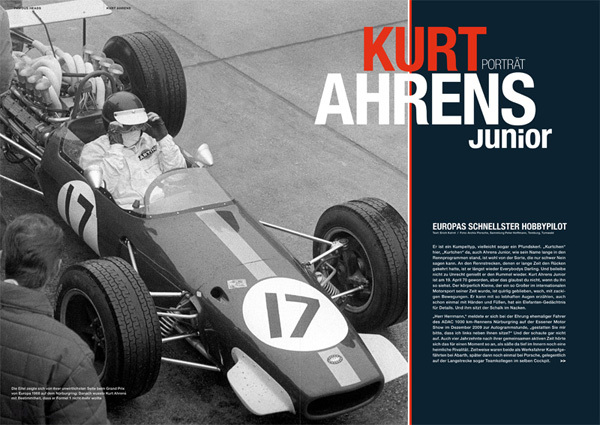 ﻿ "photographs of Carlos Ghys´ biography, part 22 = «KURT AHRENS»"
The son of a famous German speedway champion, Kurt Ahrens was always known as Kurt Ahrens Jr. during his early racing career which began in 1958 in Formula 3 events. 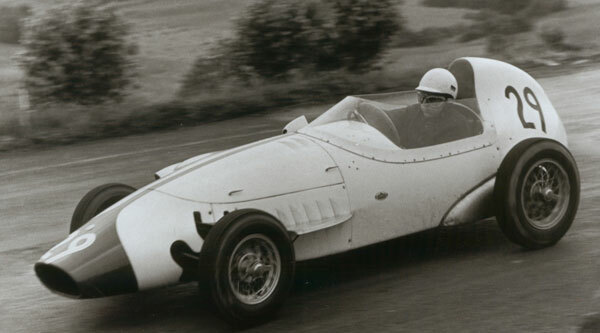 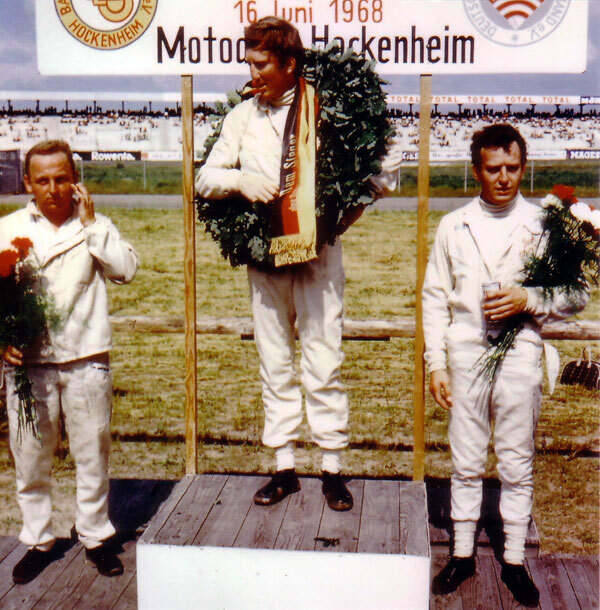 It was not until 1961 that he rose to prominence by winning the German Formula Junior title. 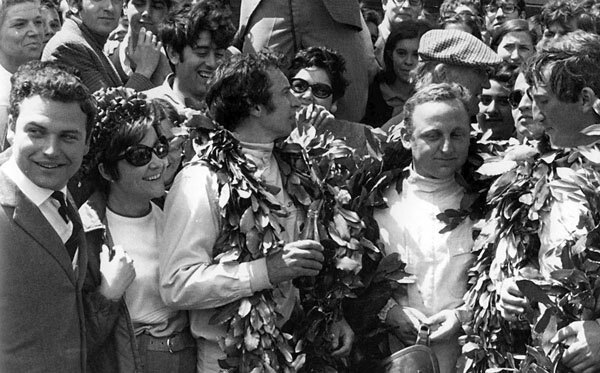 He repeated the success in 1963. 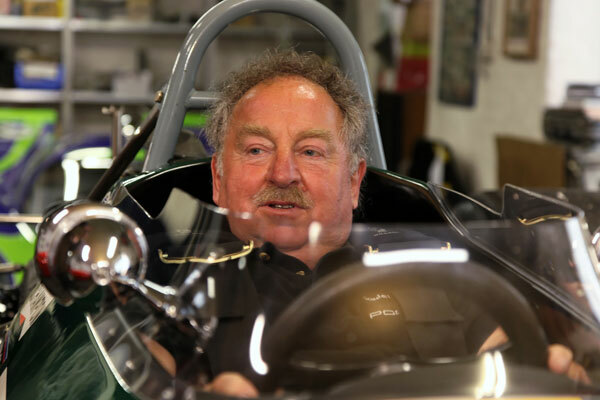 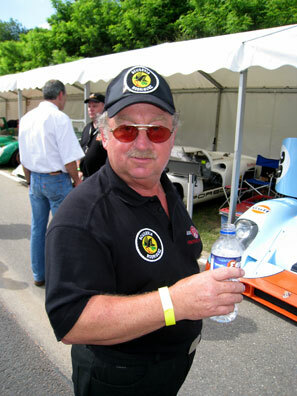 His father retired from the sport in 1963 and two years later Kurt Jr acquired a Brabham Formula 2 car and began to make a mark at international level. 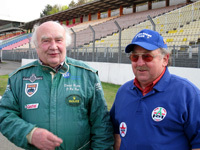 He also took part in touring car events at the wheel of a factory Fiat and in the course of the next few years he raced mainly in F2, taking part in three German GPs in the F2 class. 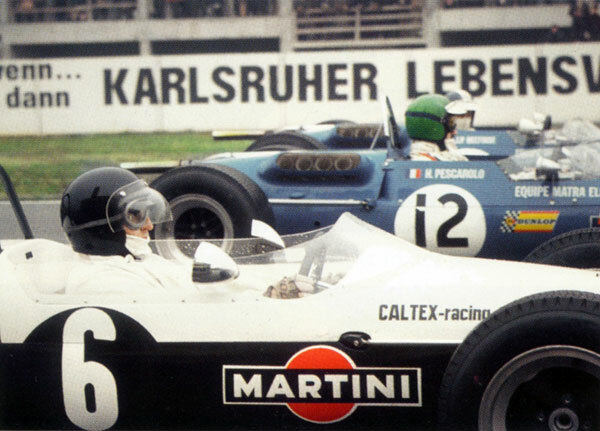 In 1968 he drove a Caltex-sponsored third works Brabham at the German event. 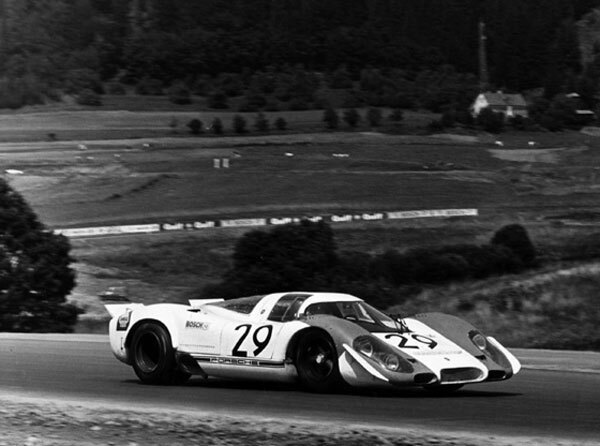 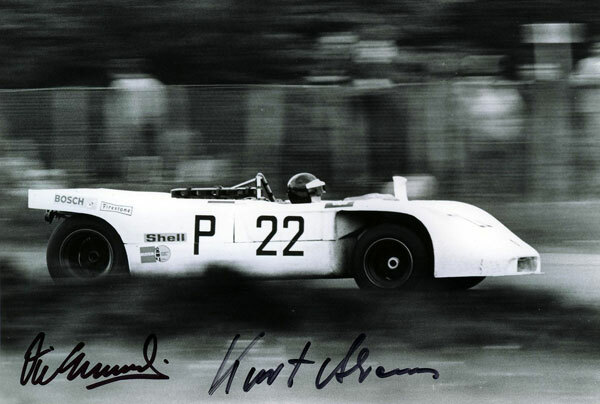 In 1969 he joined the Porsche factory sportscar team and shared victory with Jo Siffert in the Austrian 1000 event. 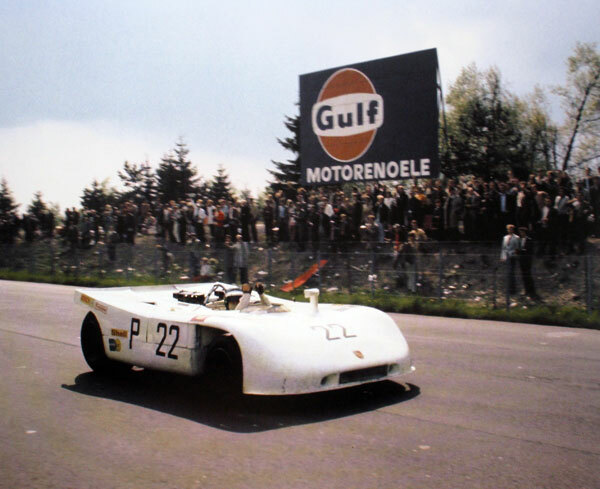 The following year he partnered Vic Elford to victory in the Nurburgring 1000. 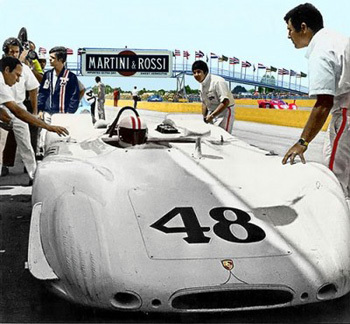 He retired in 1971 and concentrated on building up the family's car dealership and a scrap metal business. 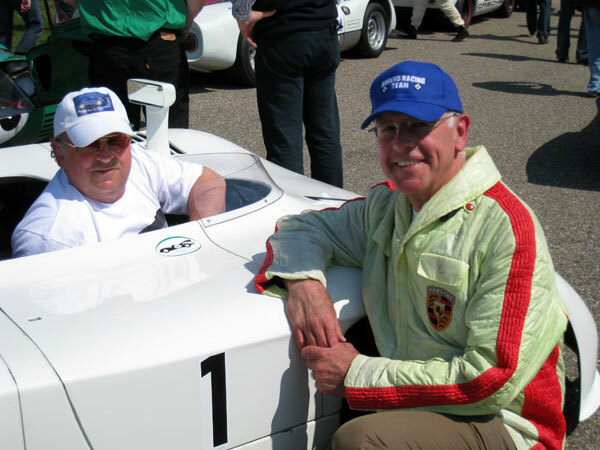 The first Porsche 55 Spyder was handed over to Kurt's father by Ferry Porsche himself. 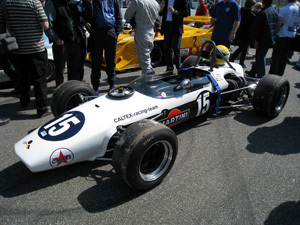 Kurt Ahrens Jr. (Brabham BT 21) in the Loews hairpin. 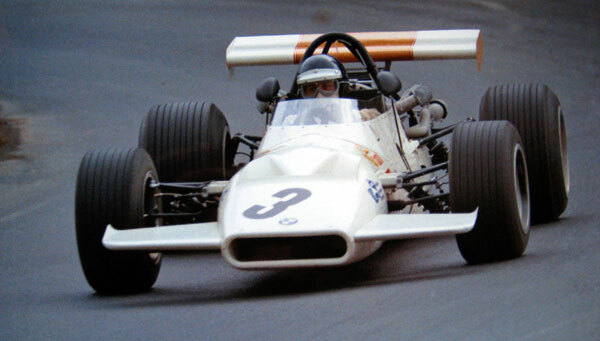 Kurt Ahrens Jr. at the wheel of the F2 BMW at the NÜRBURGRING. 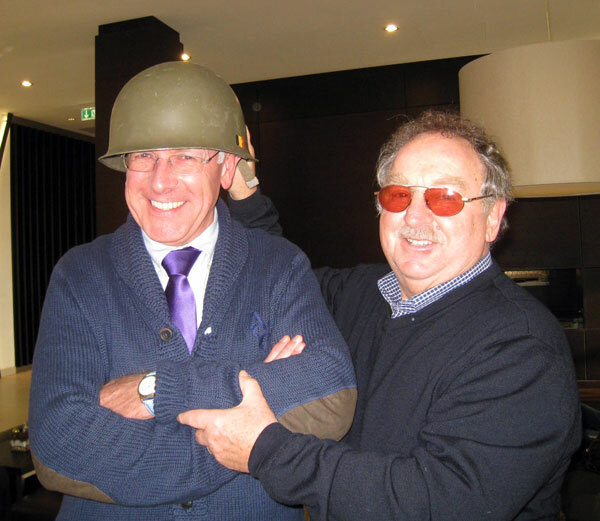 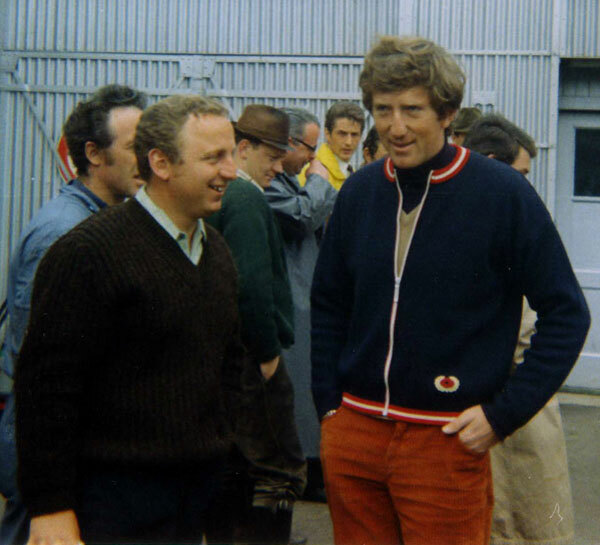 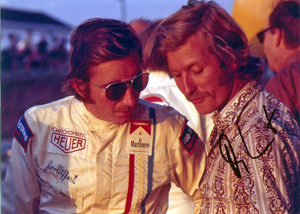 Kurt with Austrian Jochen RINDT. 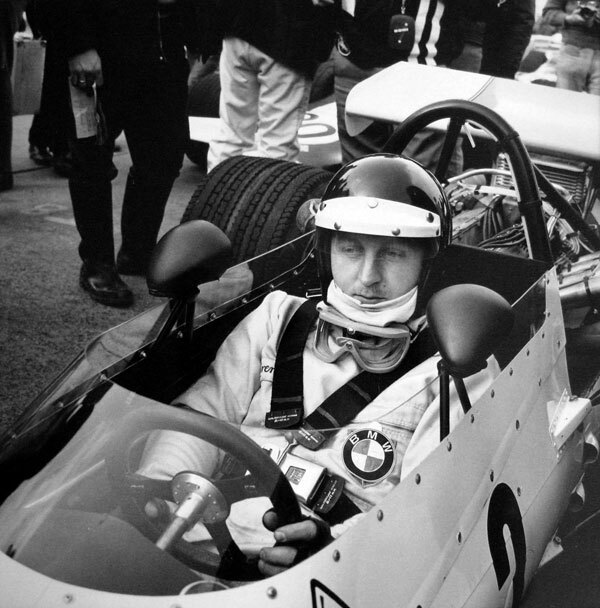 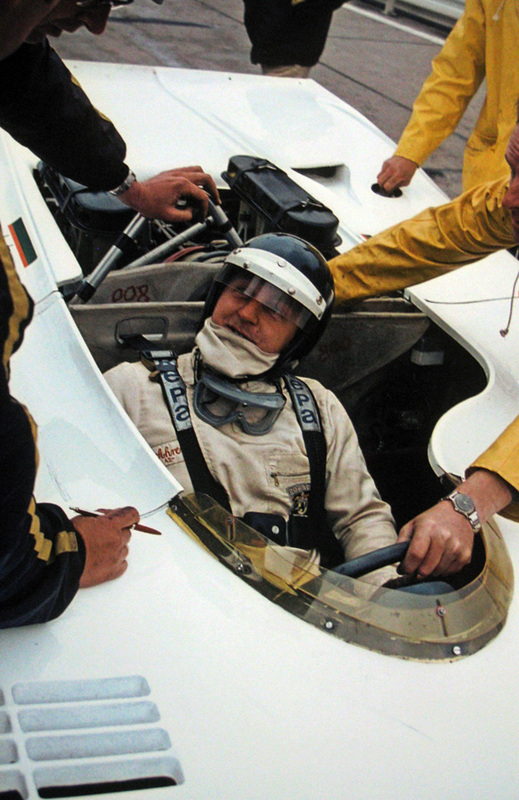 In 1970, Jochen became motor racing's first posthumous World Champion. 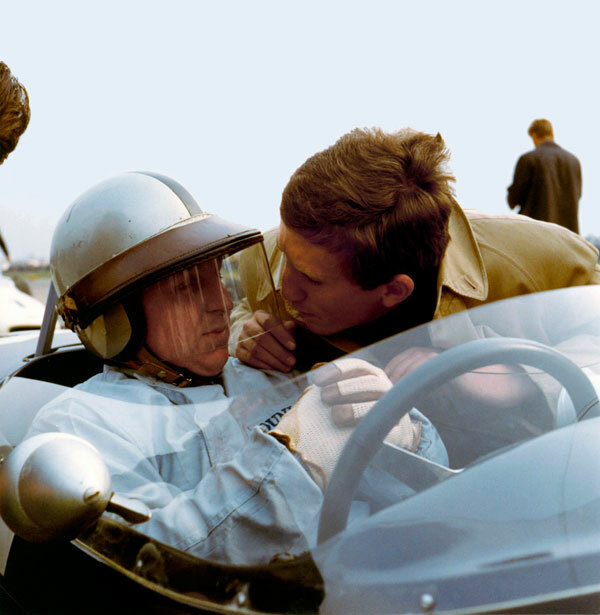 Kurt with Austrian Jochen RINDT. 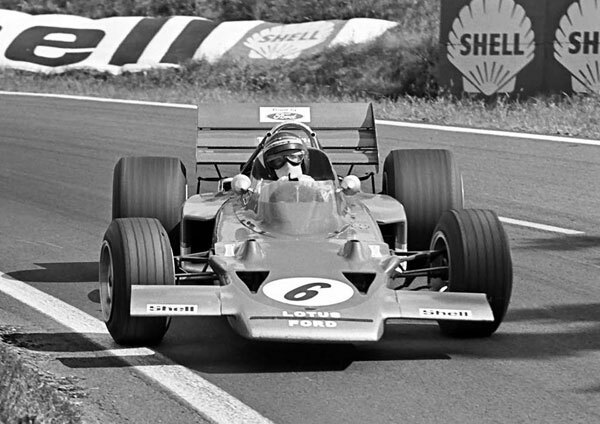 Jochen RINDT at speed in his Lotus 72. 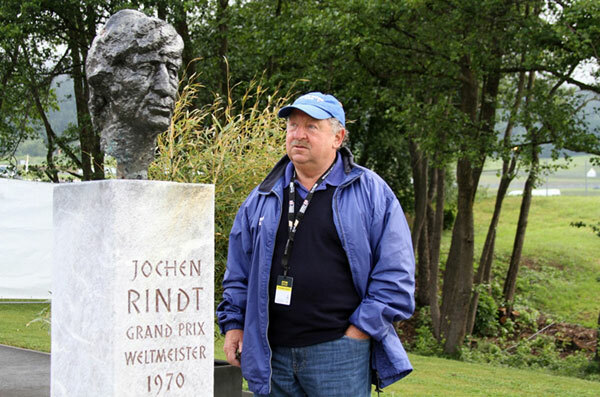 Kurt next to a statue of his friend Jochen RINDT. 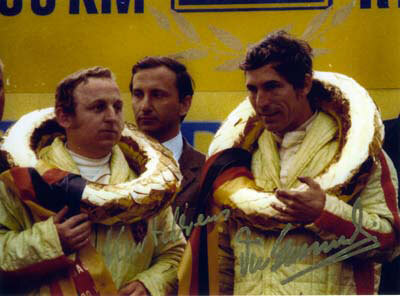 Third place after winner Jean-Pierre Beltoise and Jochen Rindt. 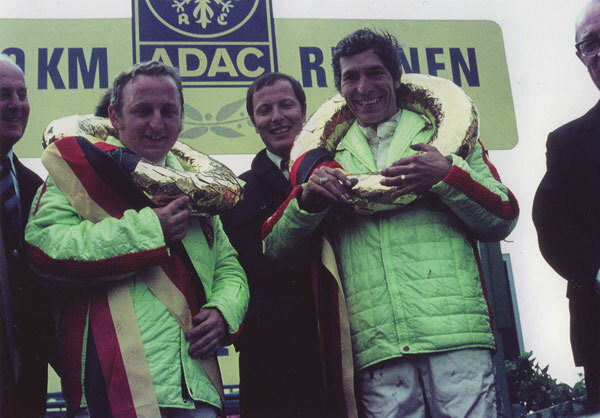 Third place after winner Jochen Rindt and Jackie Oliver. 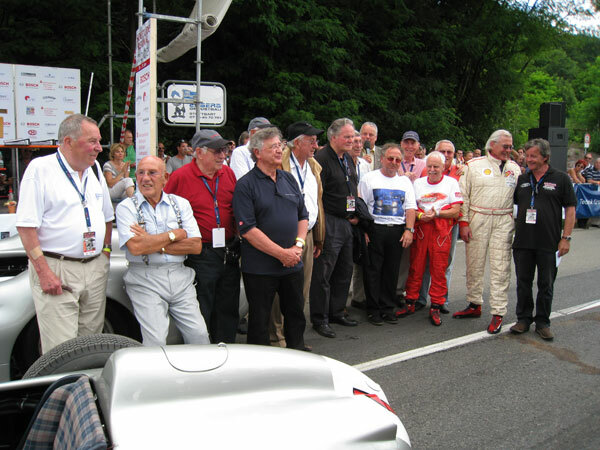 Kurt Ahrens Jr. is sitting on the front row left. 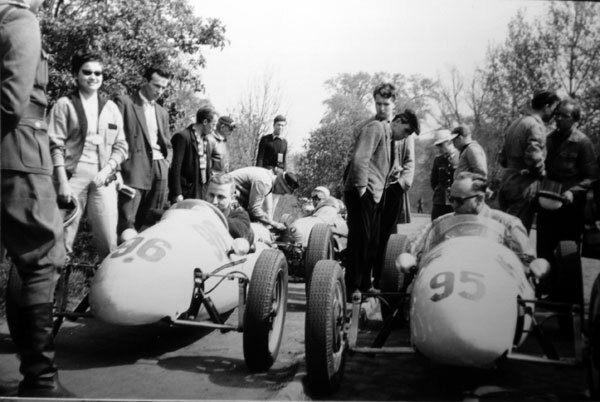 Do you recognize the other drivers? 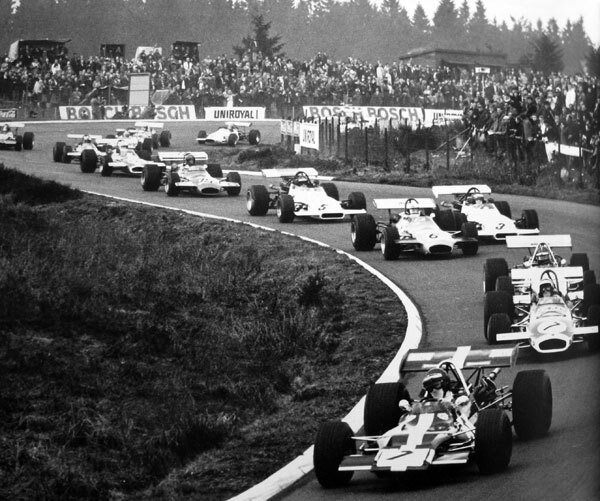 After Jo Siffert's unexpected victory for Rob Walker at Brands Hatch, the F1 teams headed off to the Nurburgring and more bad weather, the previous four races having all been affected by rain. 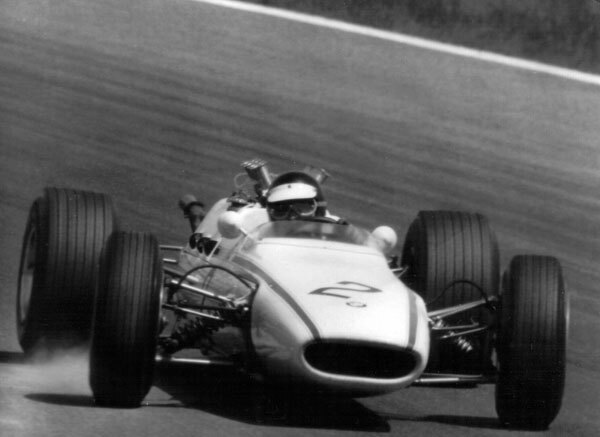 The field was much as normal with the only major additions being Kurt Ahrens, driving a third Brabham and Hubert Hahne entered in a BMW-entered Lola-BMW Formula 2 car, the Munich manufacturer having a look at the state of competitiveness in F1. 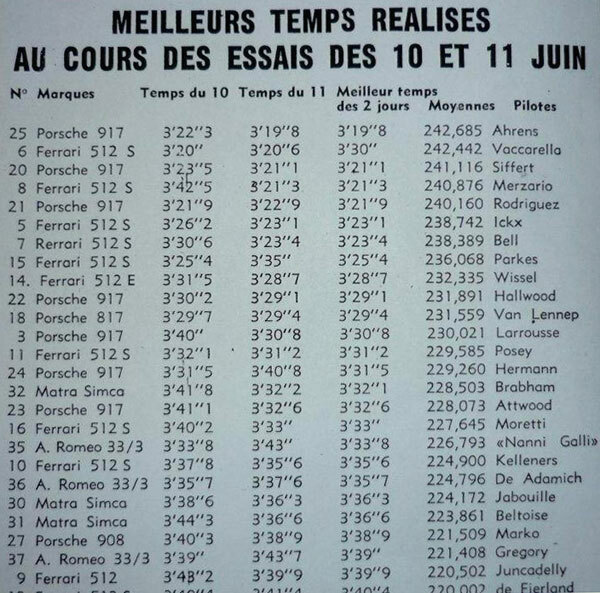 It rained throughout practice and Jacky Ickx took pole position in his Ferrari by a full 10 seconds with Chris Amon (Ferrari) second and Jochen Rindt third in his Brabham. 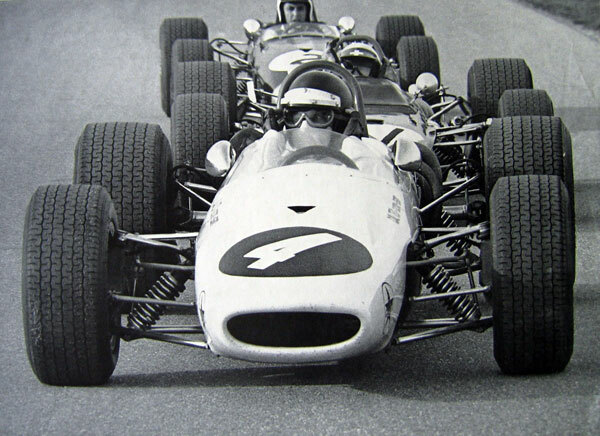 Graham Hill was on the second row in his Lotus, alongside the Cooper-BRM of Vic Elford. 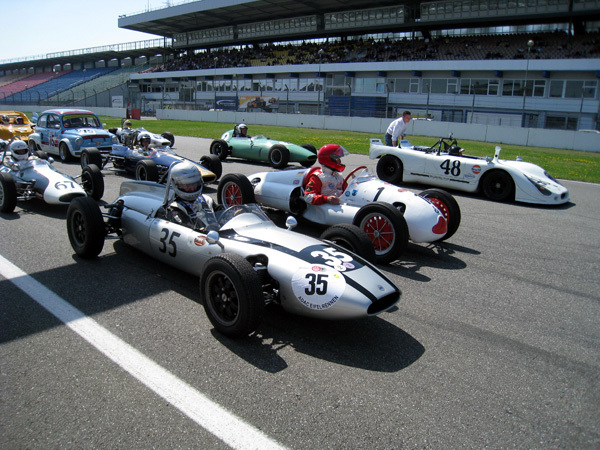 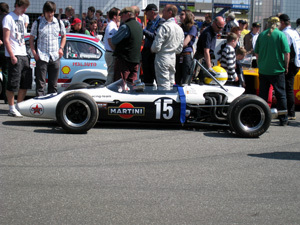 The third row featured Jackie Stewart's Matra-Ford, John Surtees in the Honda and Piers Courage in a Reg Parnell Racing BRM. 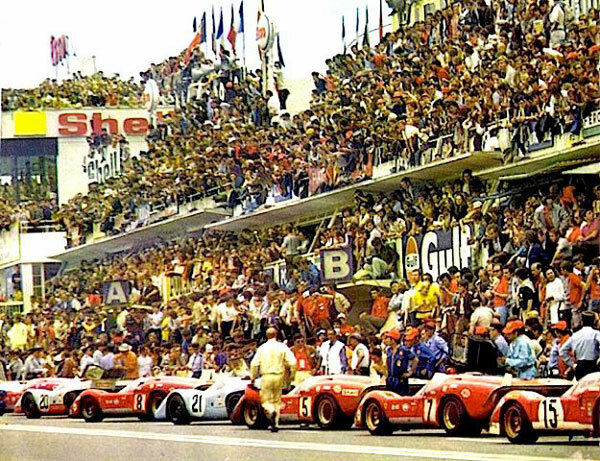 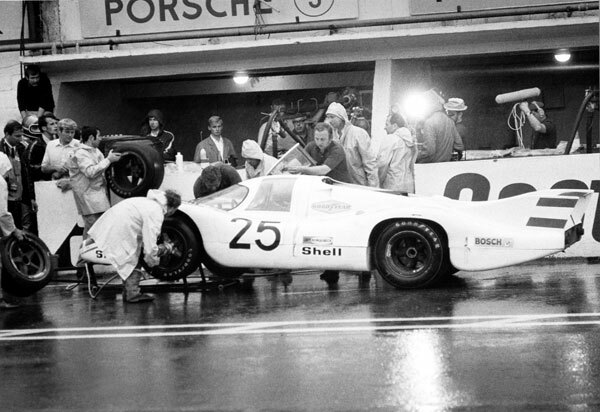 At the start of the race - in pouring rain - Hill took the lead from Amon, Rindt and Stewart. 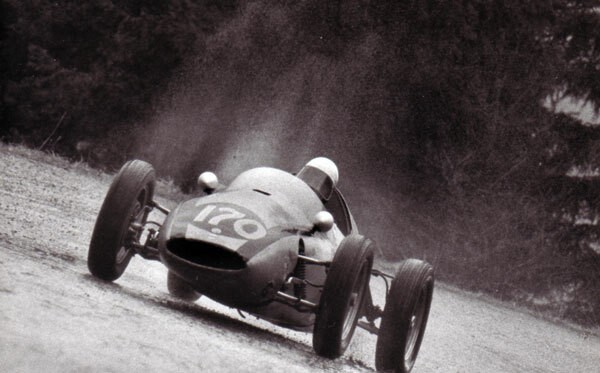 In the course of the first lap, however, Stewart moved to the front and built a nine second lead, using his Dunlop wet tires to maximum effect. 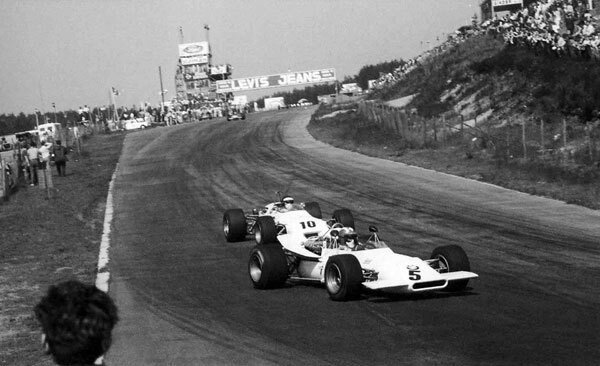 By the end of the second lap his lead was out to 34 seconds and after 14 laps he was over four minutes ahead of second-placed Graham Hill, who spun at one point but was able to get out of the car, push it back into the right direction and get it restarted before Rindt arrived, third-placed Amon having spun off earlier on the same lap. 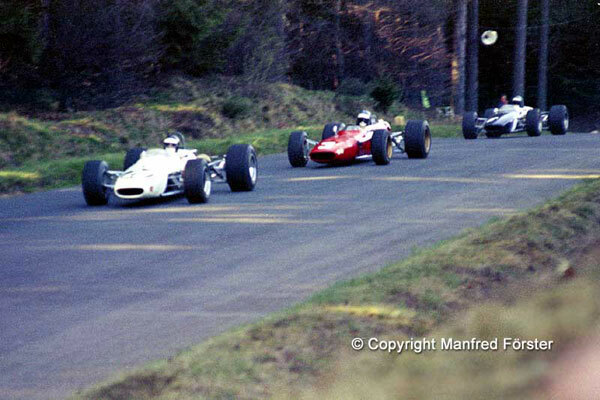 Hill managed to keep Rindt behind him third, while fourth place fell to Ickx. 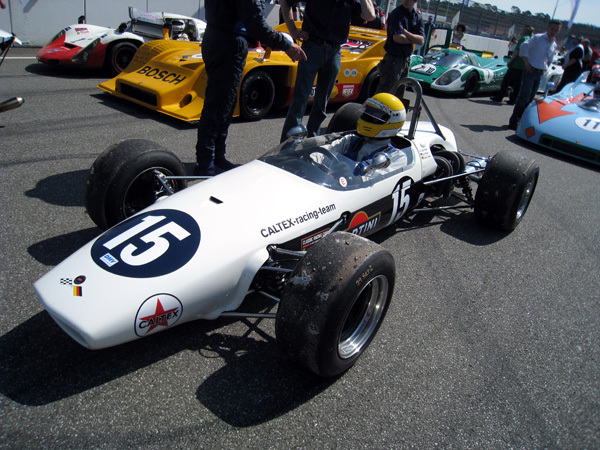 It was Stewart's greatest Grand Prix victory while Kurt Ahrens ended in 12th position despite a reversed spoiler. 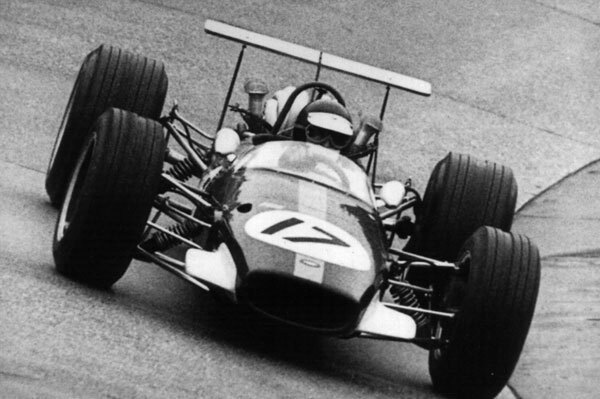 despite a broken rear spoiler, lifting the back of his Brabham-Repco BT 24. 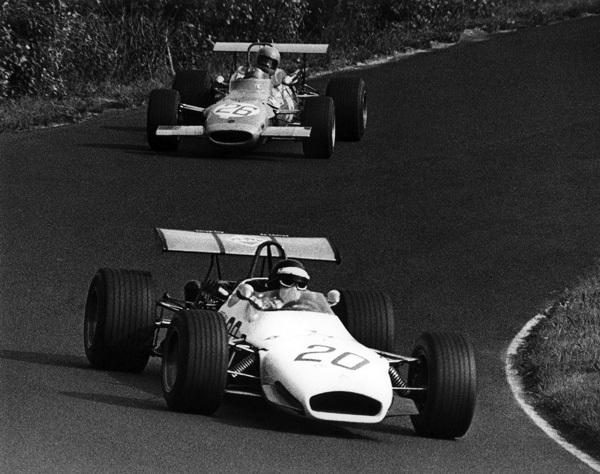 Kurt Ahrens Jr. (Brabham BT 23C), on his way to second place, leads Jacky Ickx in the Ferrari. 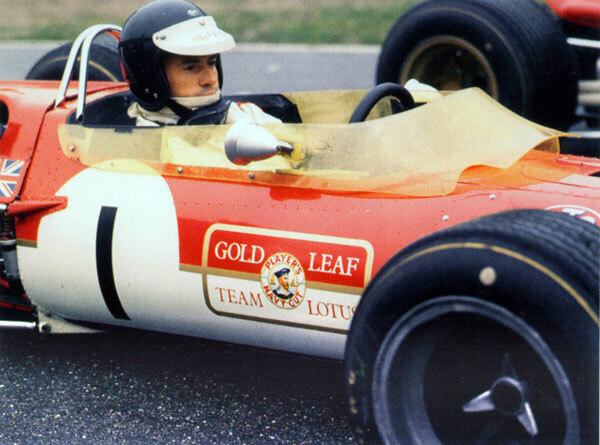 Kurt Ahrens Jr and his father (background) watch as Jim Clark climbs into his F2 Lotus 48 during Saturday practise. 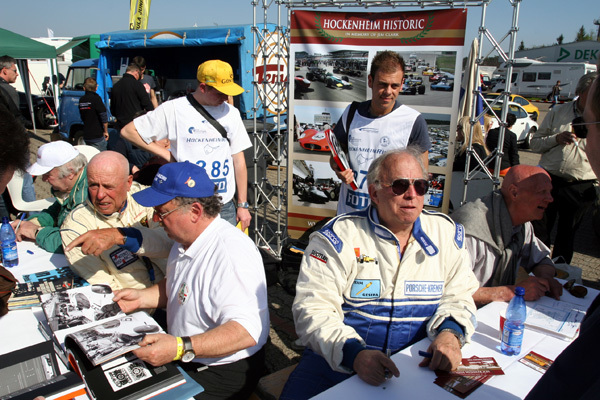 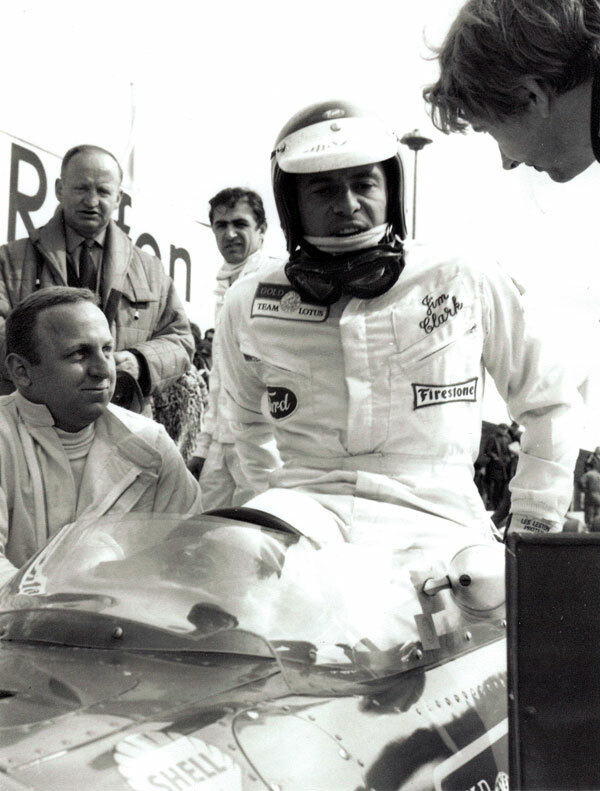 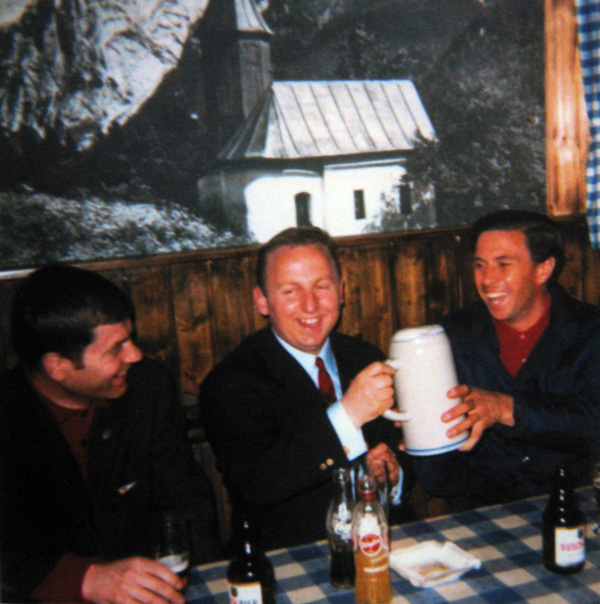 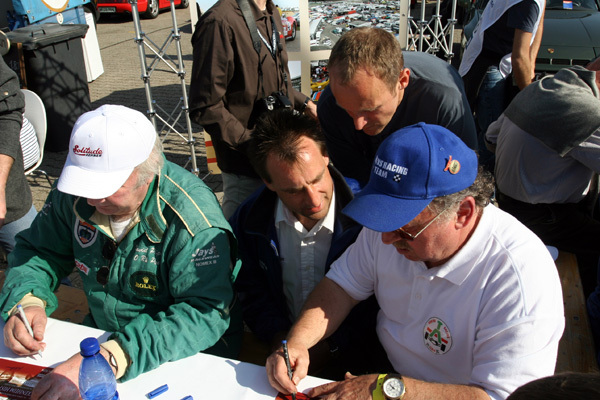 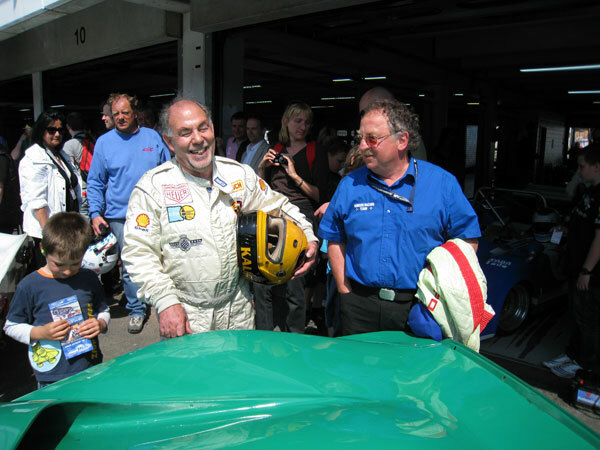 From left to right: Eckhard SCHIMPF, Kurt AHRENS and Jim CLARK. 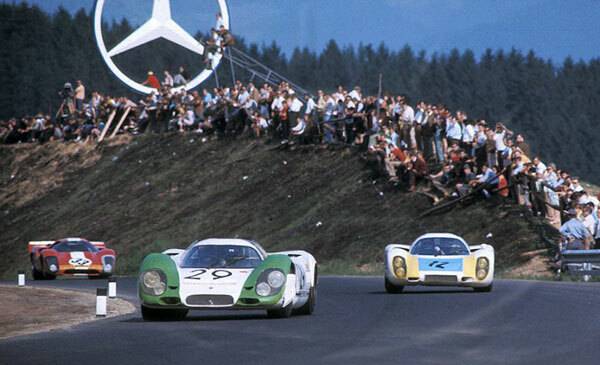 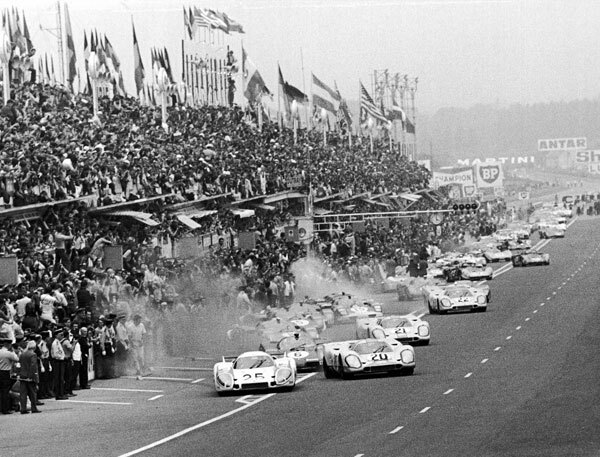 The first of many victories for the fabulous Porsche 917 (left, with race number 29) in the hands of Jo Siffert and Kurt Ahrens Jr. 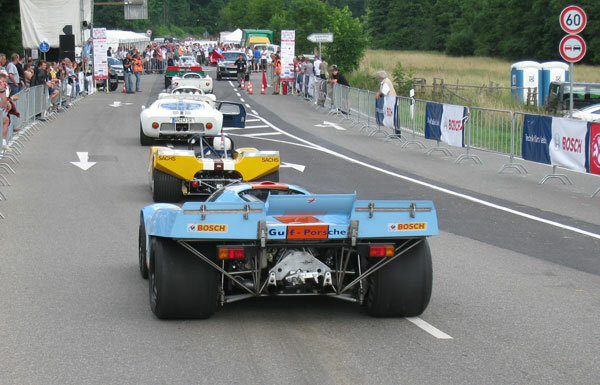 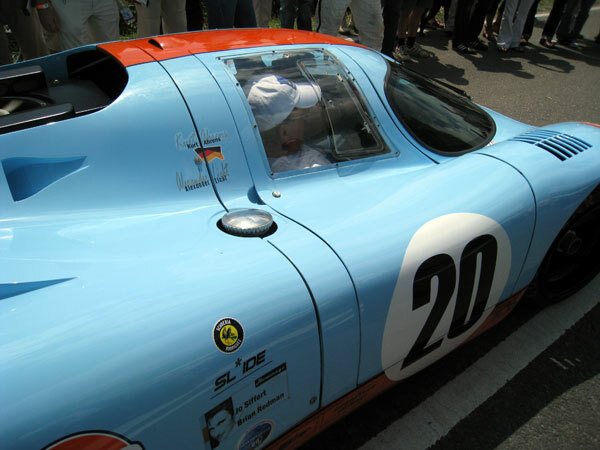 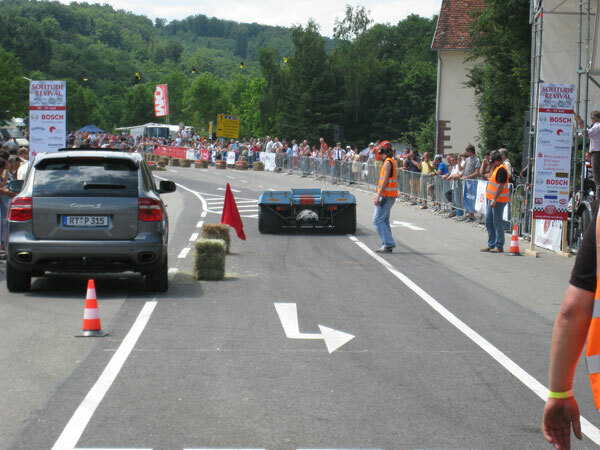 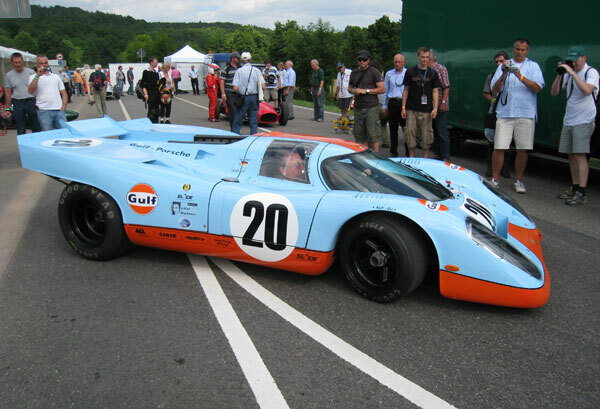 The winning car is leading Jacky Ickx´ Gulf Mirage M3/300 Ford. 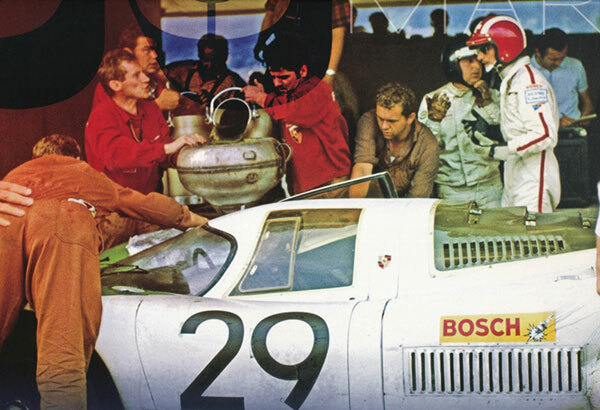 Ricco STEINEMANN, Jo SIFFERT, Helmuth BOTT, Kurt AHRENS JR and Kurt AHRENS Sr celebrating the first victory of a Porsche 917. 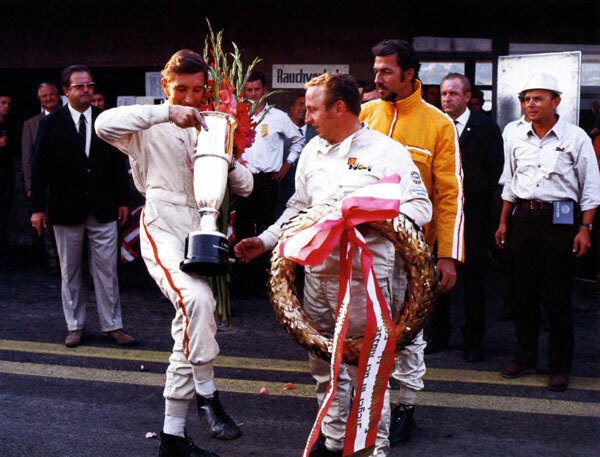 Jo SIFFERT and Kurt AHRENS celebrate their victory. 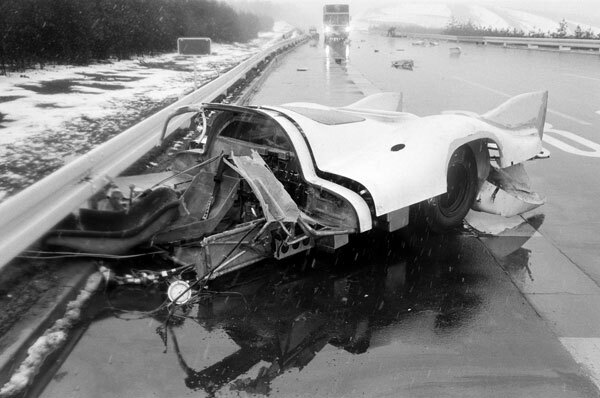 Sadly, Jo was killed two years later while driving his Yardley-BRM in the 1971 Race of Champions at Brands Hatch. 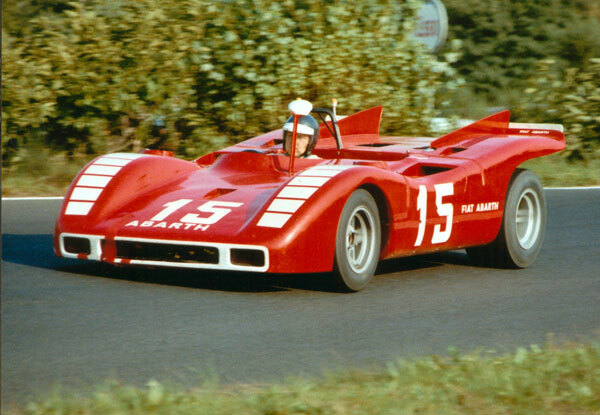 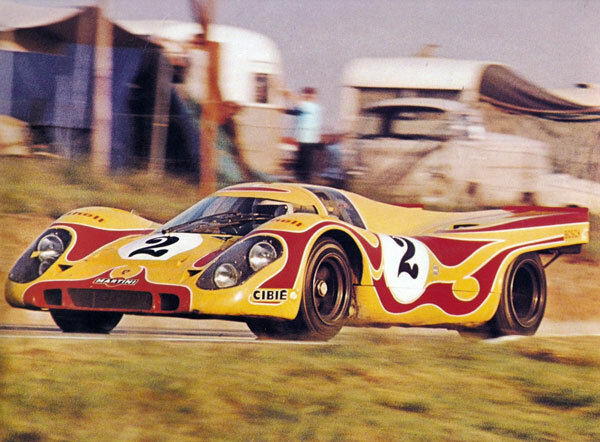 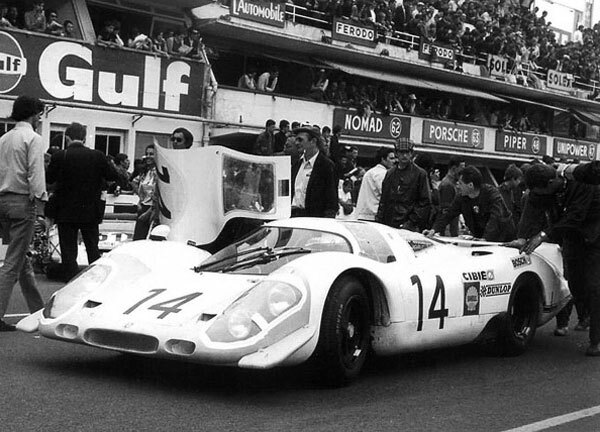 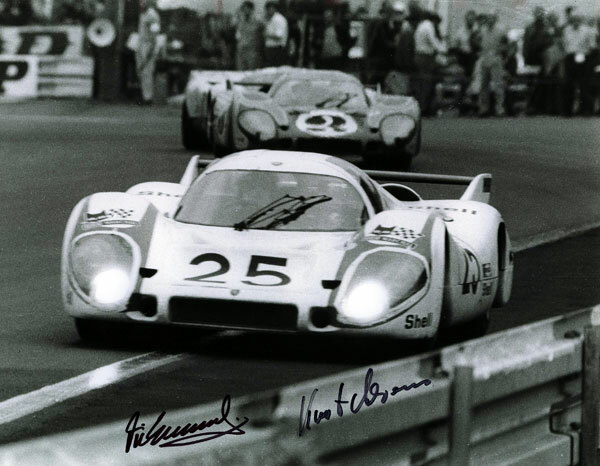 The car was driven by Germans Rolf Stommelen and Kurt Ahrens during the 1969 24 Hr race at Le Mans (Pole position). 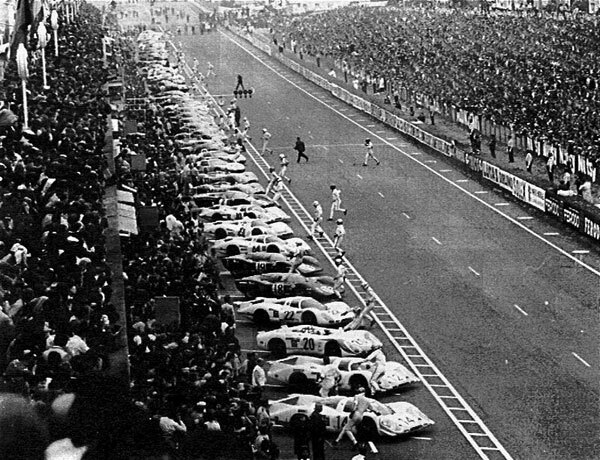 As Ickx was opposed to the traditional Le Mans start which he considered to be dangerous, he slowly walked across the track to his machine,instead of running. 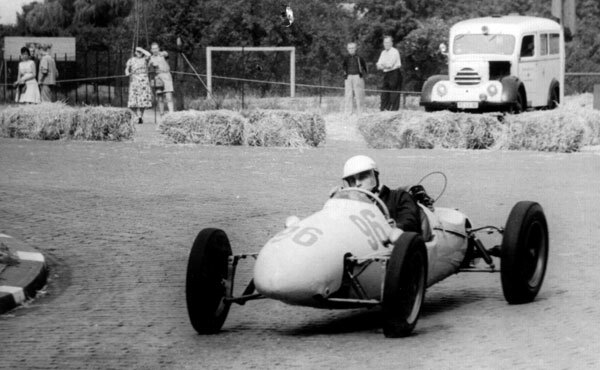 He locked the safety belt carefully and thus was the last to start the race, chasing the field. 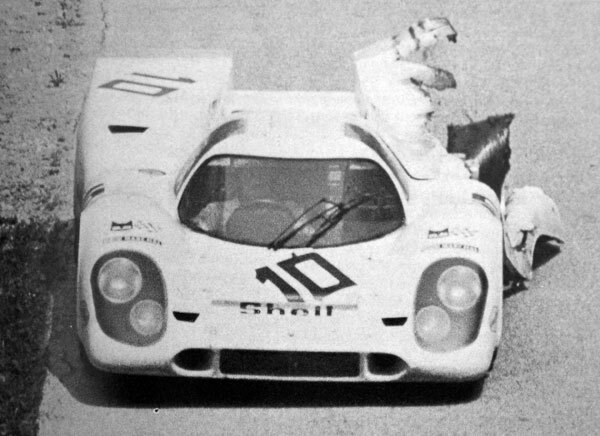 On lap one, a tragic event proved that Ickx was right: private driver John Woolfe had a fatal accident in his new and powerful 917 and fellow countryman Willy Mairesse had an accident which ended his career. 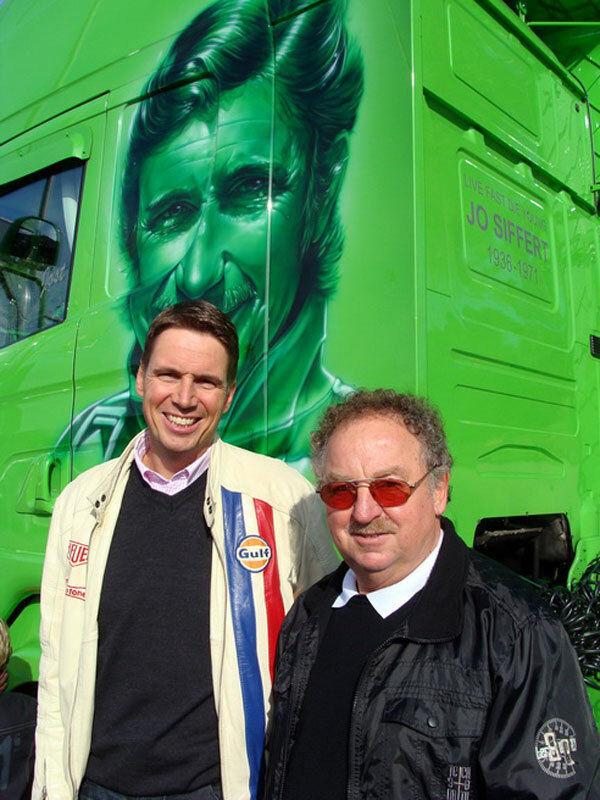 Neither of them had taken time to belt himself in. 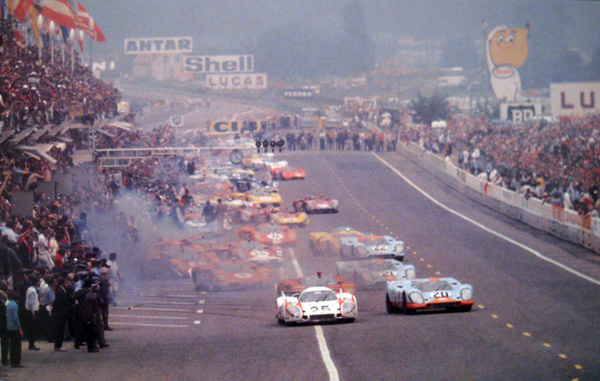 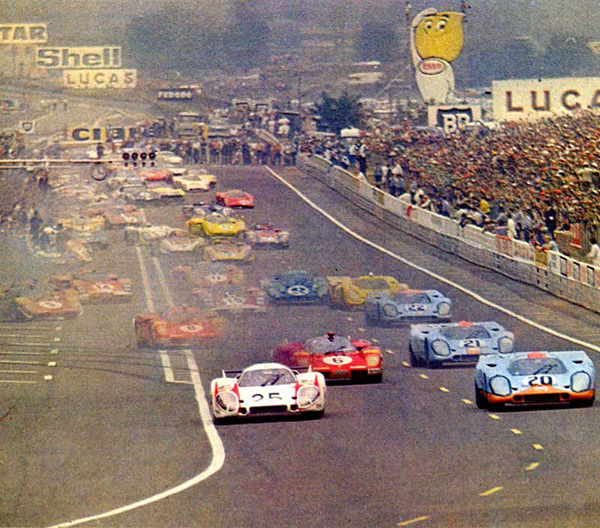 Rolf Stommelen leads the field after the start heading for "the Esses". 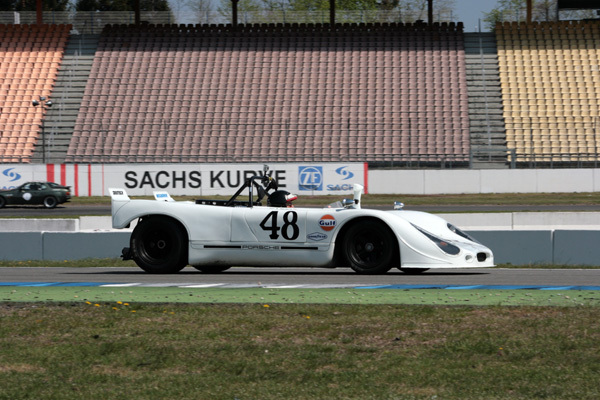 Kurt Ahrens accelerates through the Mulsanne corner. 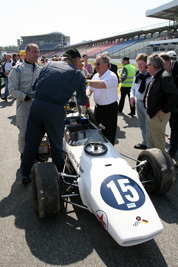 After 128 laps, the 4,5 litres flat 12 was put out of the race by clutch bell housing problems. 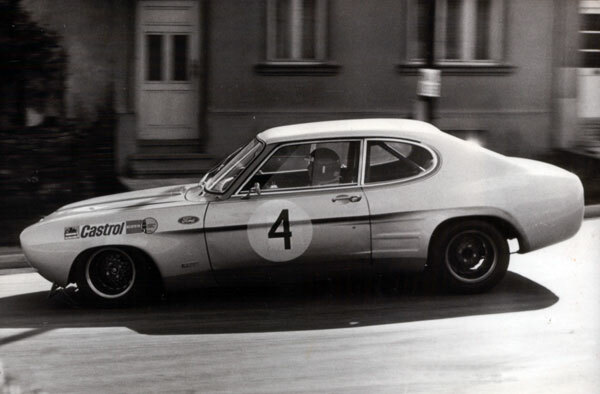 Kurt Ahrens shared this car with "Quick Vic" Elford but abandonned shortly before half distance. 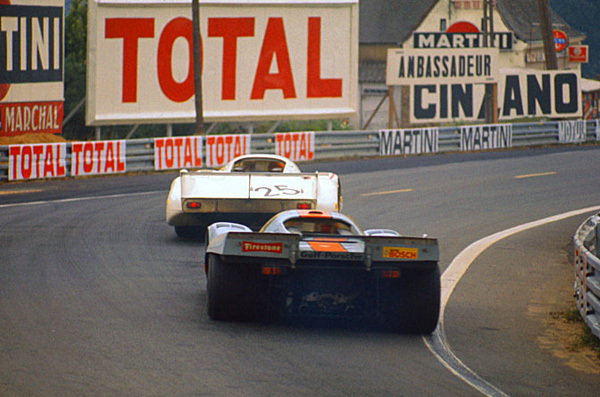 Overtaking a slower back marker on the inside. 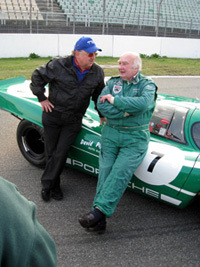 Porsche 917 with Vic Elford. 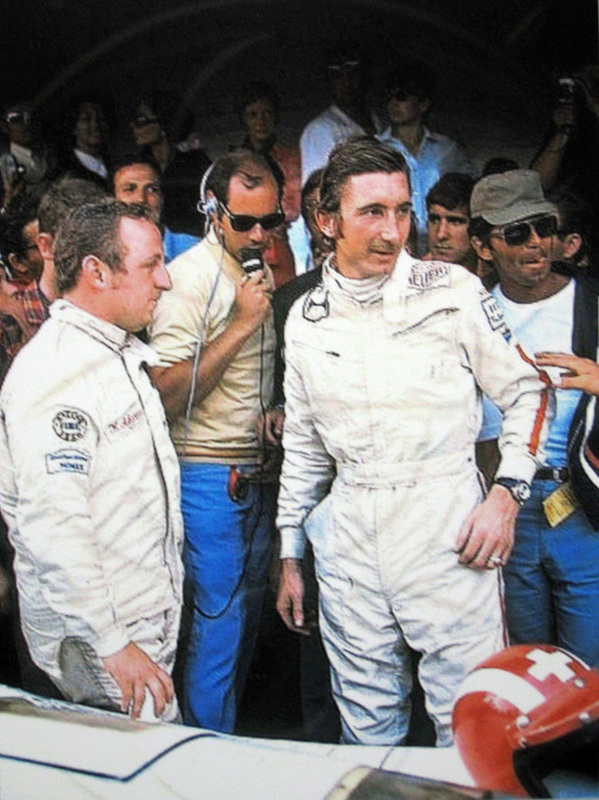 Jo Siffert in hot persuit of Kurt Ahrens will end the race in second position. 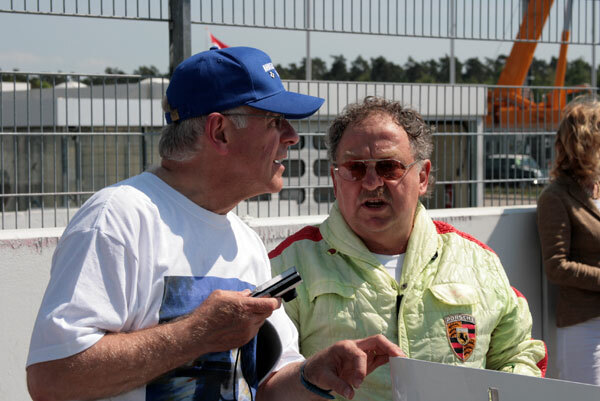 Kurt Ahrens and Vic Elford discussing racing tactics during practise. 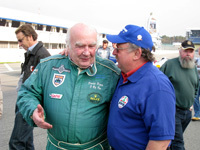 Vic Elford and Kurt Ahrens Jr.prepare for the race. 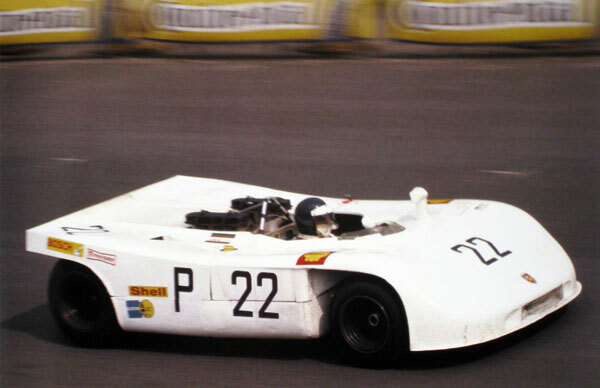 The winning Porsche 908/03 of Elford-Ahrens. 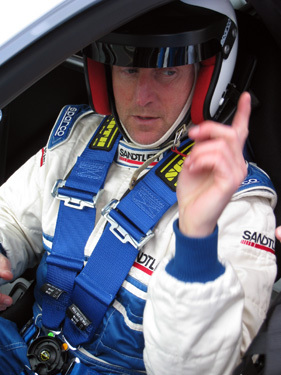 Kurt at the wheel. 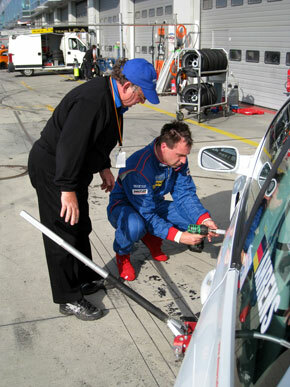 Kurt giving a helping hand to his mechanics during practise. 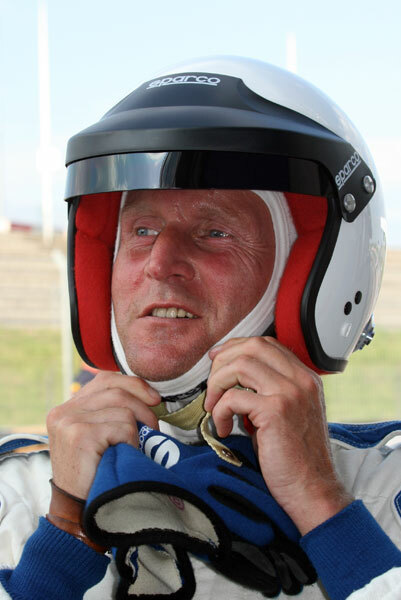 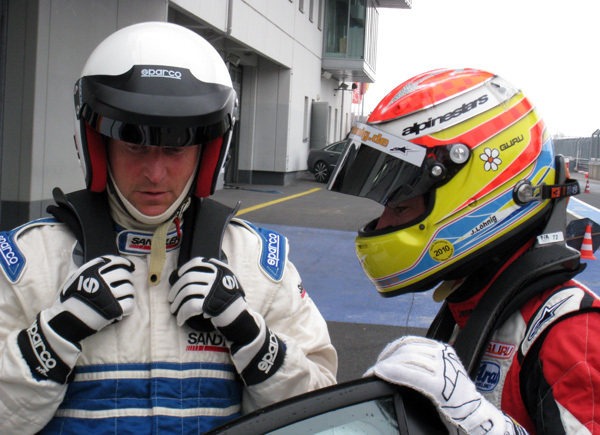 Fastest lap (during the night and in the rain) and pole position for Kurt Ahrens at an average speed of 242, 685 km/hr!. 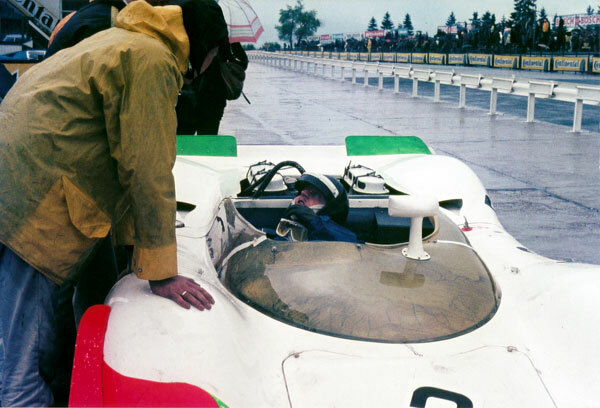 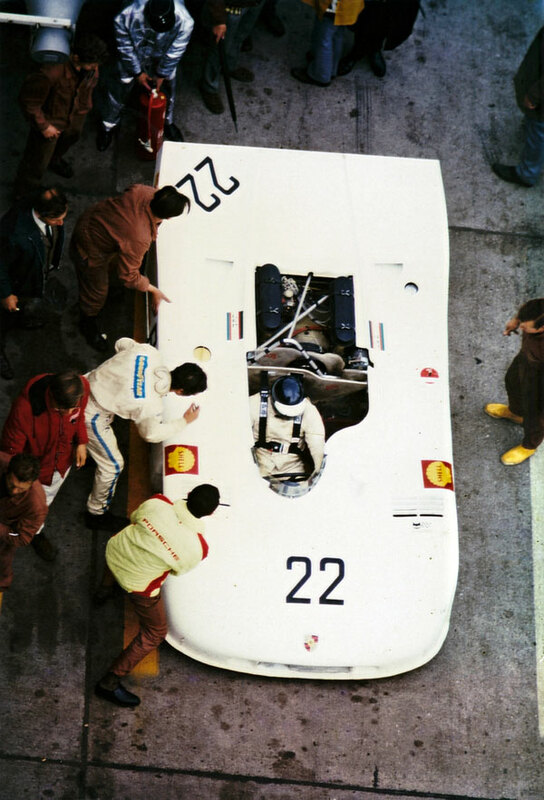 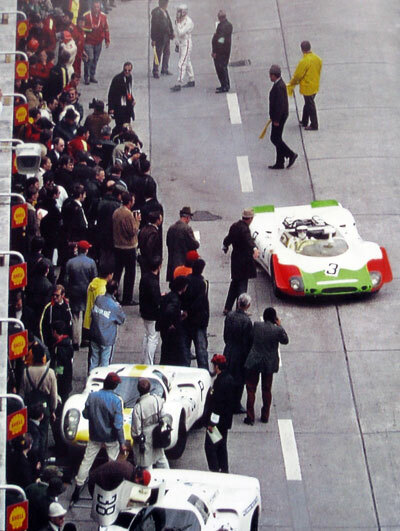 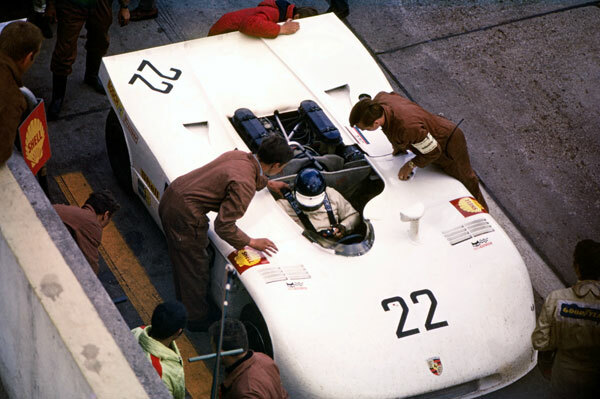 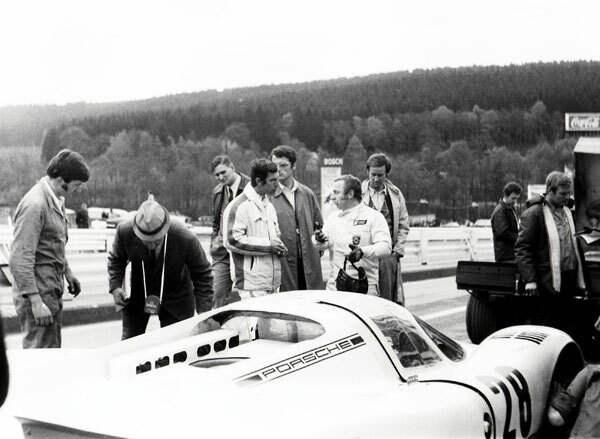 Porsche 917 LH is pushed to his start position in front of the grid (engineer Peter Falk on the left). 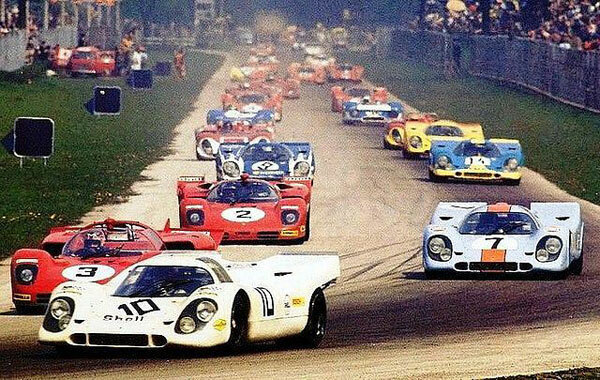 Vic blasts away from pole position in the long tail 917, leading the three short tail Gulf-Porsches 917 of Jo Siffert (20), Pedro Rodriguez (21) and David Hobbs (22) and the works-Ferrari's. 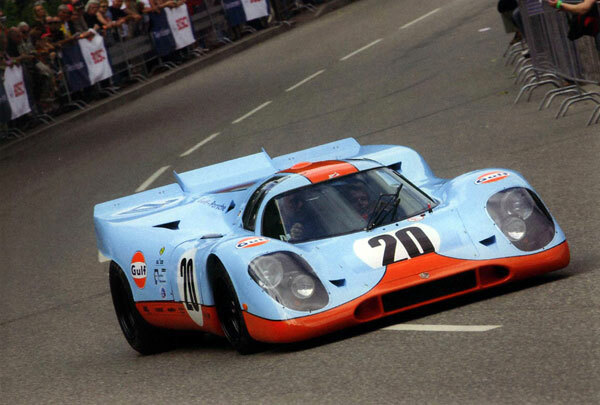 Jo Siffert (Gulf-Porsche 917) in hot persuit of Vic Elford in the 917 "Langheck". 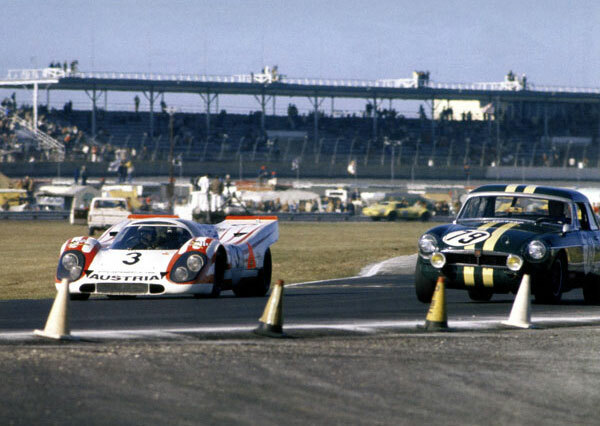 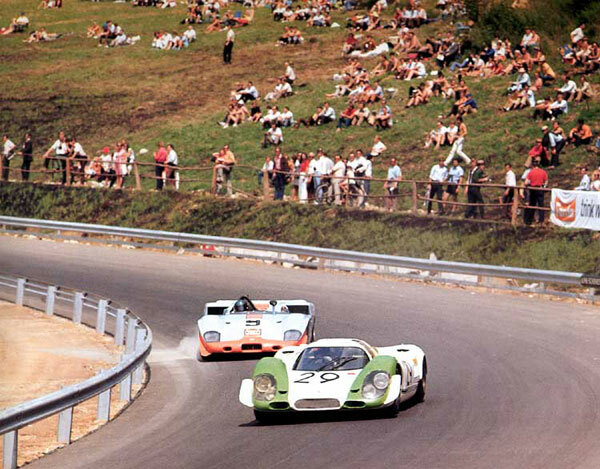 The Elford-Ahrens Porsche 917LH followed by its sister car of Kauhsen-Larrousse and the Siffert-Bell Porsche 917K. 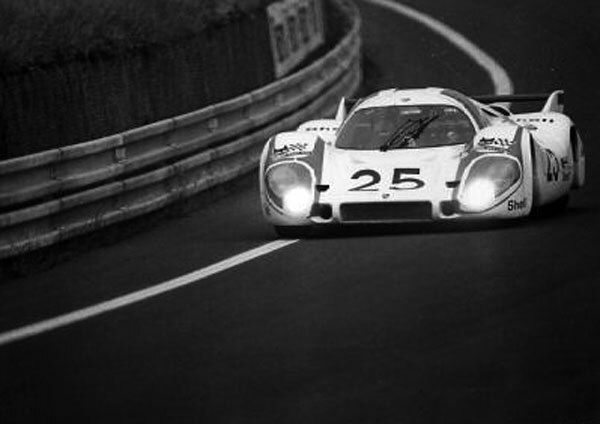 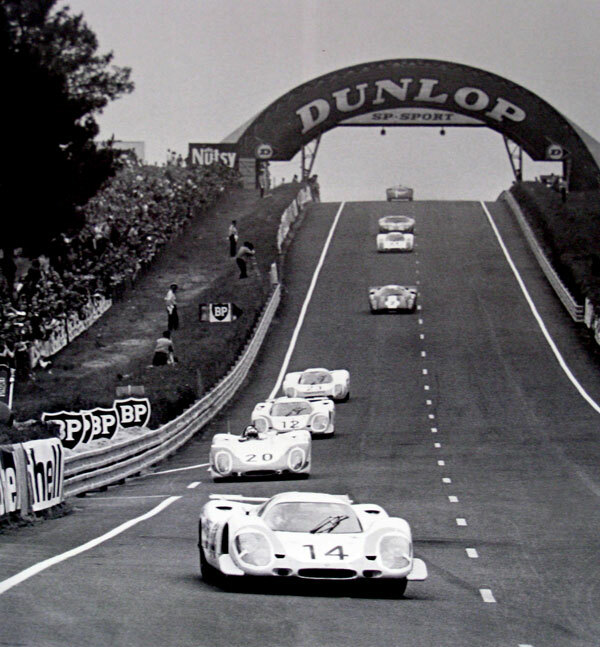 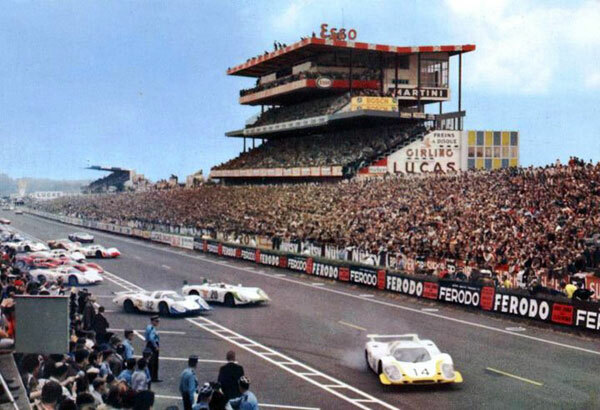 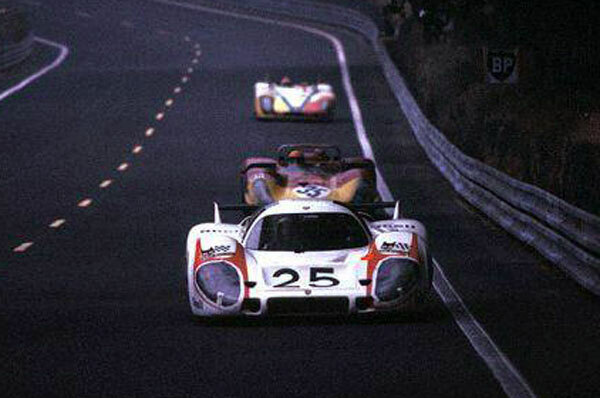 Coming up the Mulsanne straight where the Porsche 917 LH had been clocked at over 380 Km per hour! 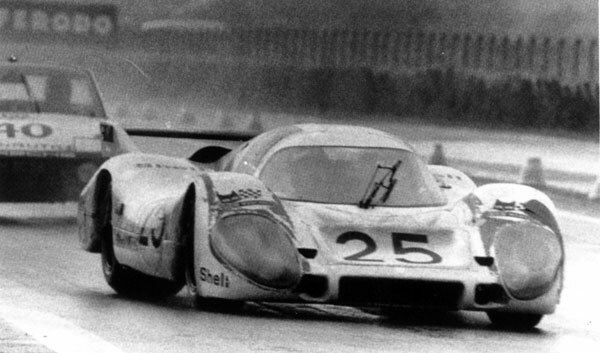 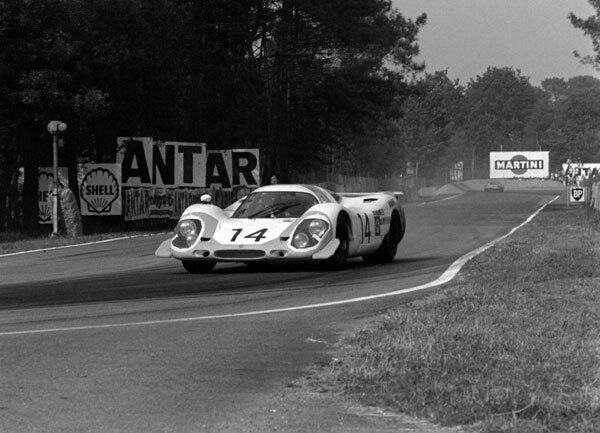 The leading Elford-Ahrens Porsche 917LH fishtailing through a corner at high speed while setting up a new lap record. 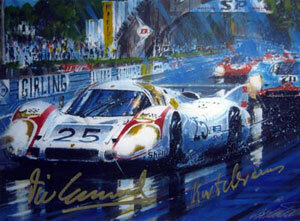 Beautiful paintings by Nicholas Watts (l) and Roger Warrick (r). 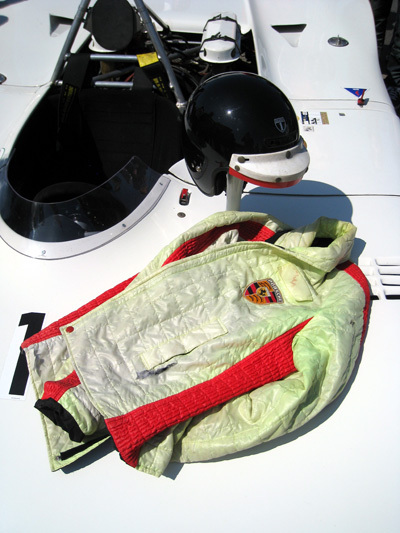 the white unforgiving 'Lang Heck' was forced into retirement. 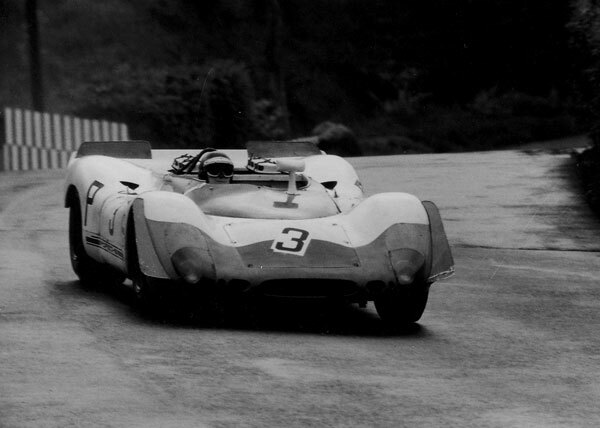 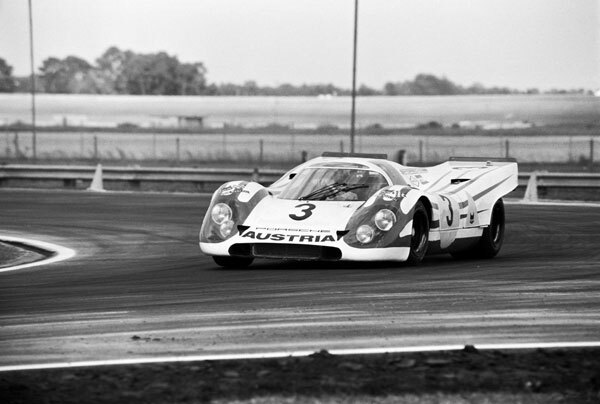 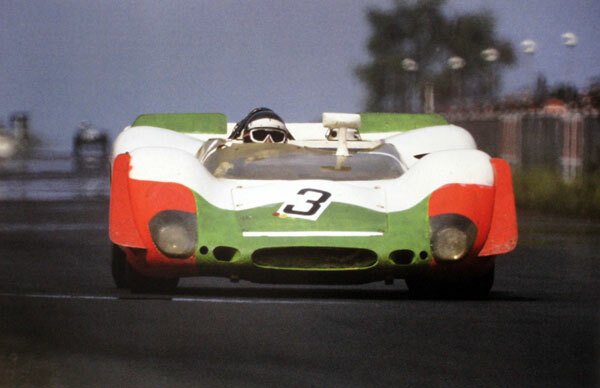 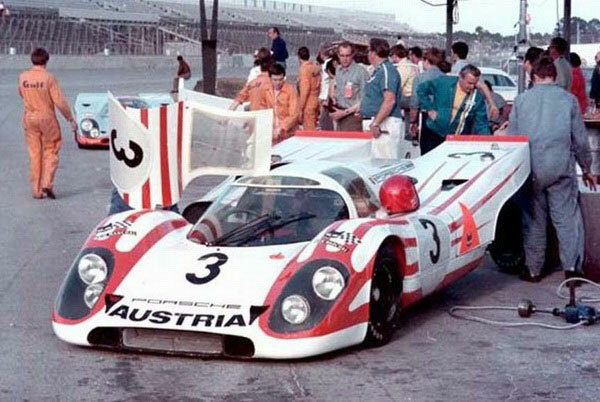 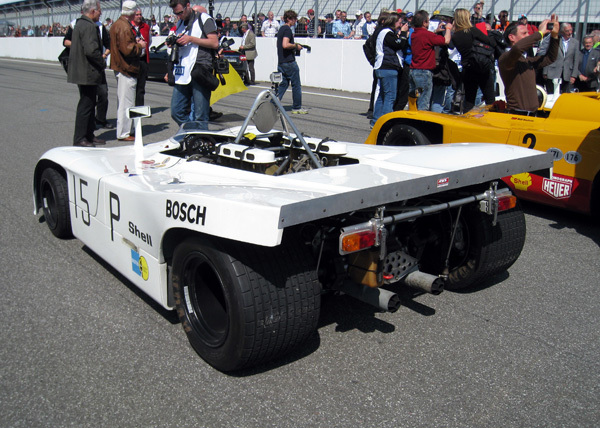 The No 3 car eventually finished in second position behind the winning 917 or Richard Attwood and Hans Herrmann. 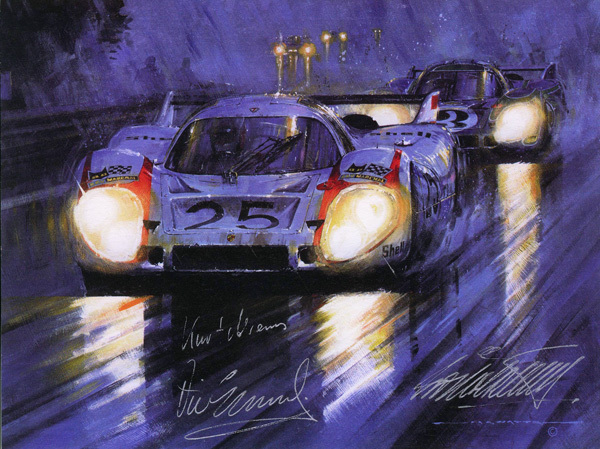 signed by the artist Nicholas WATTS and the drivers Kurt AHRENS and Vic ELFORD. 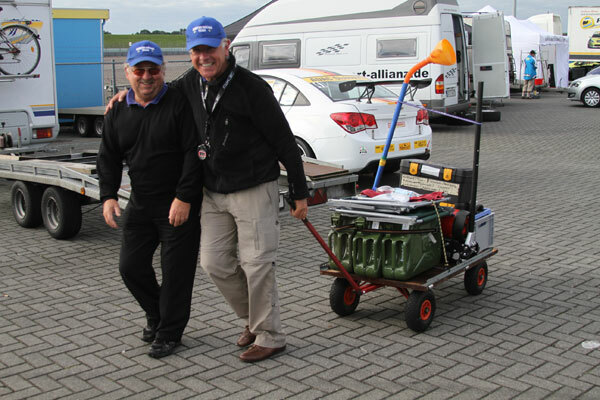 Kurt and his team mate Vic Elford struggeling with suspension problems. 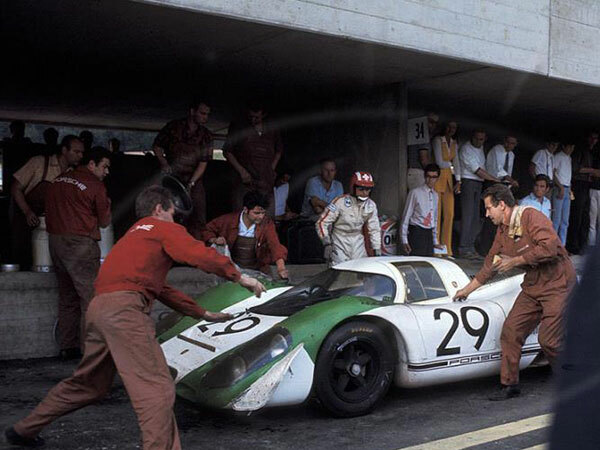 Late in the night before the race, the mechanics managed to solve the problem and Vic tested the car on the track in the dark to find out that the Porsche was competitive. 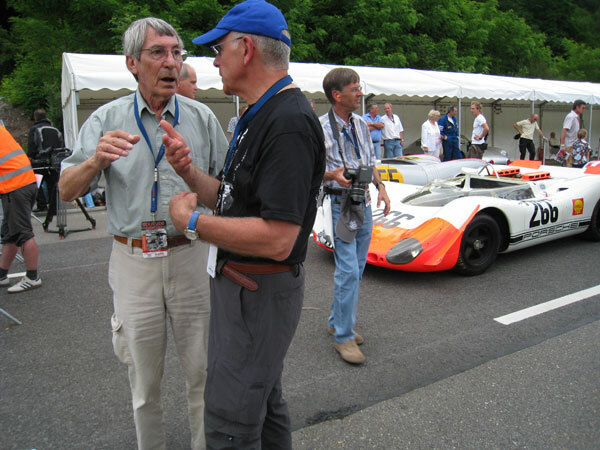 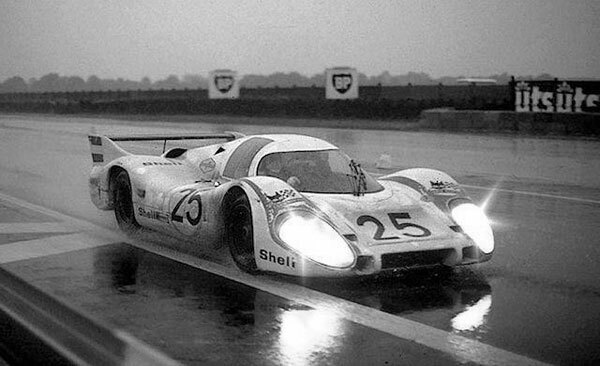 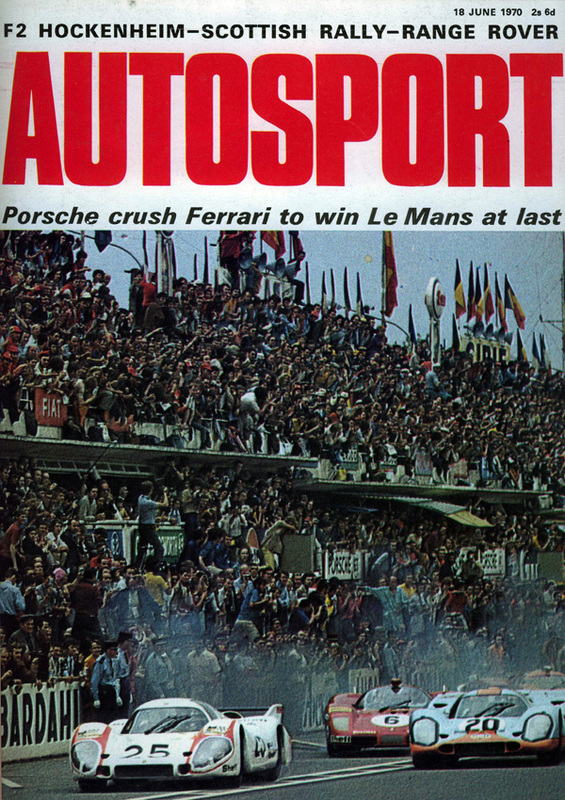 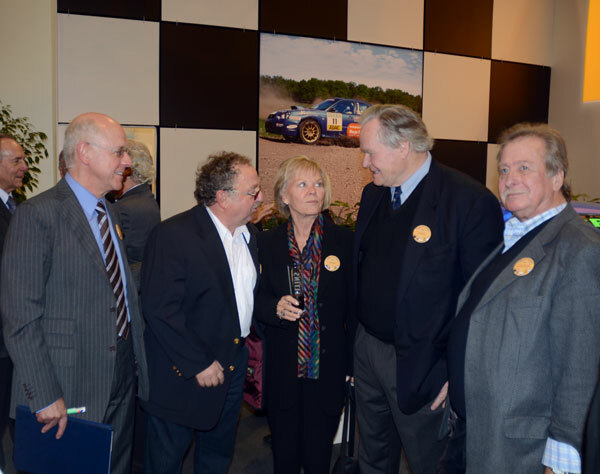 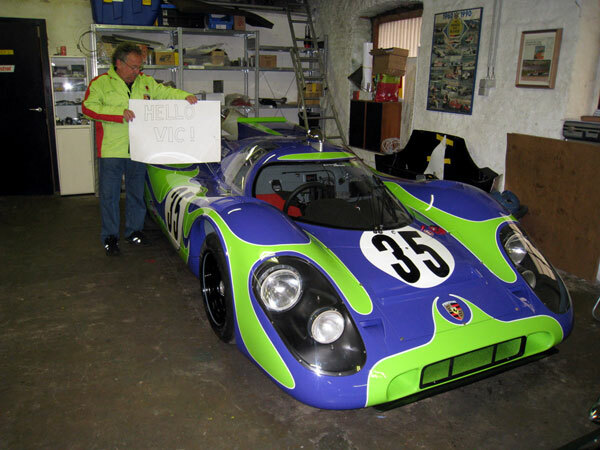 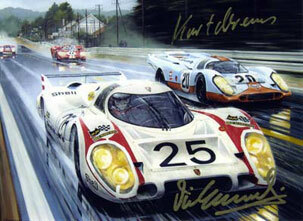 Kurt shared again the Porsche 917 with Vic Elford. 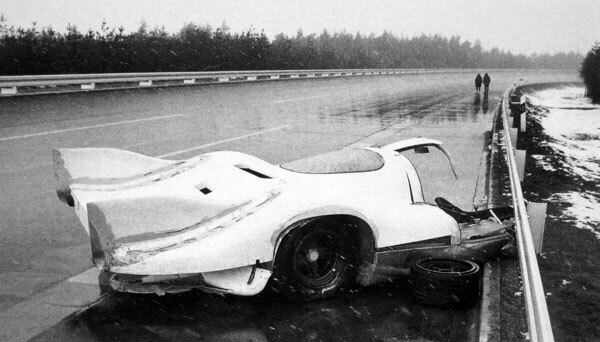 With Kurt at the wheel, a tyre burst at more than 300 km/hr brought an end to the race. 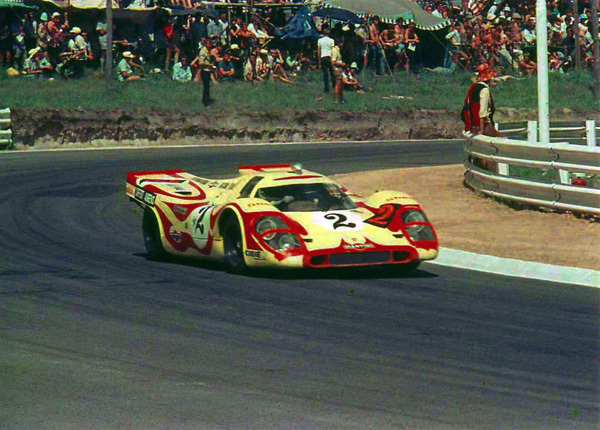 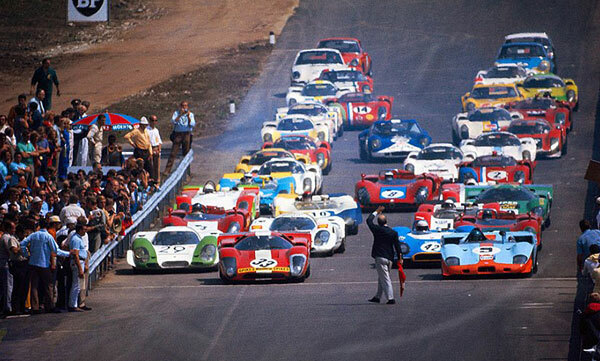 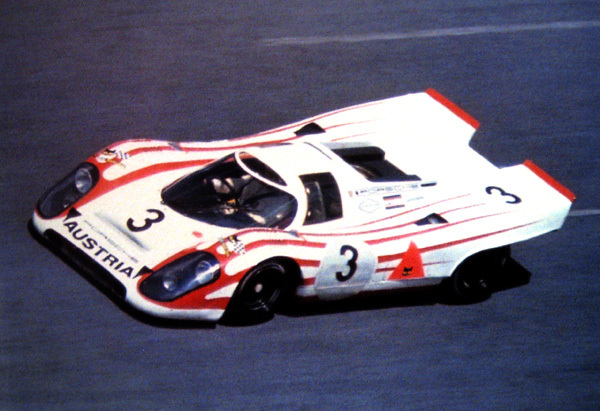 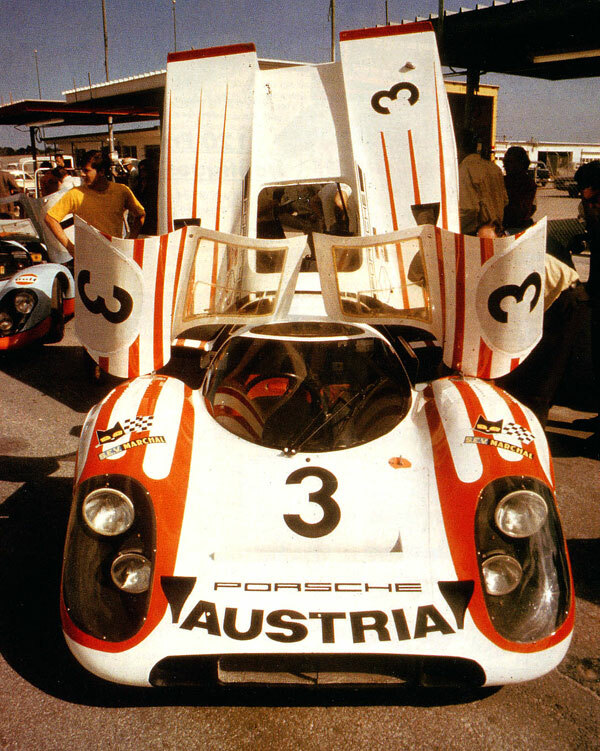 Kurt shared this beautiful MARTINI RACING Porsche 917 with Jo SIFFERT in South Africa. 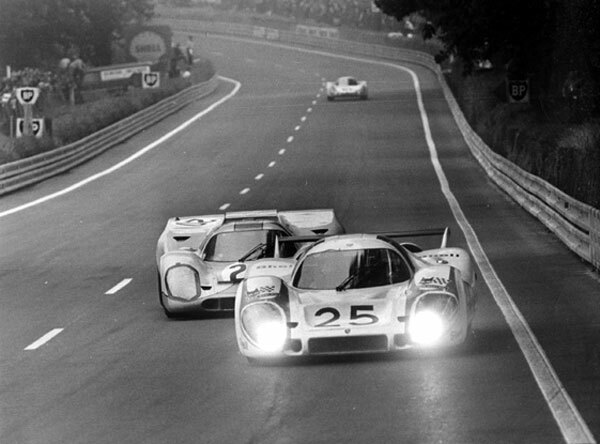 They finished second behind Jacky Ickx‘ Ferrari. 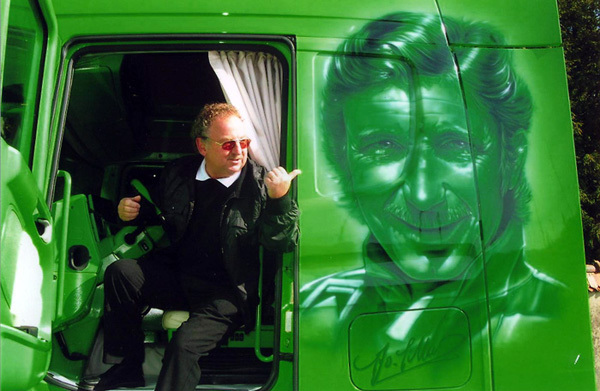 Kurt AHRENS pointing at a beautiful airbrush portrait of his sadly missed friend Jo SIFFERT painted on the cabin of a truck. 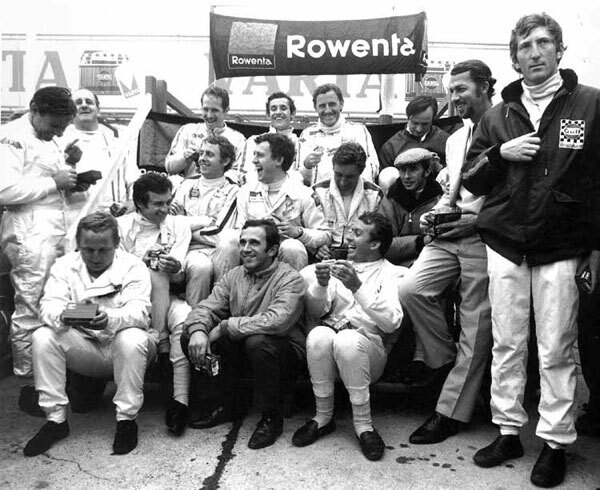 Jo SIFFERT was killed in the 1971 non-championship World Championship Victory Race at Brands Hatch GB, the scene of his first and greatest victory in 1968. 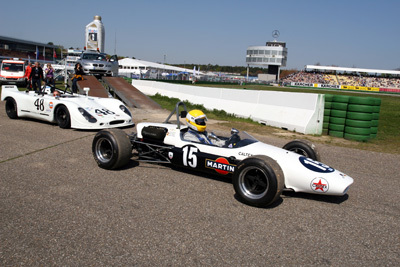 The suspension of his BRM had been damaged in a lap 1 incident with Ronnie Peterson, and broke later. 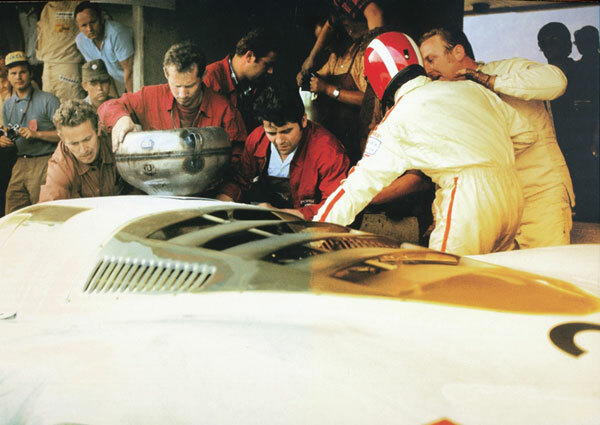 The BRM crashed and immediately caught fire. 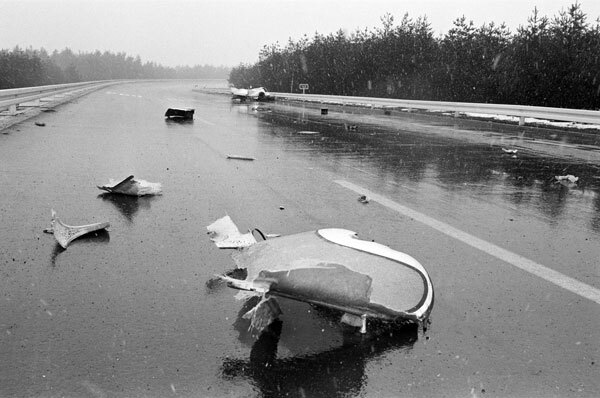 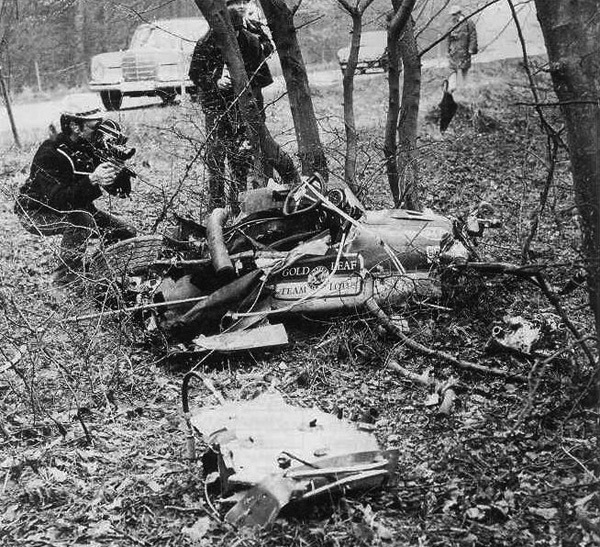 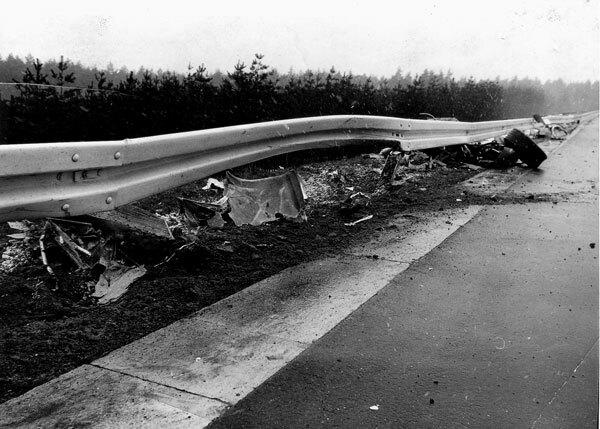 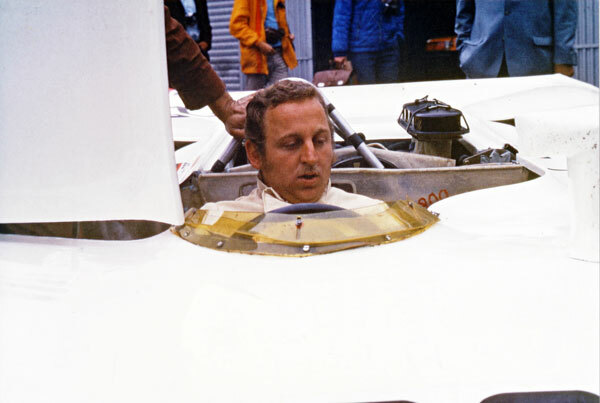 Siffert could not free himself from the burning car. 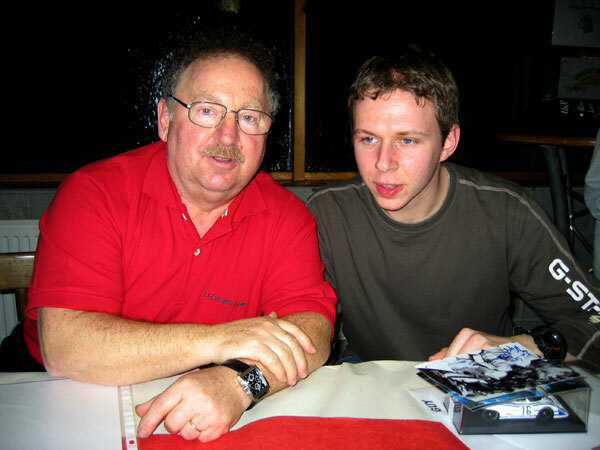 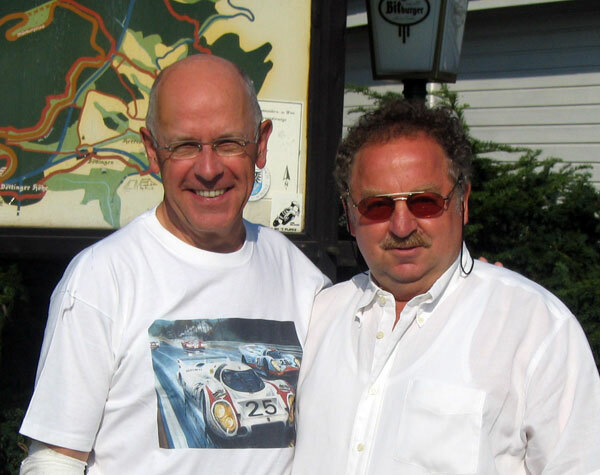 Kurt AHRENS with Philippe SIFFERT, son of "Seppi"
First contact with Kurt Ahrens and his charming wife Reni. 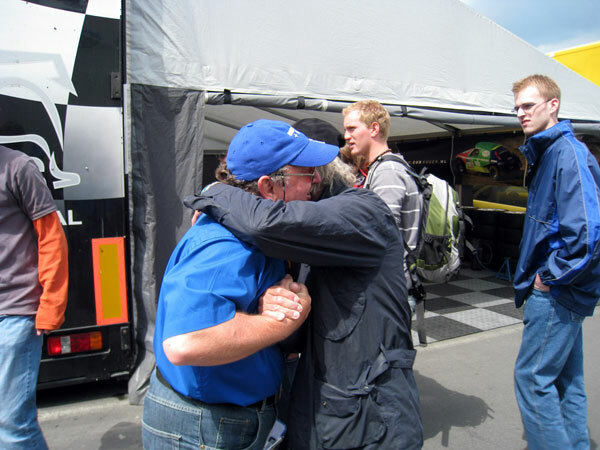 Carlos and Kurt met again after several months. 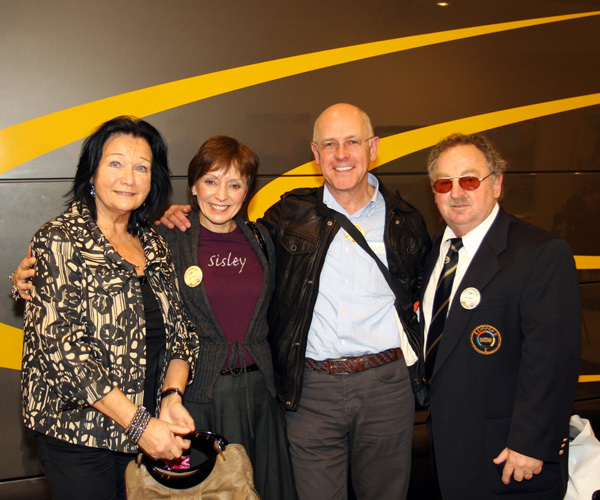 Guy Golsteyn´s wife Danni, Kurt and Reni Ahrens, Marie-Jeanne. 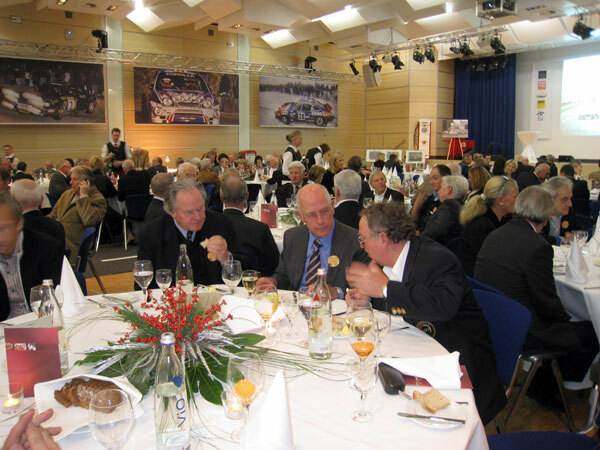 Having dinner after a visit to the circuit. 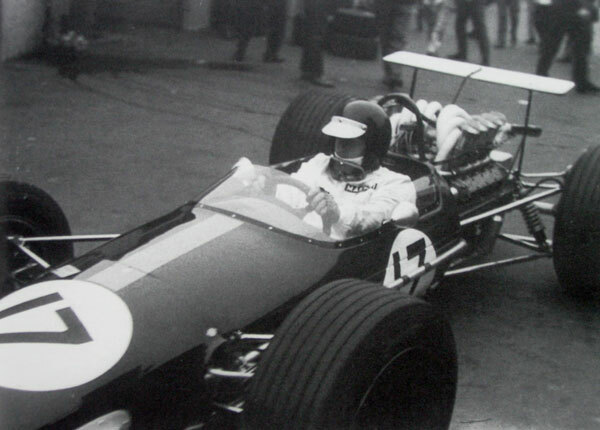 When Carlos first visited Zolder in 1968, Kurt was on the other side of the fence participating in a F2 Brabham. 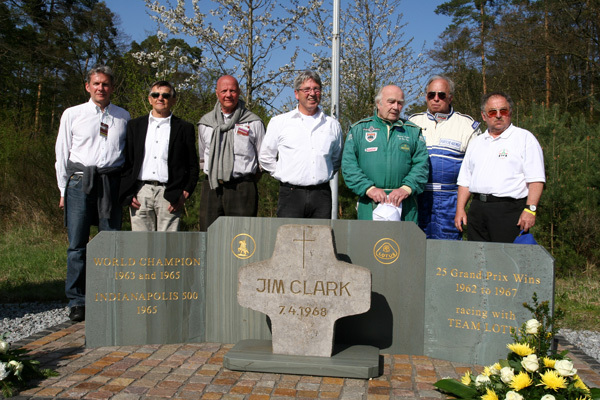 After a short visit to the Zolder circuit, Kurt, Reni, Marie-Jeanne and Carlos paid a visit to Guy Golsteyn and his wife Danni at their home in Veerle-Laakdal. 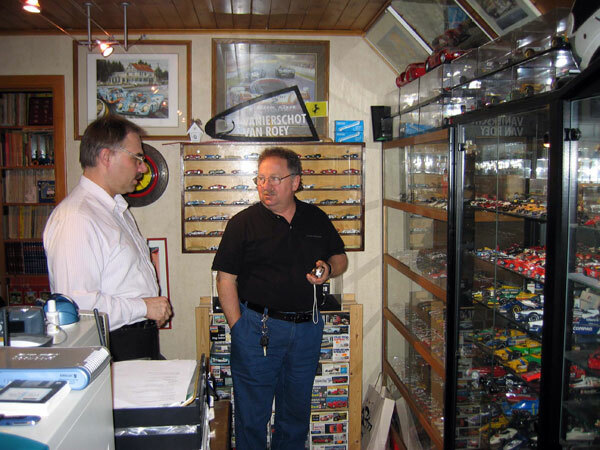 Guy is a very talented model builder and Kurt was impressed by the hundreds of scale models. 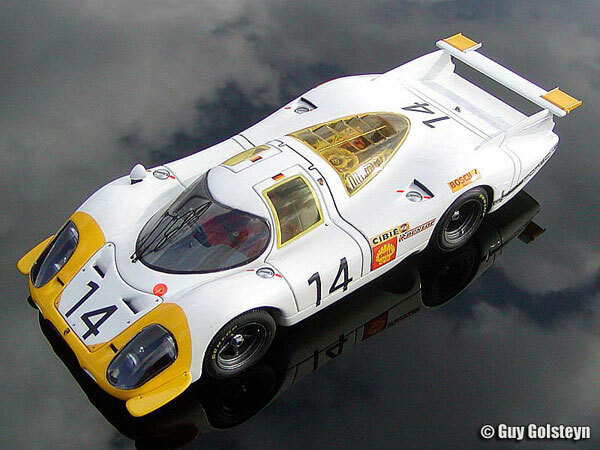 beautiful 1/18 scale model, made by Guy. 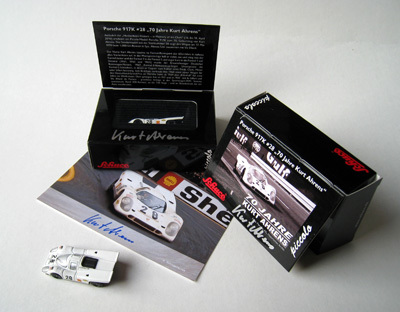 Kurt Ahrens was especially touched by the model of his 1969 Porsche 917LH, that Guy had hastily prepared for the occasion. 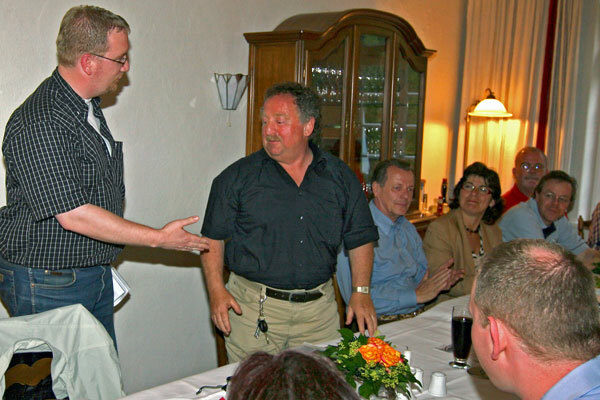 At Svens' birthday party where Kurt overloaded a speechless Sven with some additional presents. 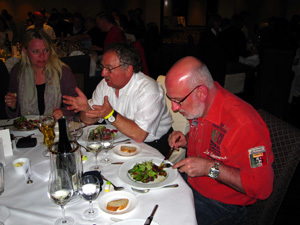 no wonder he's a much solicited man to act as a guest or speaker on many events. 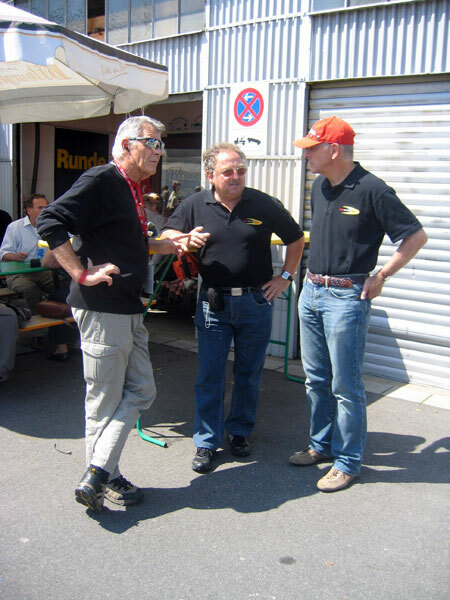 Rainer Braun, Kurt Ahrens and Carlos Ghys in front of Kurt´s former garage (number 4) in the old paddock of the Nürburgring. 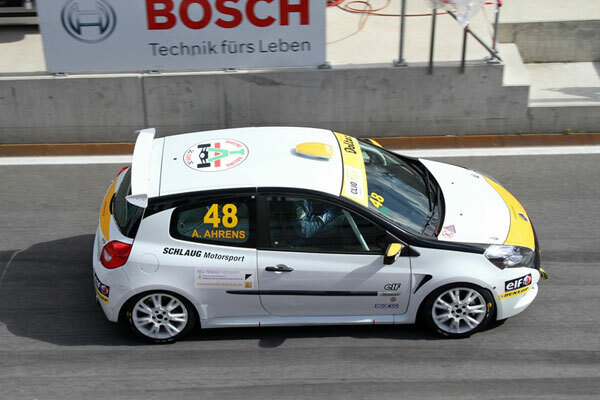 Like his grandfather Kurt Ahrens Sr. and his father Kurt Ahrens Jr., Alf is on his way to make a name in the German national motor sport. 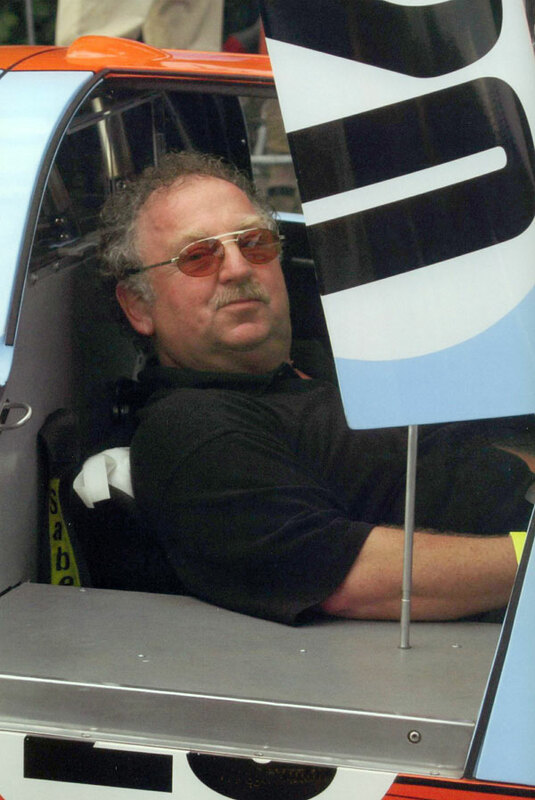 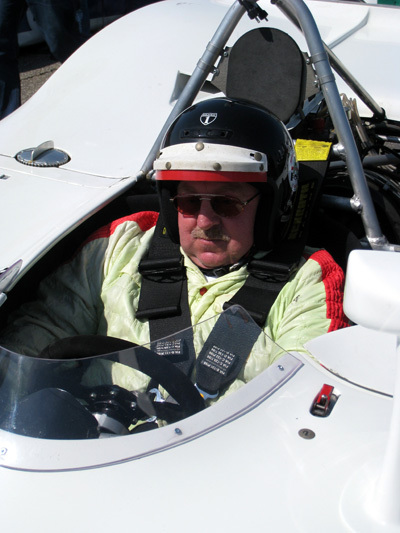 He drove in several singleseater races and obtained his national A-license. 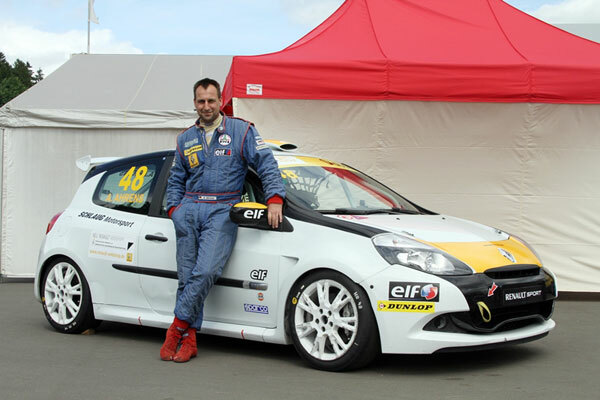 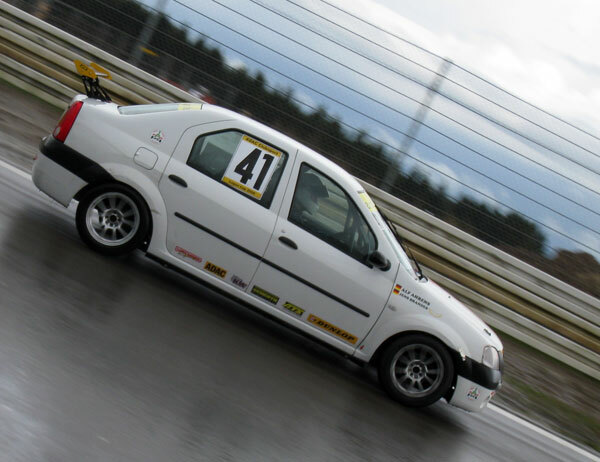 Alf owns a Renault Clio Sport V6 and considers his racing as a hobby. 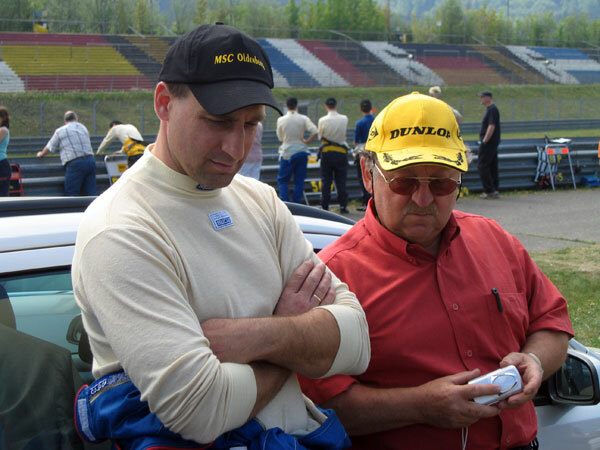 Sometimes his brother Mike joins him in long distance races. 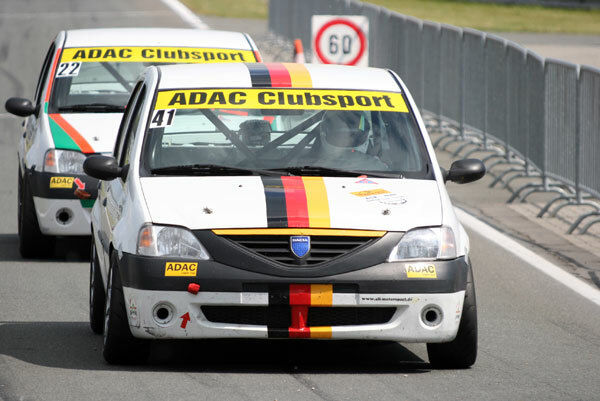 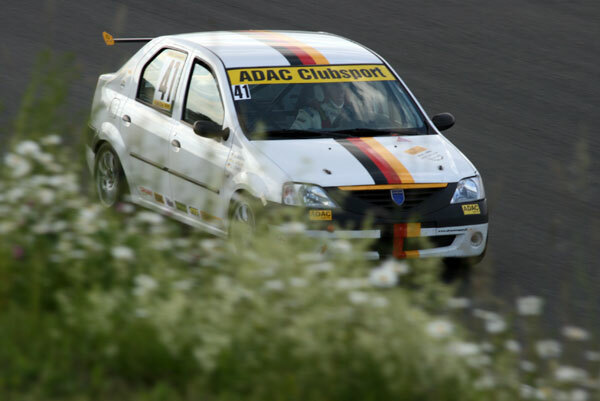 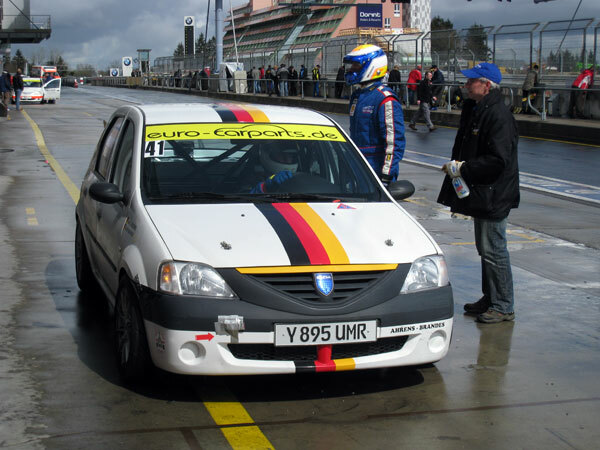 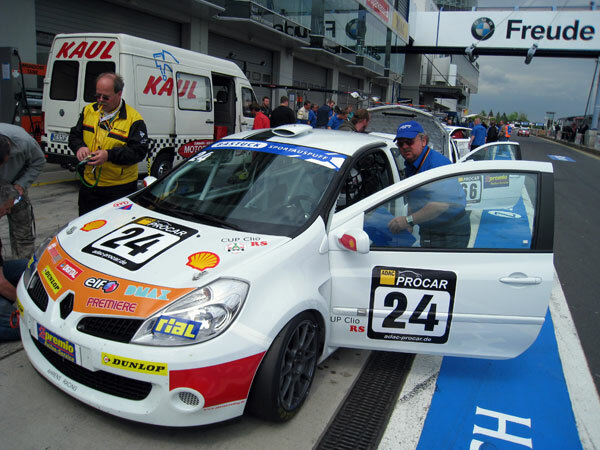 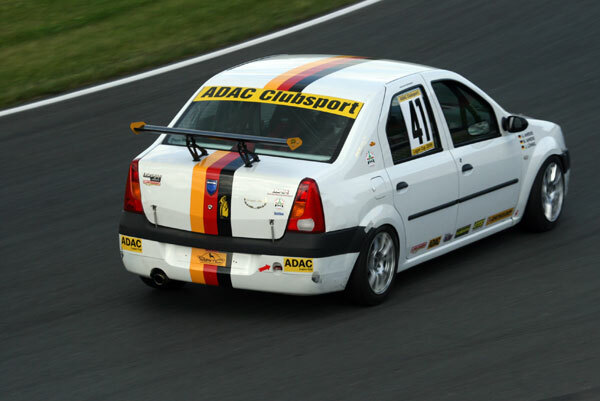 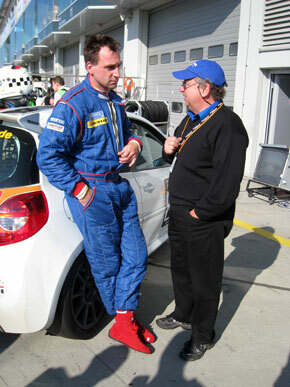 In 2007, on several occasions, Alf showed his talent in the national Dacia Logan Cup. 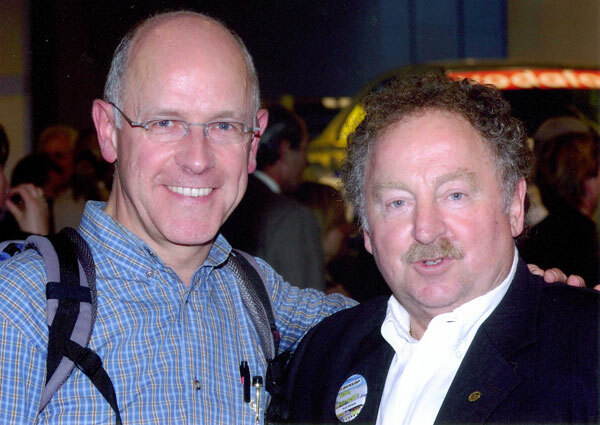 You can follow his progress through his personal website (see link Kurt Ahrens). 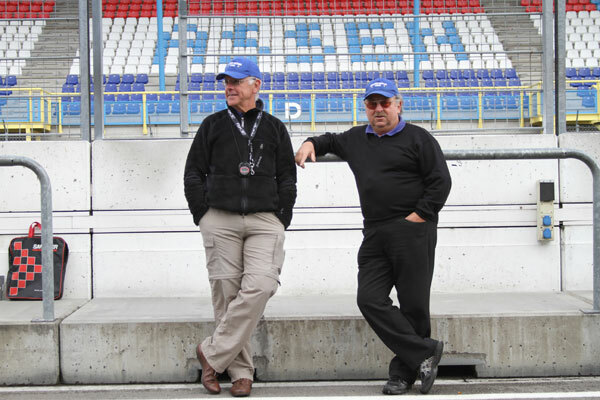 Like father, like son: Alf is getting some advice from his father Kurt. 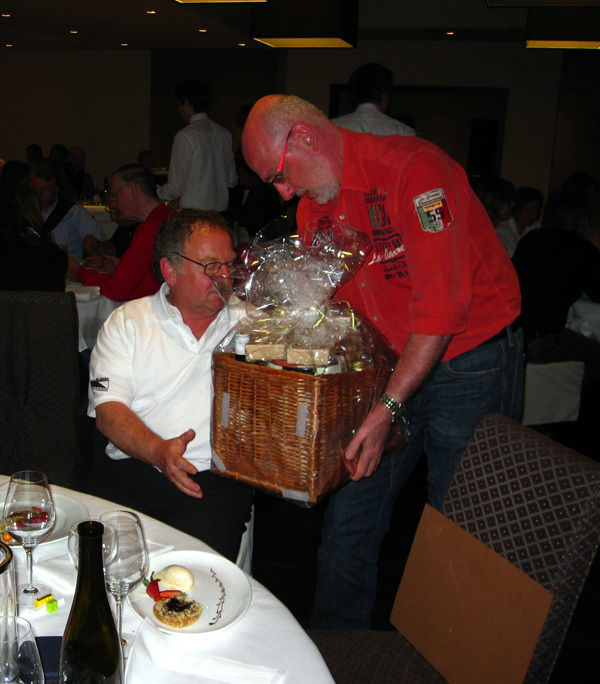 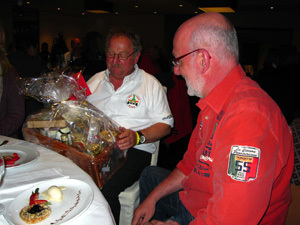 Winning team, Alf AHRENS and Jens BRANDES. 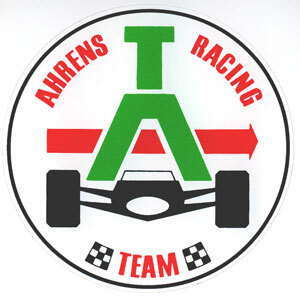 At the end of the season, Team AHRENS was crowned 2008 Cup Champion. 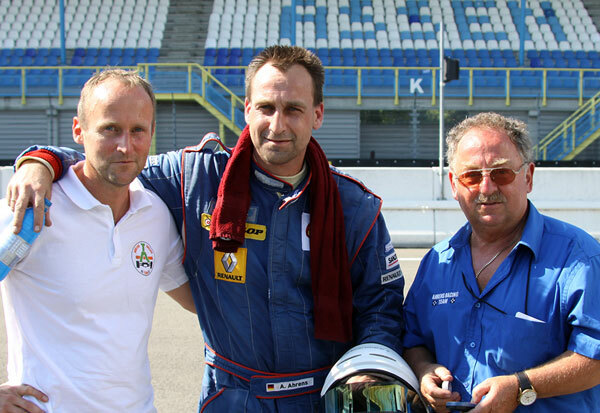 Alf AHRENS posing with his father Kurt and Carlos. 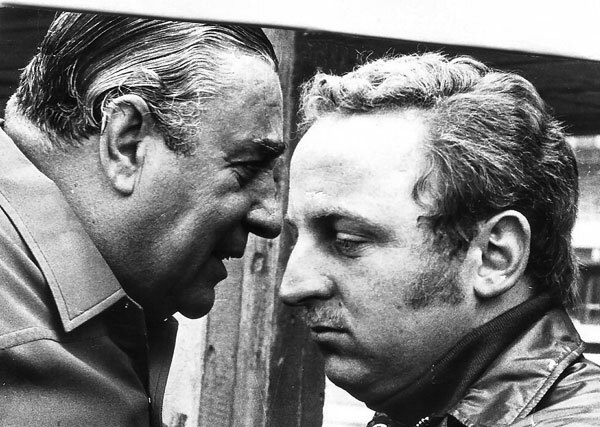 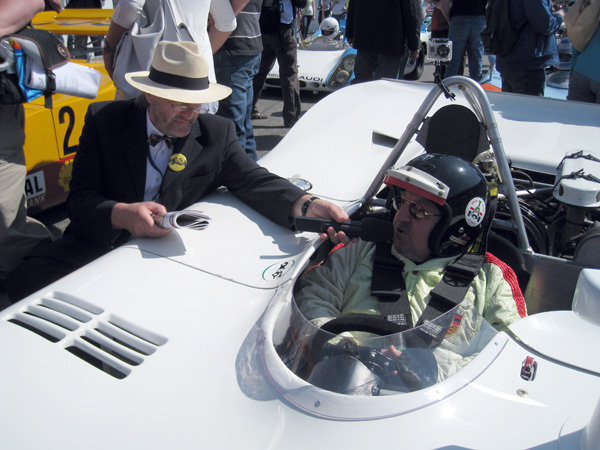 Alf is given some last instructions from his father at the NÜRBURGRING. 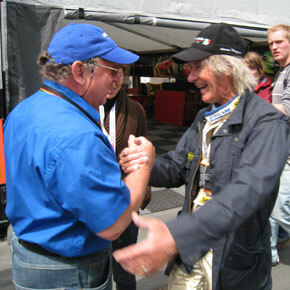 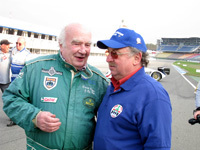 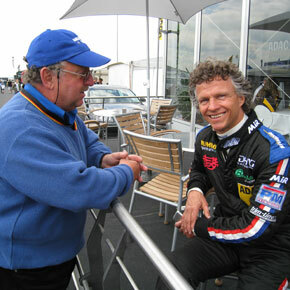 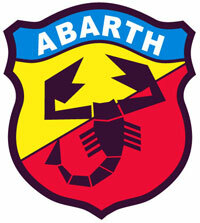 After almost 40 years, Kurt meets again with his former Abarth team mate, Italian Arturo MERZARIO. 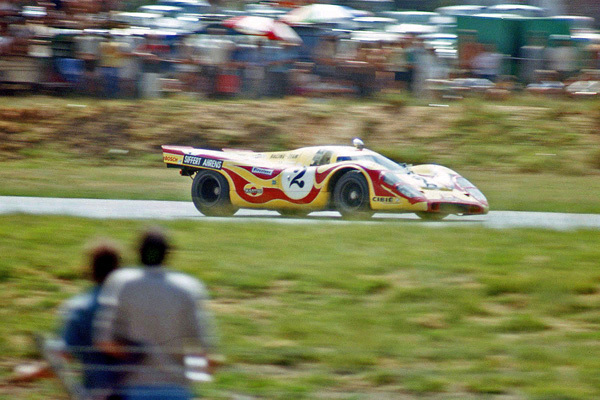 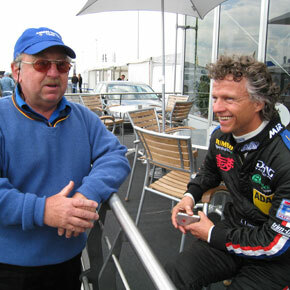 Jan Lammers is one of the 2 dutchmen that have ever won Le Mans. 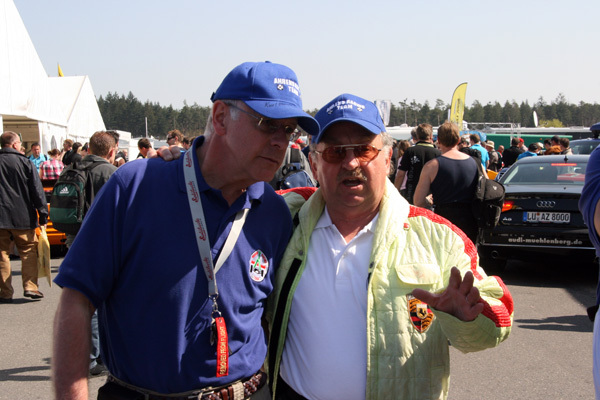 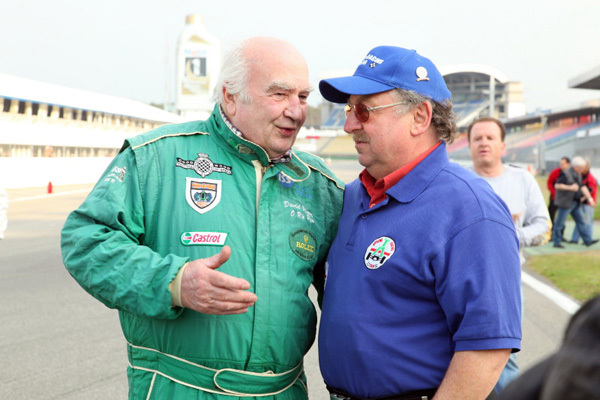 Two generations German racing aces meet each other. 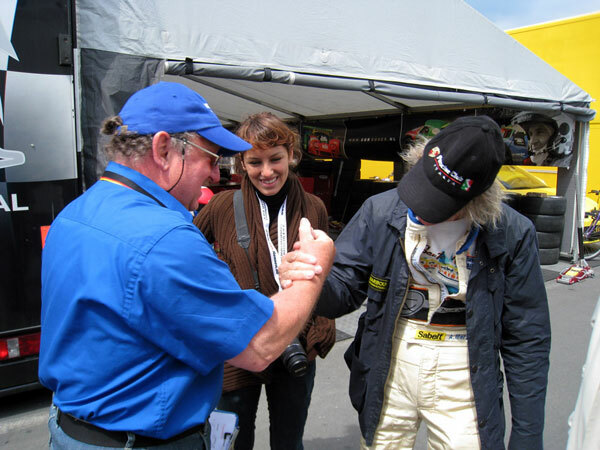 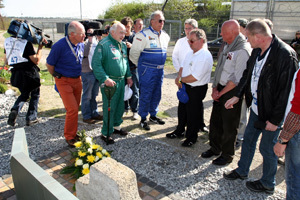 Kurt shakes hands with seven times F1 Champion Michael SCHUMACHER. 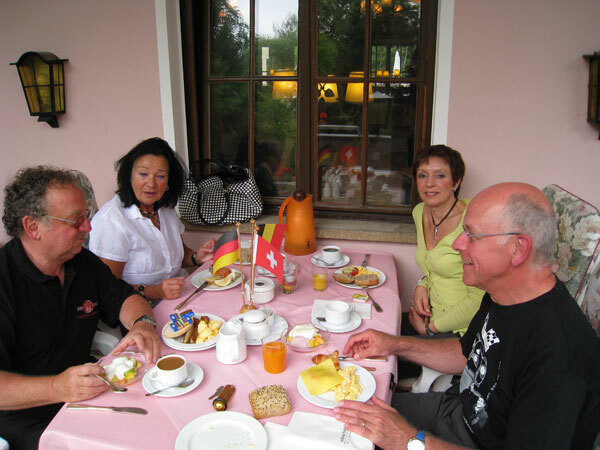 Breakfast on the terrace with Kurt, Reni and Marie-Jeanne. 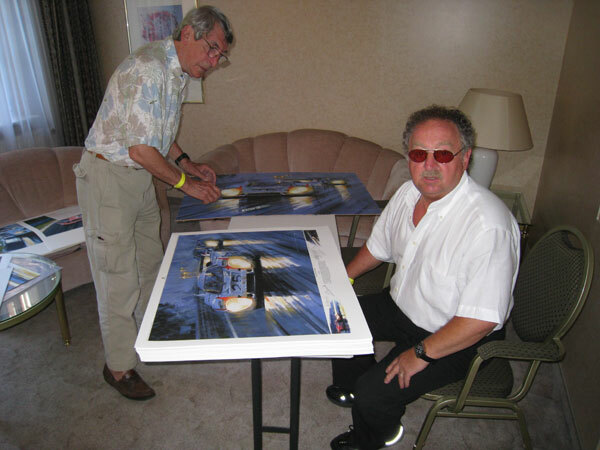 Kurt is signing the Nicholas Watts limited edition print "THE LONGEST NIGHT" while Vic Elford looks on. 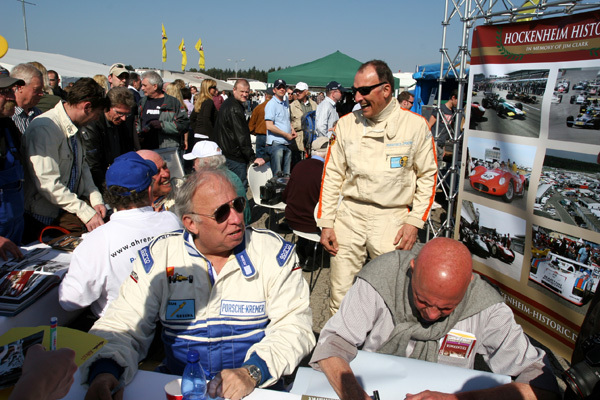 Vic Elford, Gerard Larrousse, Willy Kauhsen, Richard Attwood, Hans Herrmann, Rudi Lins, Helmut Marko and Jean-Pierre Hanrioud. 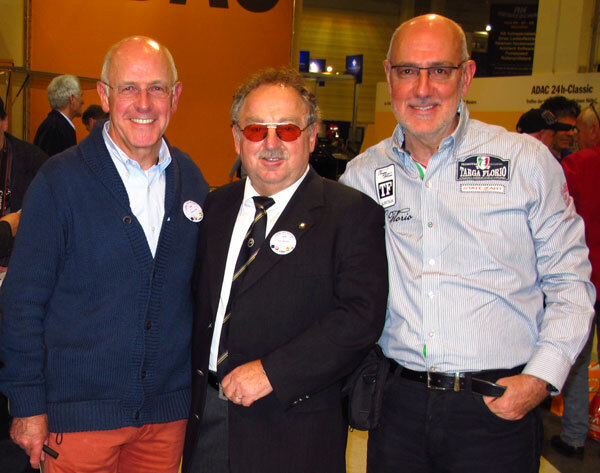 Carlos with his racing heroes Vic ELFORD and Kurt AHRENS. 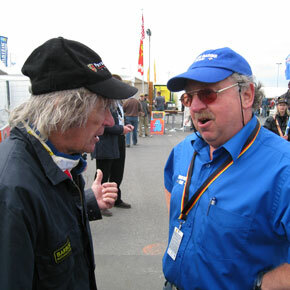 "Quick Vic" ELFORD and Carlos. 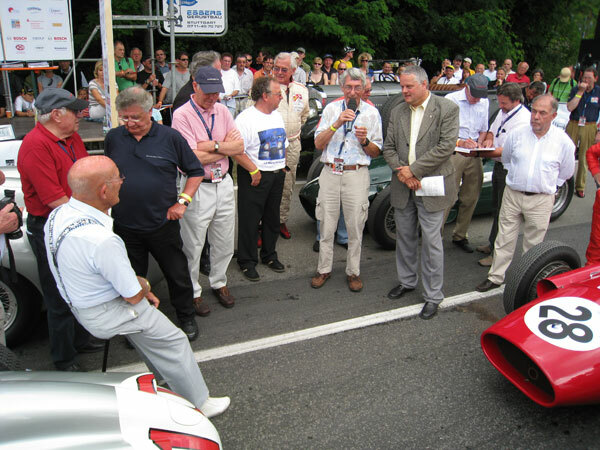 Vic ELFORD gives his impressions to the public in the company of Sir Stirling MOSS (front), Herbert LINGE (red shirt), Hans HERRMANN (black shirt), Richard ATTWOOD (blue cap), Kurt AHRENS and Willi KAUHSEN (right). 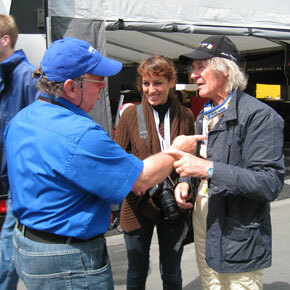 Peter FALK is signing autographs. 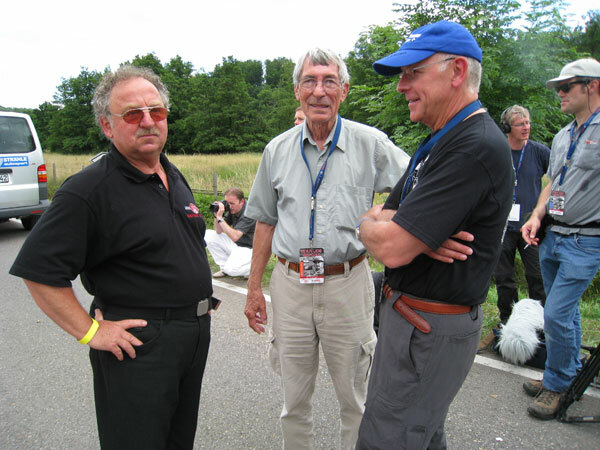 They are joined by Paul Ernst STRÄHLE (left), Eberhard MAHLE (black cap), Udo SCHUTZ (black shirt) and Swiss Jo VONLANTHEN (red overalls). 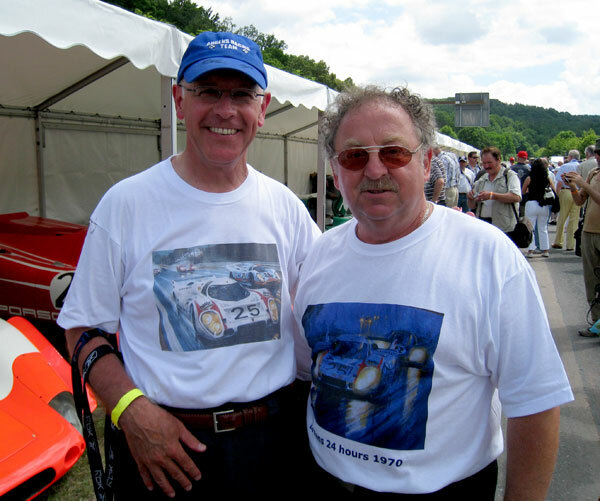 Kurt proudly shows the printed T-shirt he was offered by his former team mate Vic Elford. 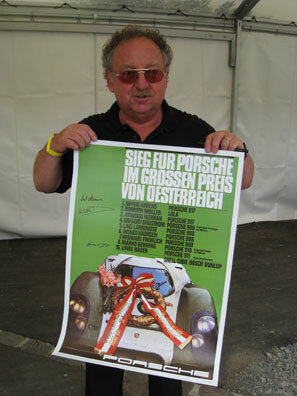 Kurt AHRENS, honory member of the Mexican Scuderia Rodriguez, shows a Porsche poster of his victory at Zeltweg in 1969. 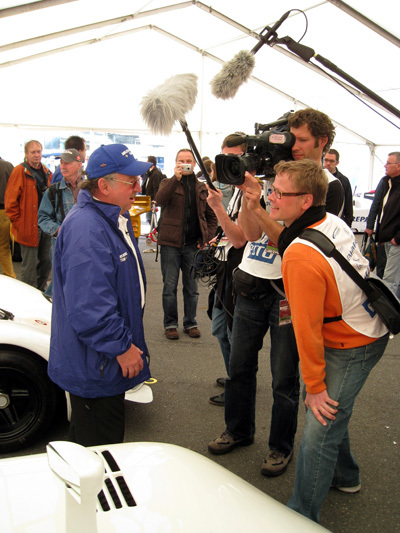 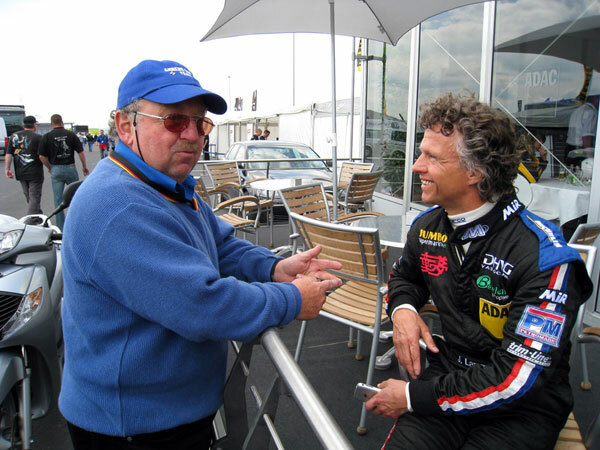 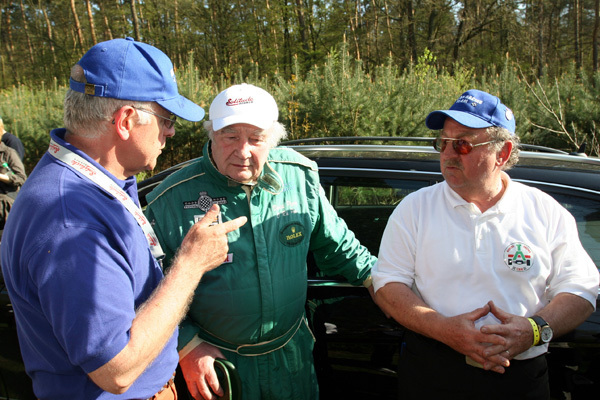 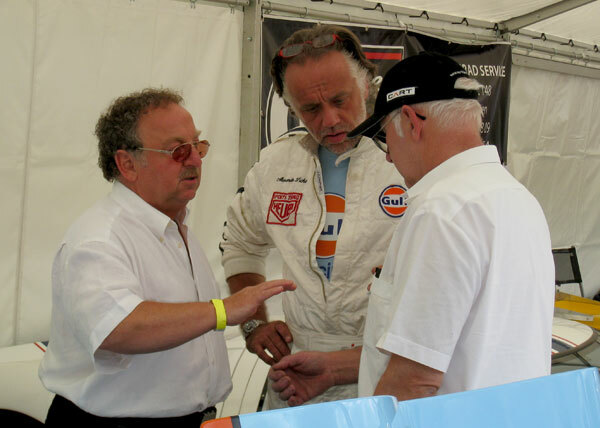 Kurt Ahrens discussing with the car owner Alexander Licht (center) and Jochen who is a former Martini Racing Team mechanic. 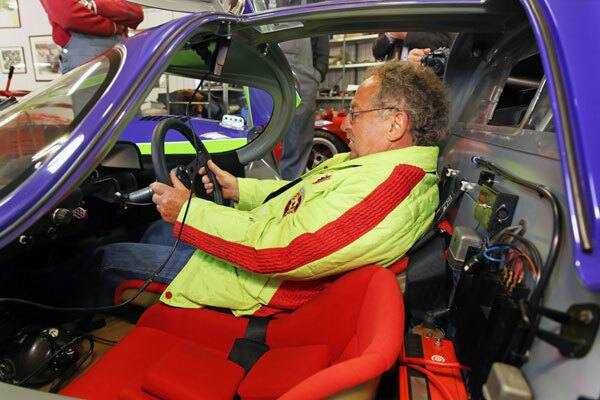 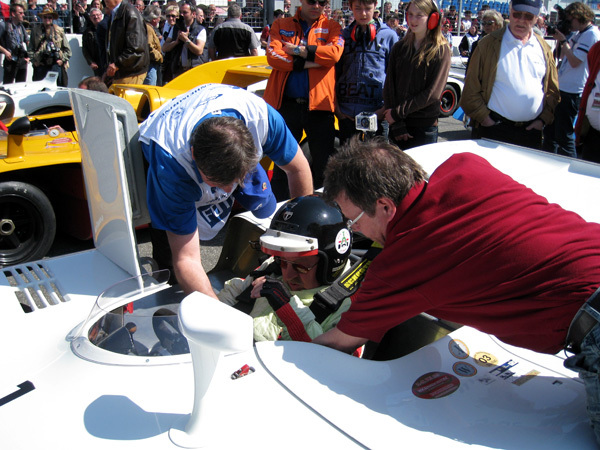 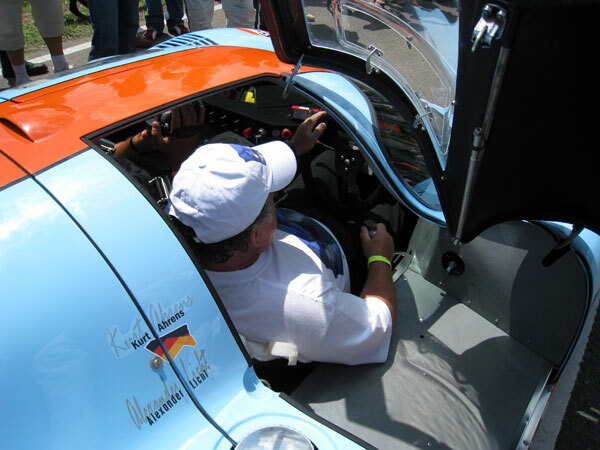 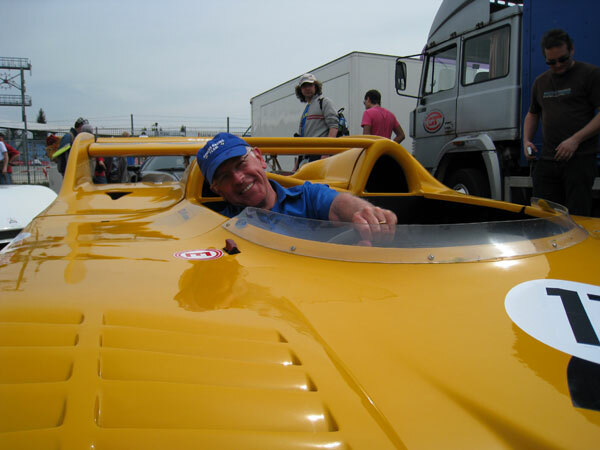 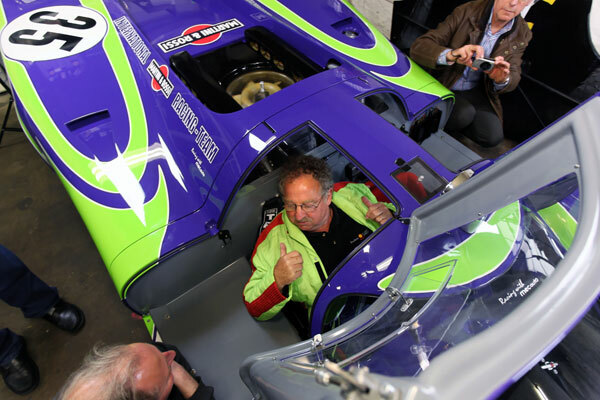 Kurt Ahrens behind the wheel of the Porsche 917 replica car. 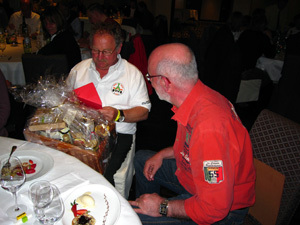 Ready for a demonstration ride on the famous Solitude circuit. 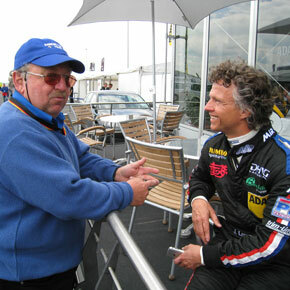 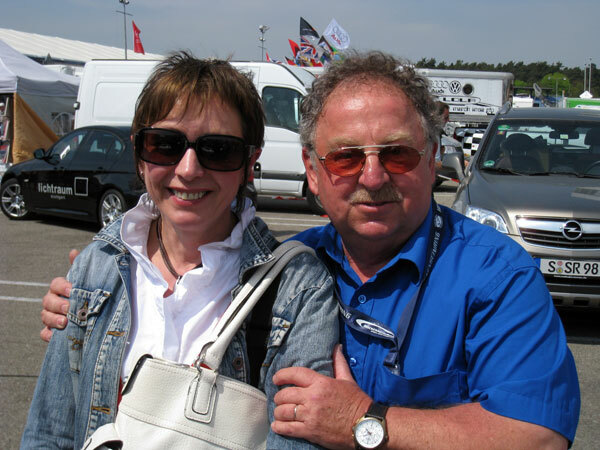 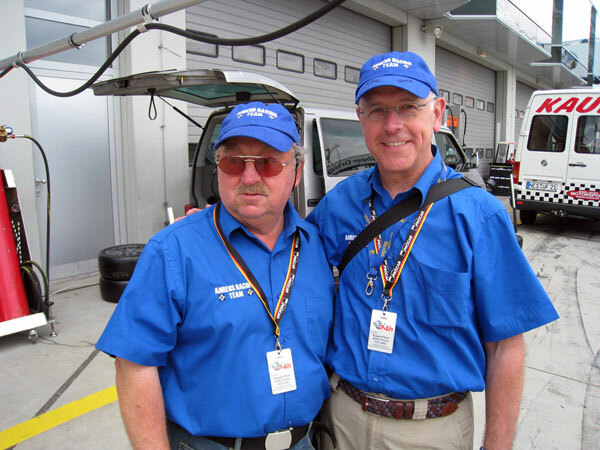 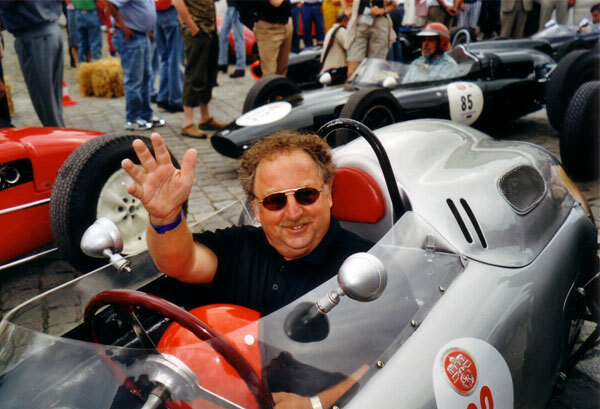 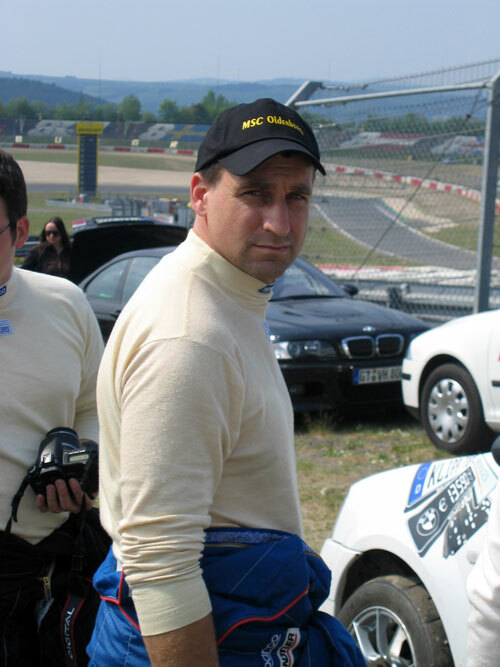 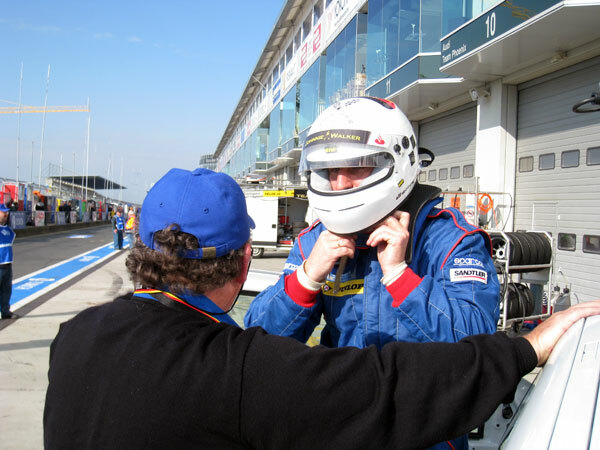 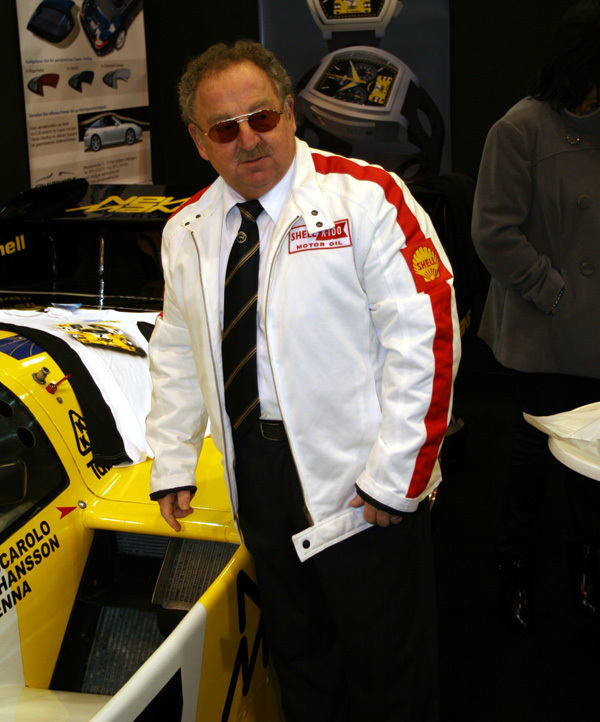 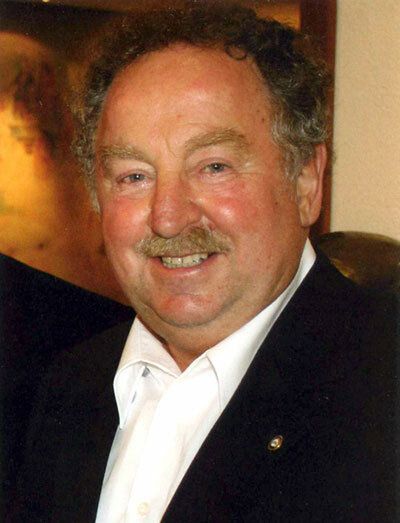 famous German racing driver and a great person. 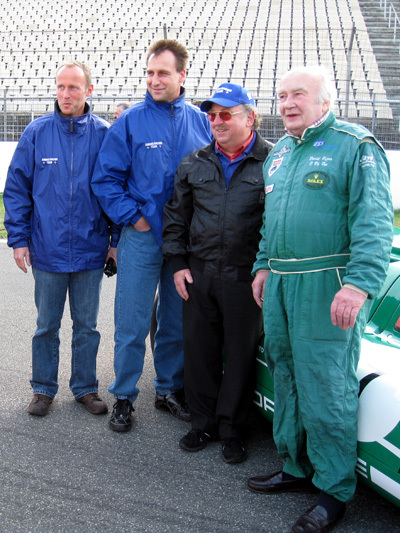 famous Porsche drivers and close friends. 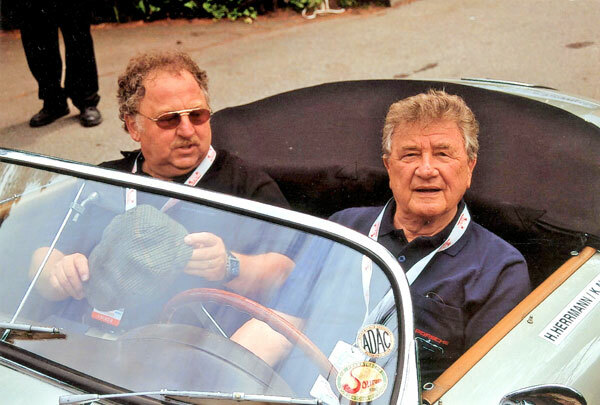 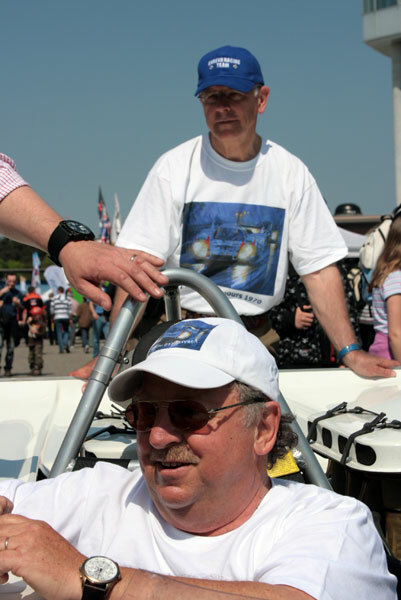 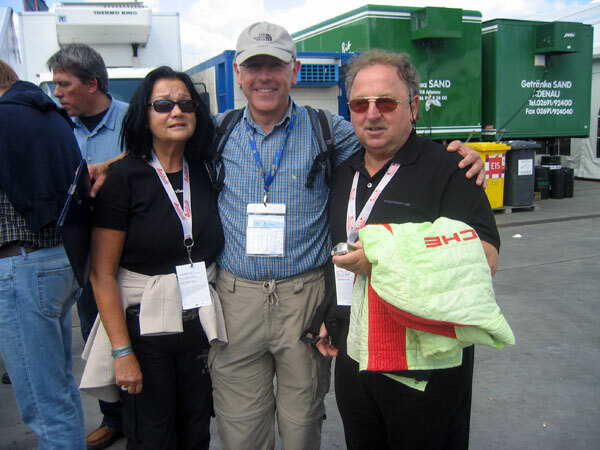 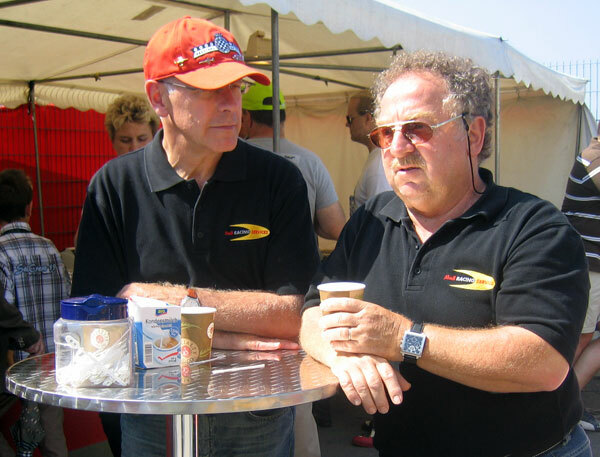 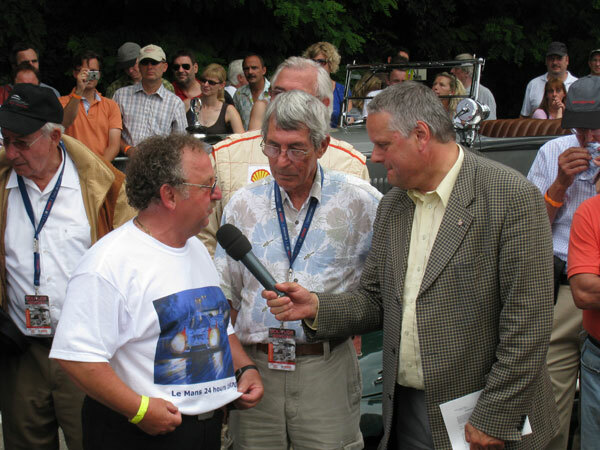 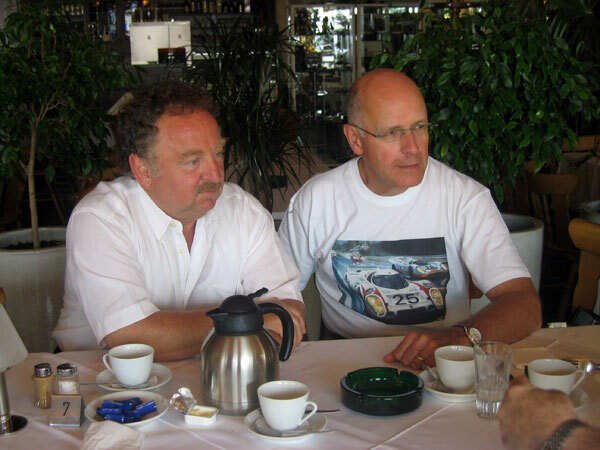 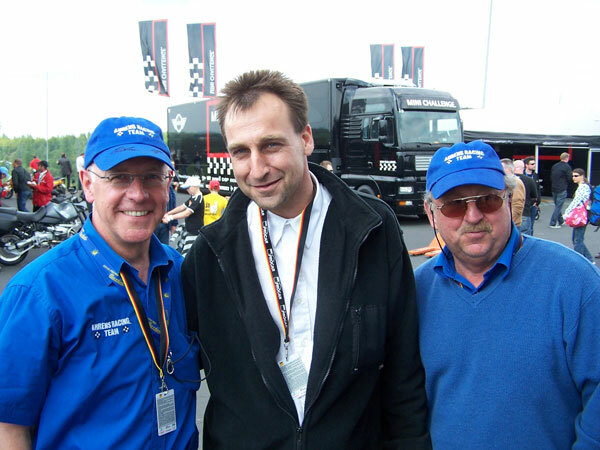 Kurt Ahrens is a member of the "Club international des anciens pilotes de Grand Prix de Formule 1"
Vic Elford (L), Eberhard MAHLE (front) and Kurt AHRENS. 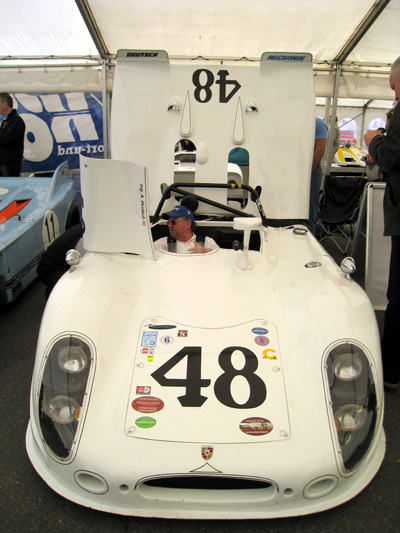 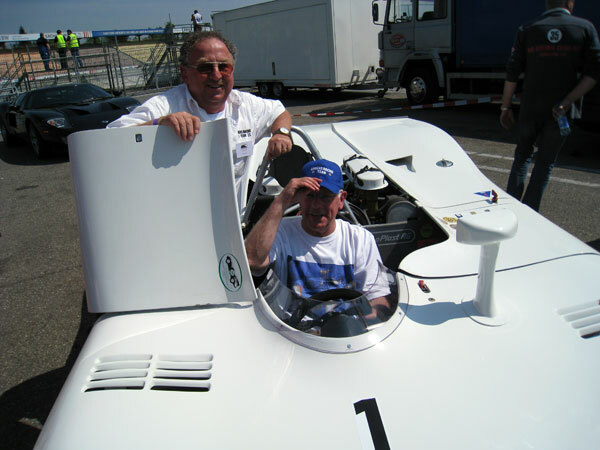 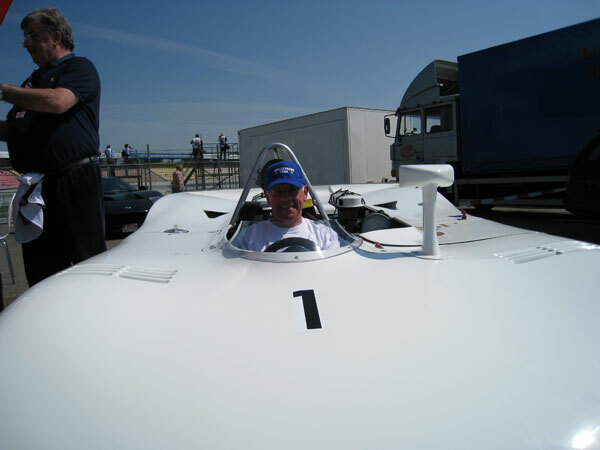 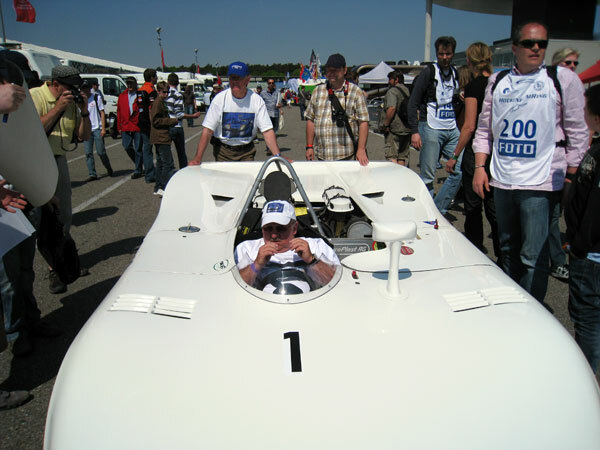 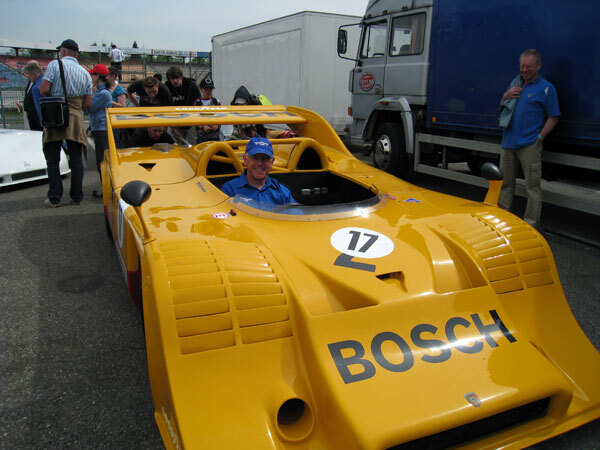 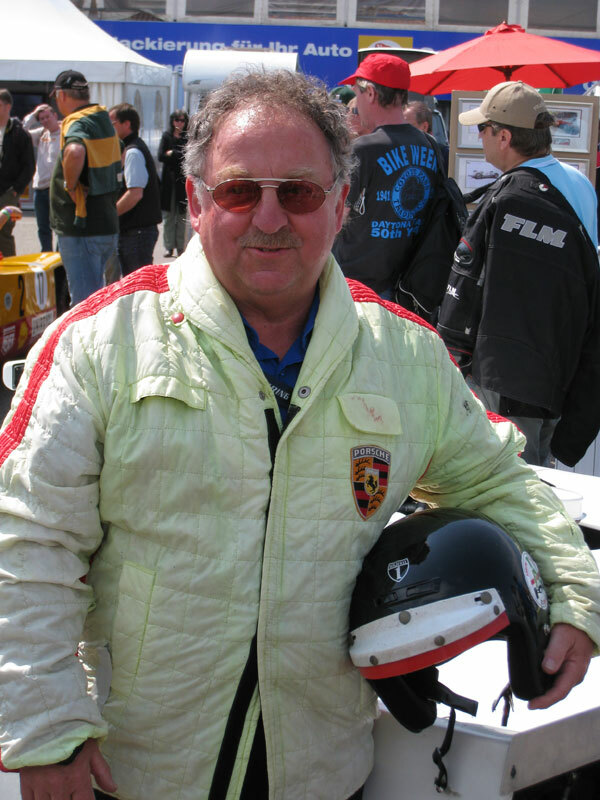 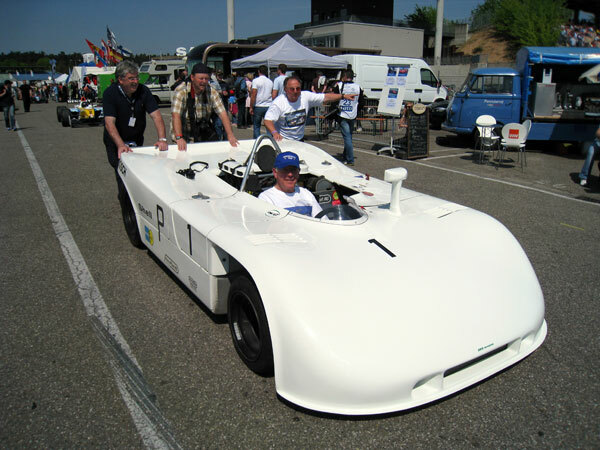 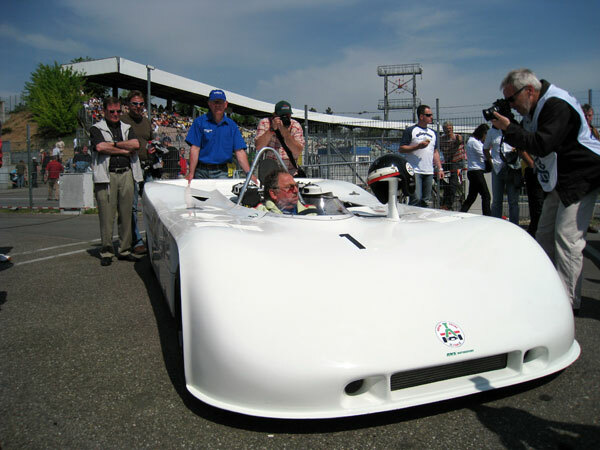 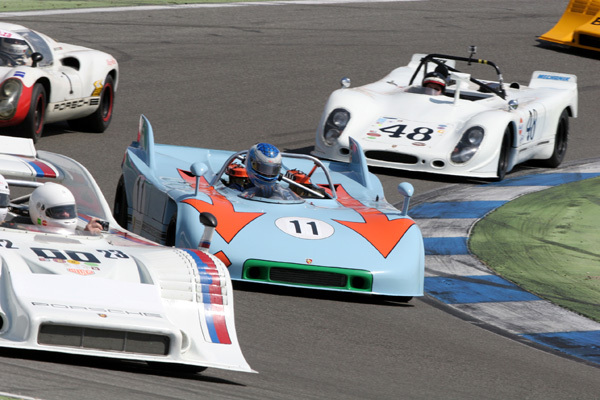 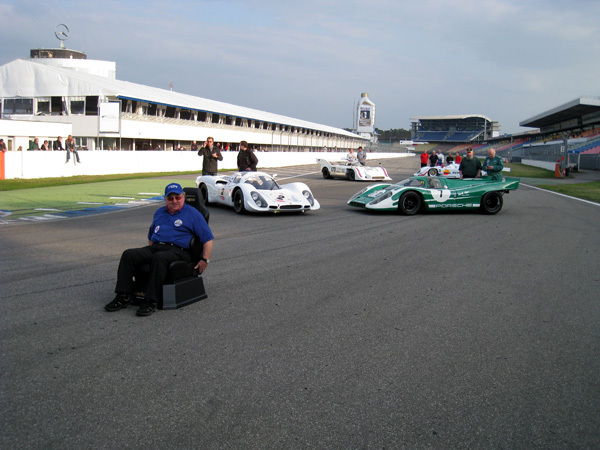 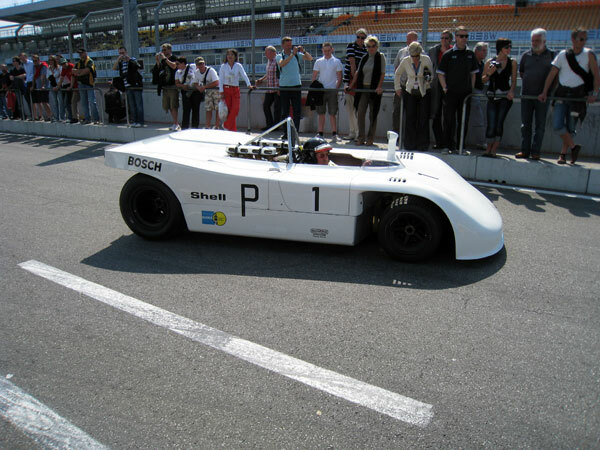 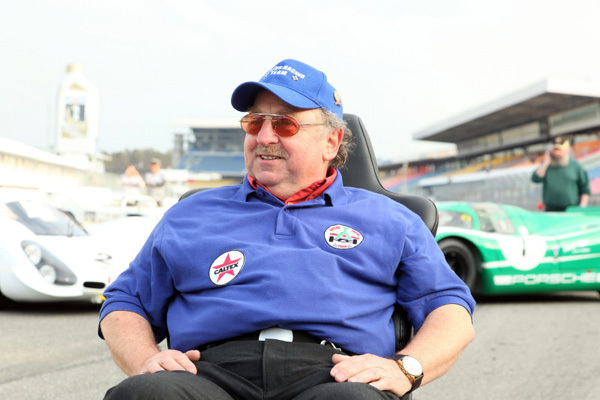 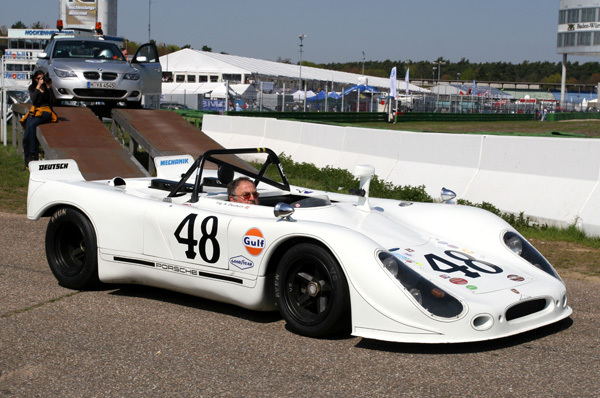 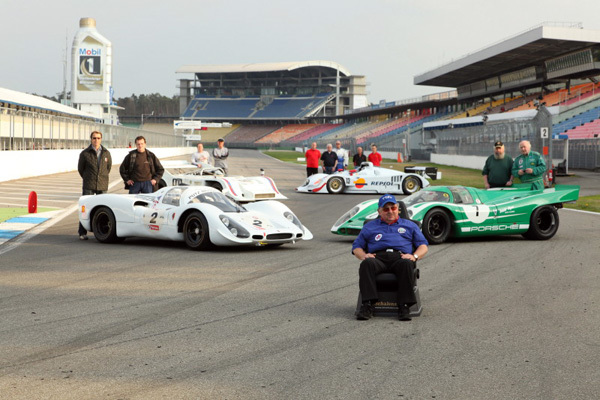 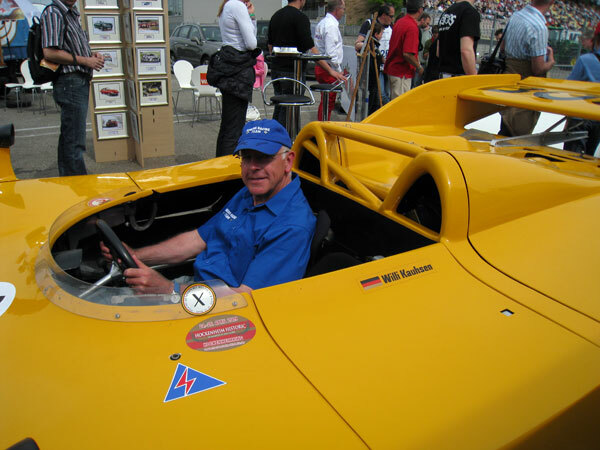 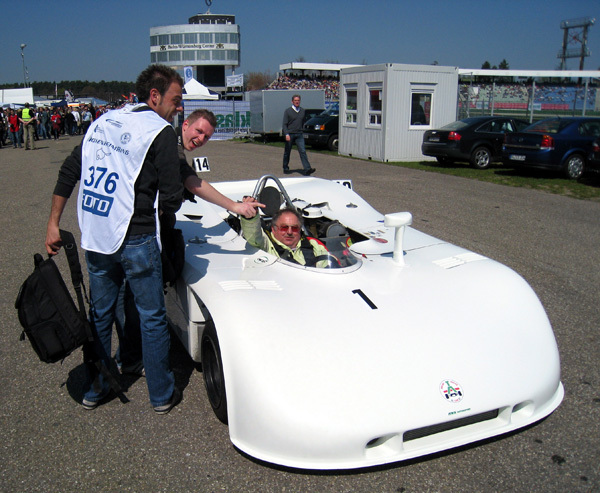 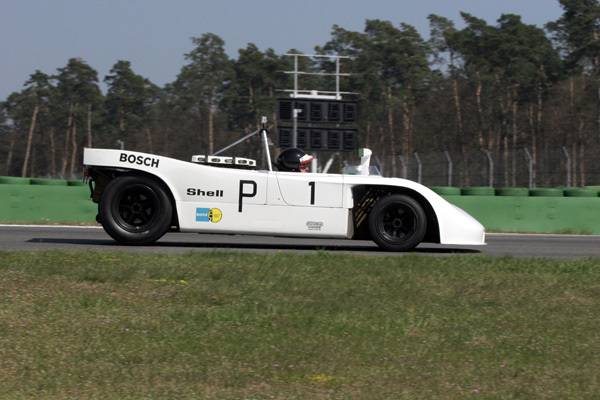 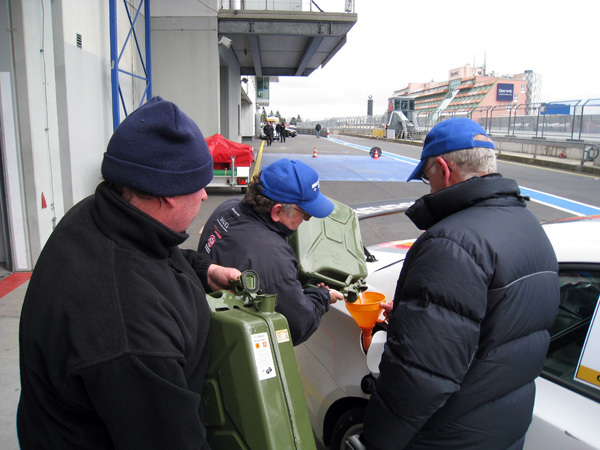 After almost 40 years, Kurt AHRENS was again at the wheel of a PORSCHE 908/03 for a few demonstration laps. 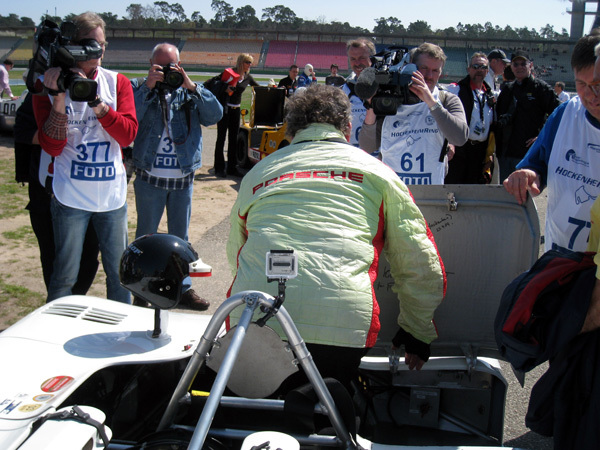 After his demonstration, Kurt is pushing the car back to the paddock, Carlos at the wheel! 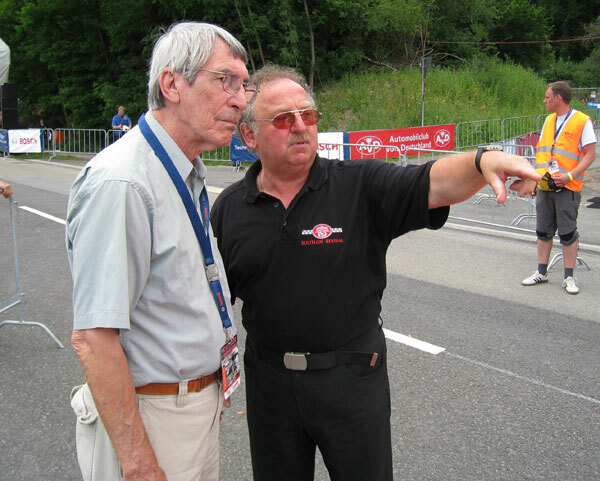 Willi KAUHSEN and Kurt AHRENS. 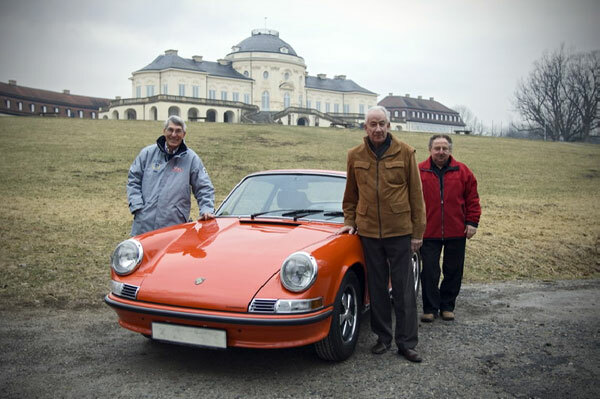 Hans HERRMANN, David PIPER, Willi KAUHSEN and Kurt AHRENS, great Porsche drivers. 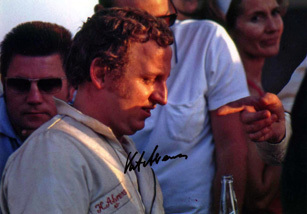 My friend and hero Kurt AHRENS. 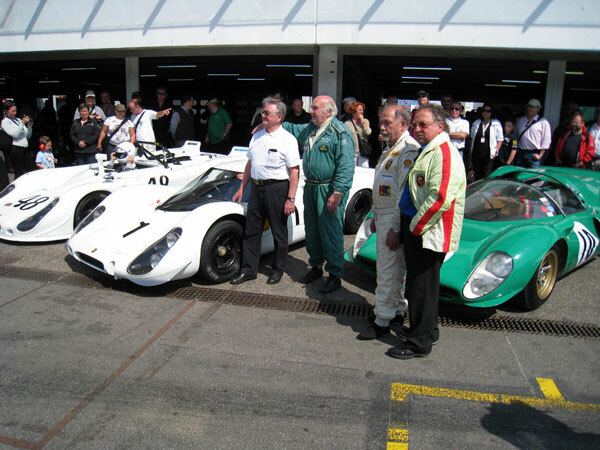 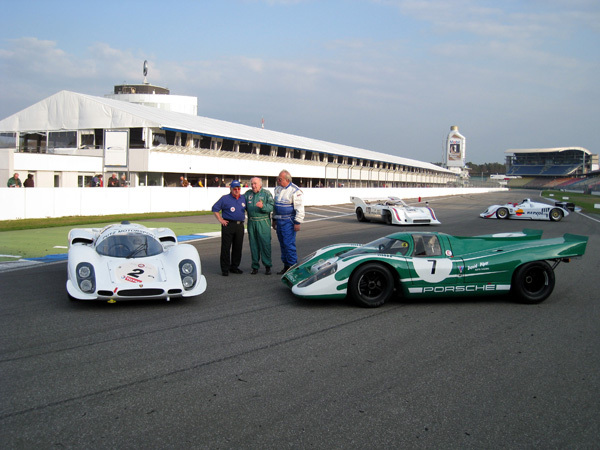 Carlos and Kurt AHRENS on the start grid..
Ready to go, David PIPER in his green Ferrari P4 and Kurt AHRENS in the Porsche 908/03. 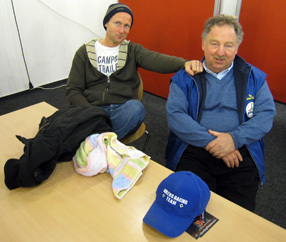 Kurt AHRENS and son Mike. 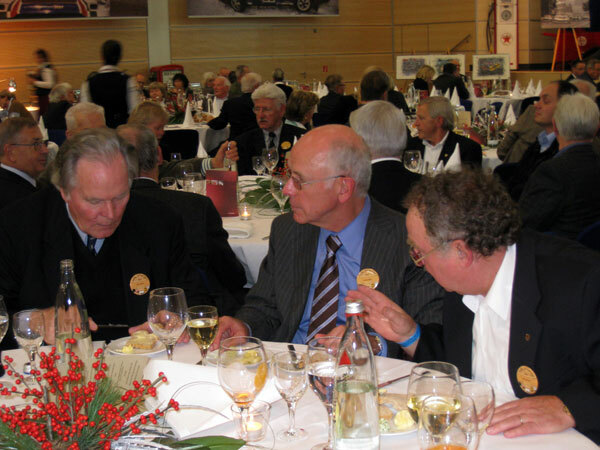 Manfred SHURTI, Rudi LINS, Herbert STAUDENMAIER and Mrs STAUDENMAIER. 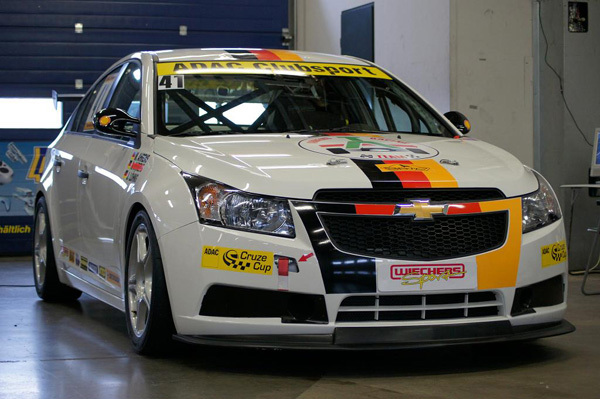 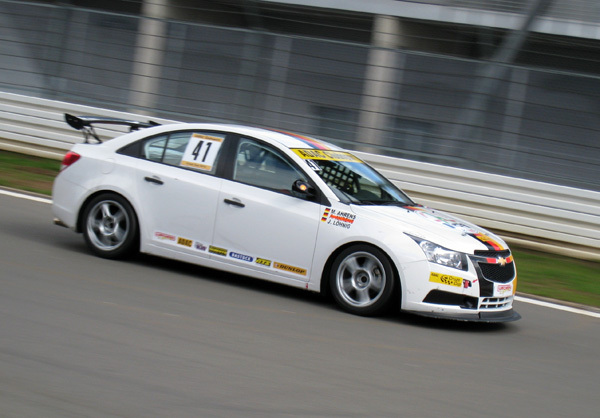 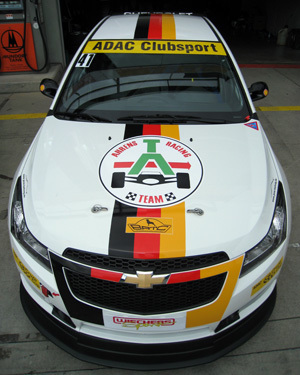 During the 2010 season, Mike Ahrens drives this beautiful race-spec Chevrolet Cruze. 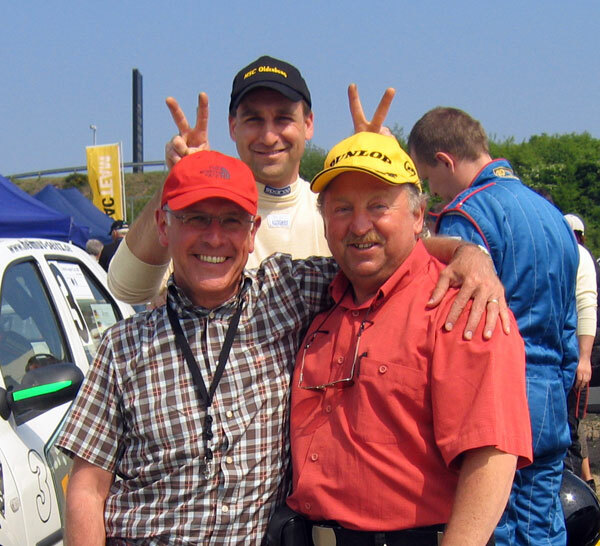 Kurt Ahrens, David Piper and Jürgen Neuhaus. 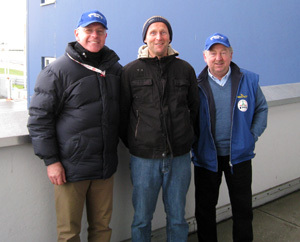 Kurt Ahrens and his sons Mike (left) and Alf pose with David Piper. 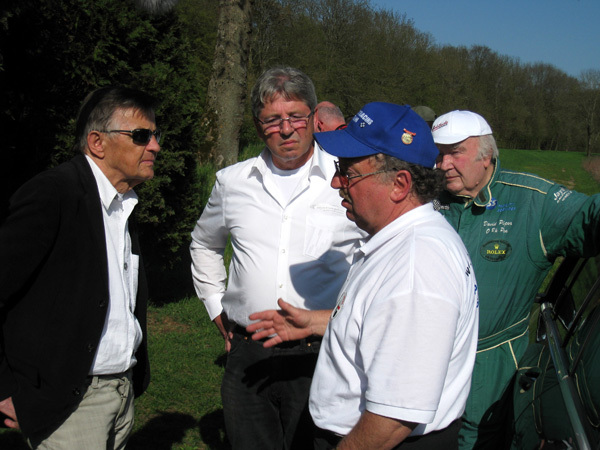 From left to right: Organizer, Hans MEZGER, Ernst KRAUS, organizer, David PIPER, Jürgen NEUHAUS and Kurt Ahrens. 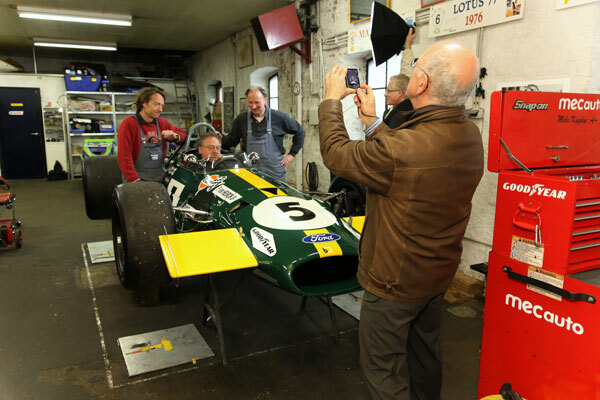 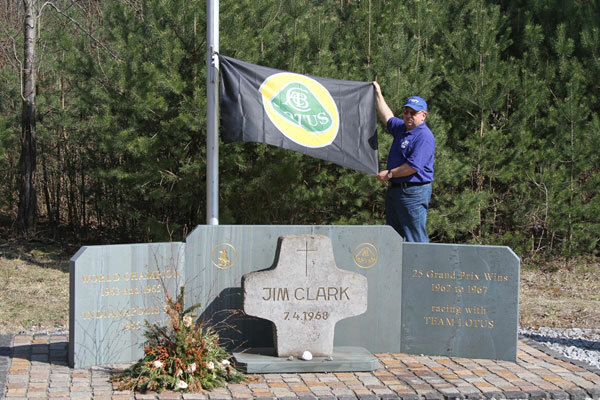 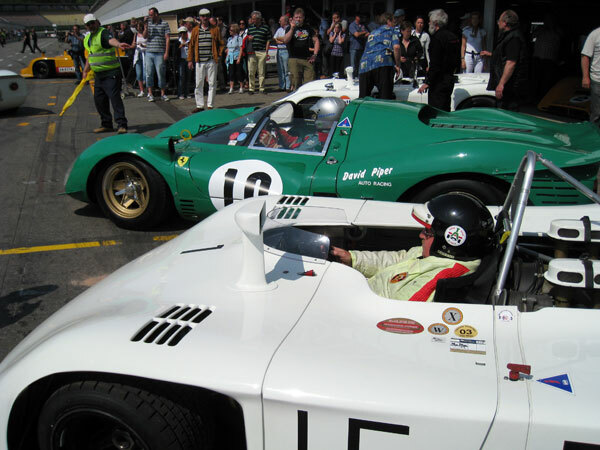 It is a yearly tradition that, on Saturday, the organizers , drivers and a few fans pay their tribute to Jim Clark. 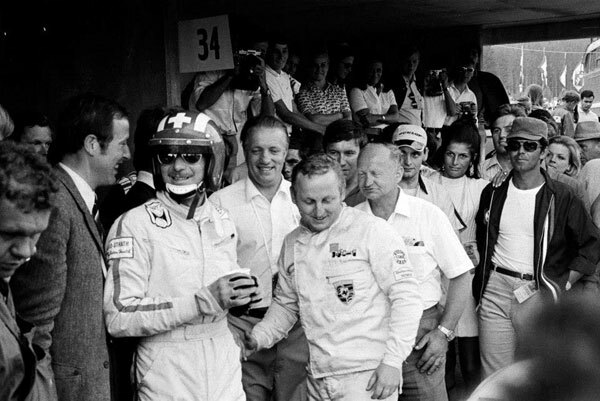 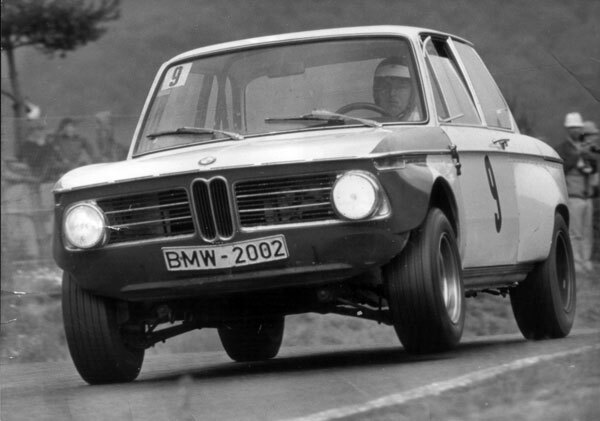 He was the dominant driver of his era, winning two World Championships, in 1963 and 1965.
than any other driver. 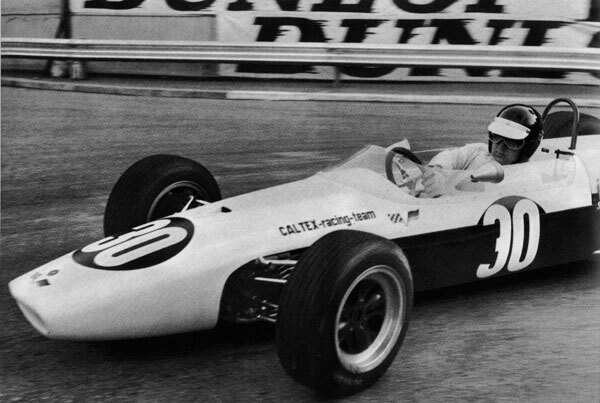 He also competed in the Indianapolis 500 five times, and won it once, in 1965. 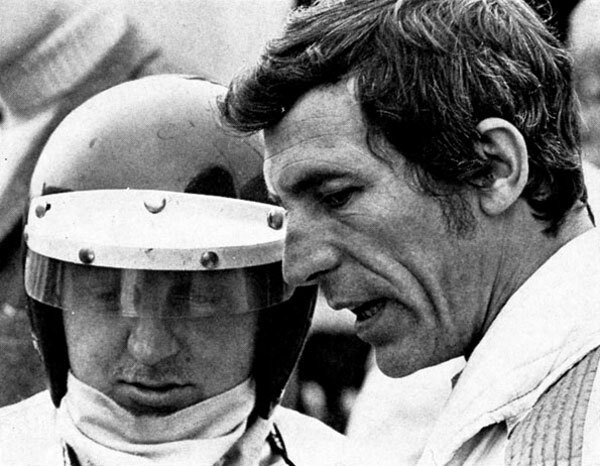 "The Times" recently placed Clark at the top of a list of the greatest Formula One drivers. 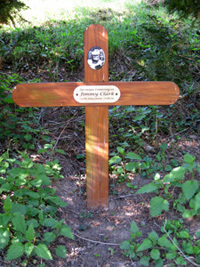 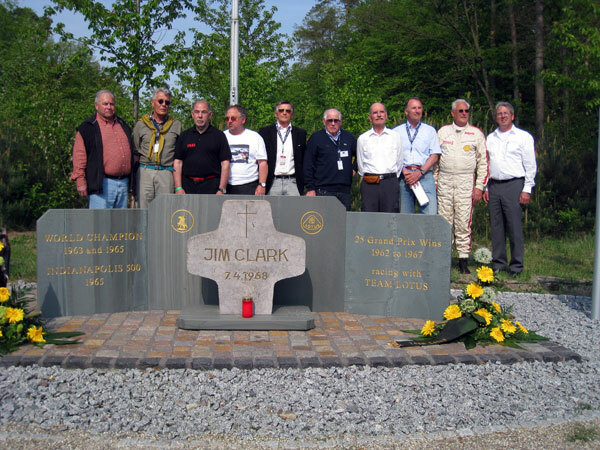 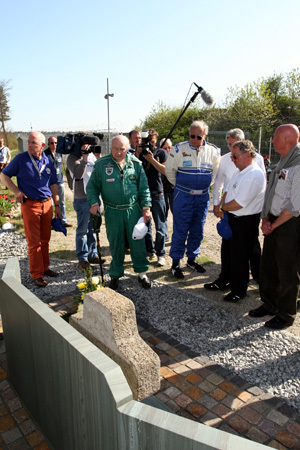 After the ceremony, the delegation visited the place where Jimmy Clark lost his life. 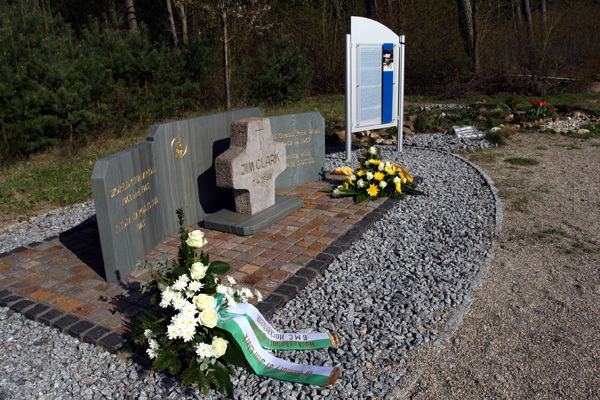 Two huge cypress trees and a wooden cross, at a little distance from the monument, indicate where the Scottish driver crashed into the trees along the circuit. 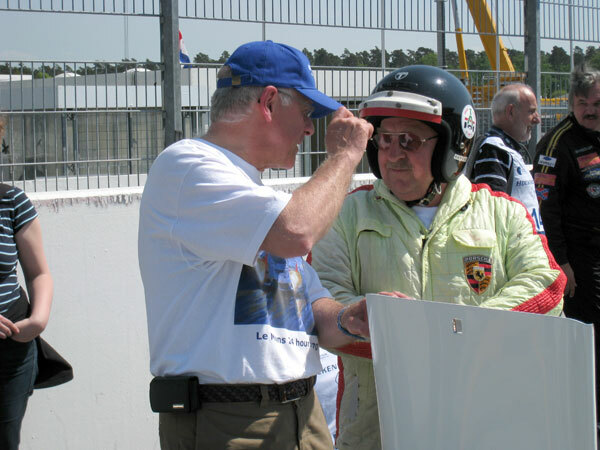 Today, the old Hockenheim track made place for a new forest. 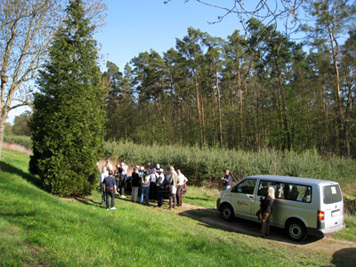 The old trail is still visible through the young pine trees. 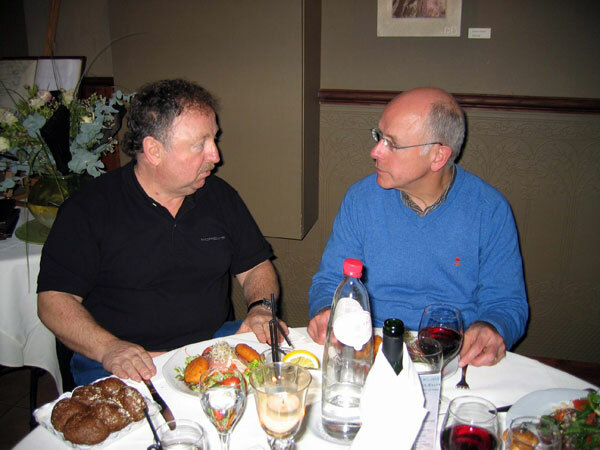 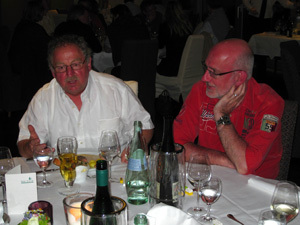 Carlos translate Kurt Ahrens´ sad story to a very emotional David Piper while Hans Mezger looks on. 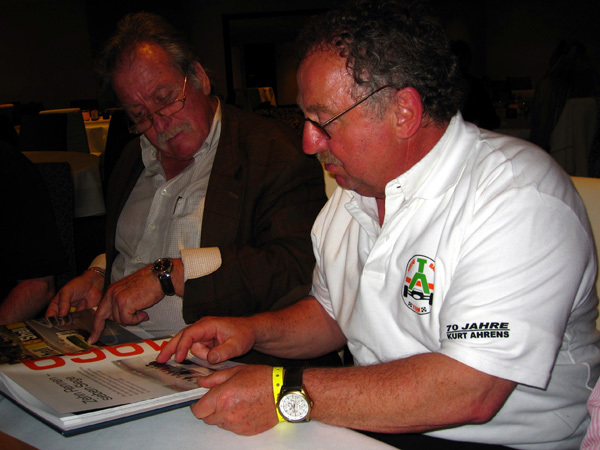 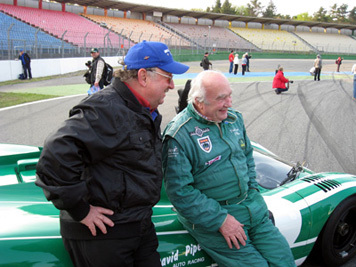 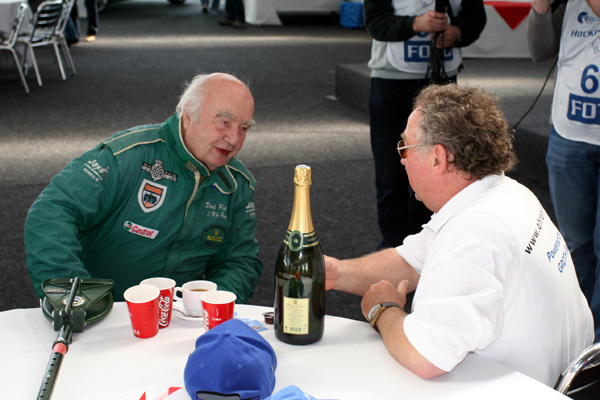 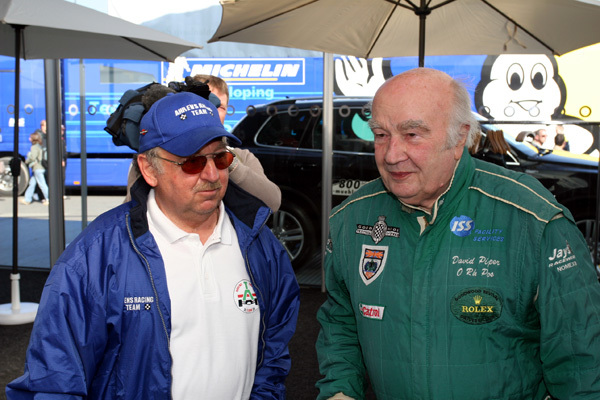 David Piper and Jim Clark were close friends. 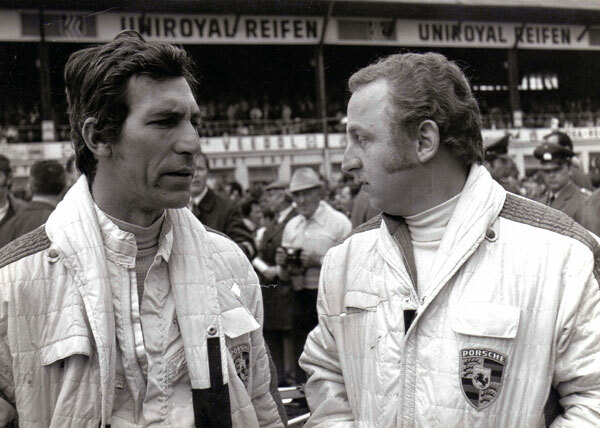 The world lost one of his greatest racing drivers. 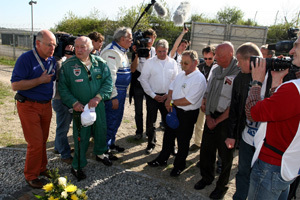 From left to right: David PIPER, Ottocar JACOBS, Kurt AHRENS, Jürgen Neuhaus and Ernst KRAUS. 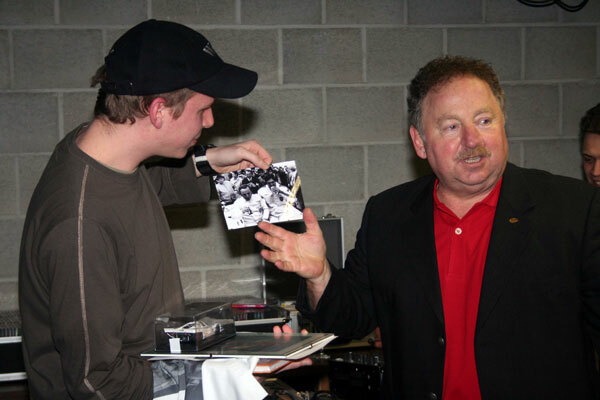 Alf and Mike AHRENS have a close look while their famous father signs hundreds of photographs. 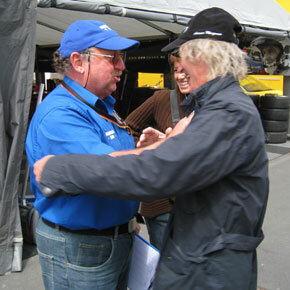 My brother Luc offers Kurt a huge birthday present. 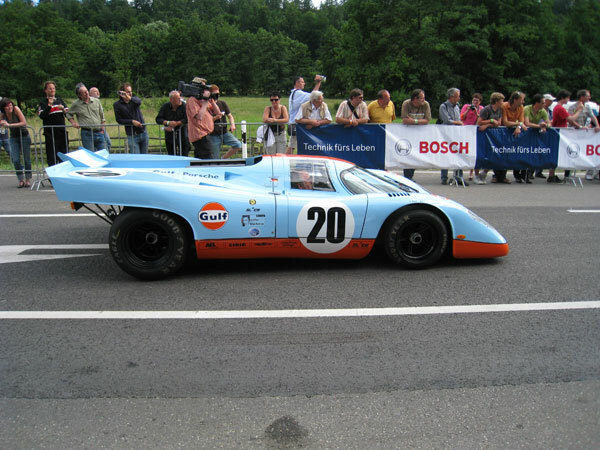 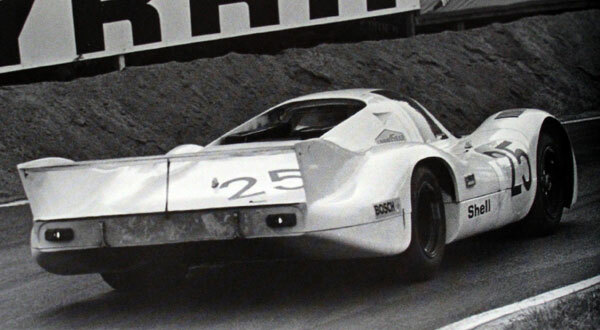 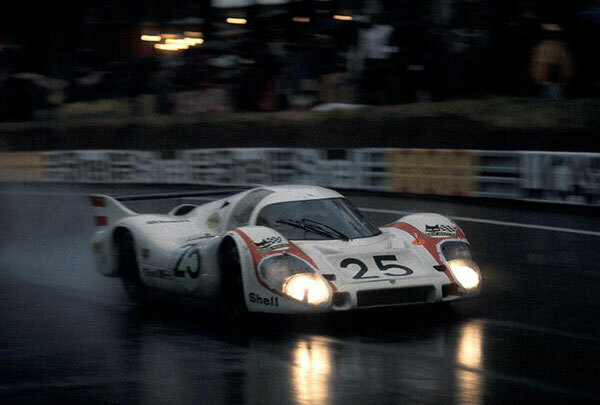 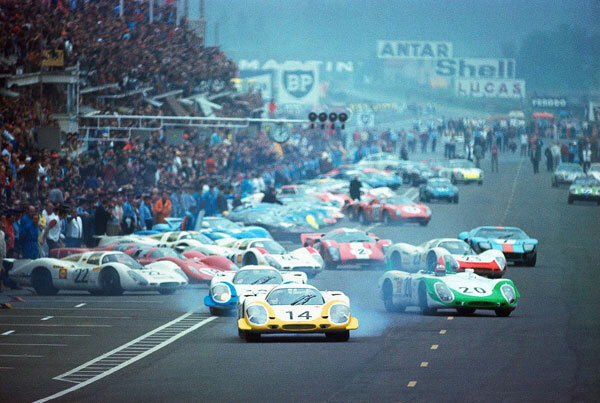 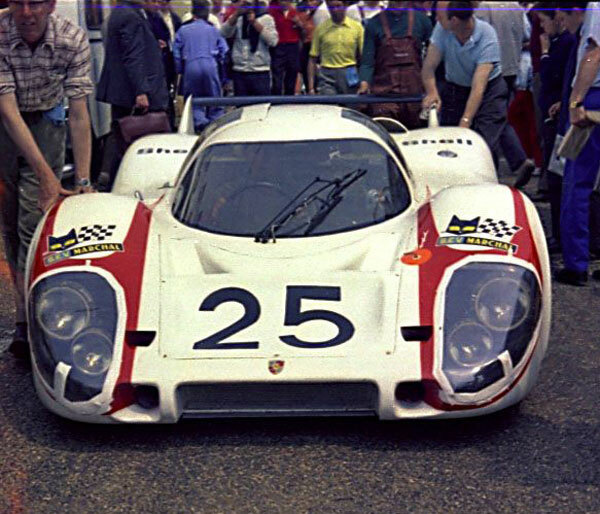 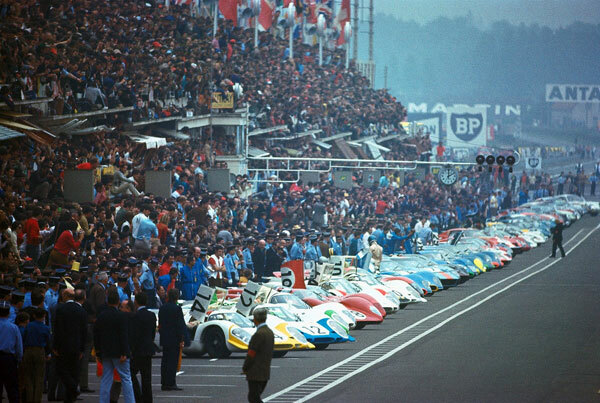 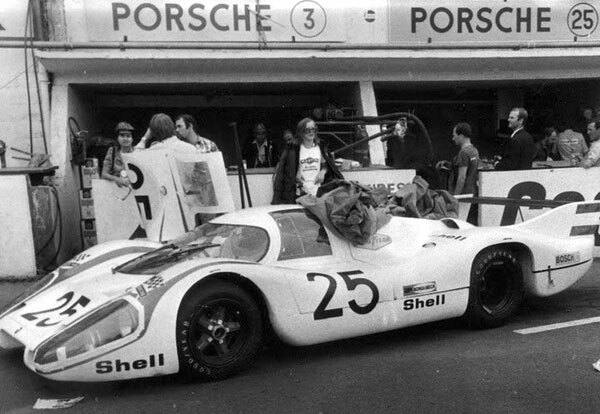 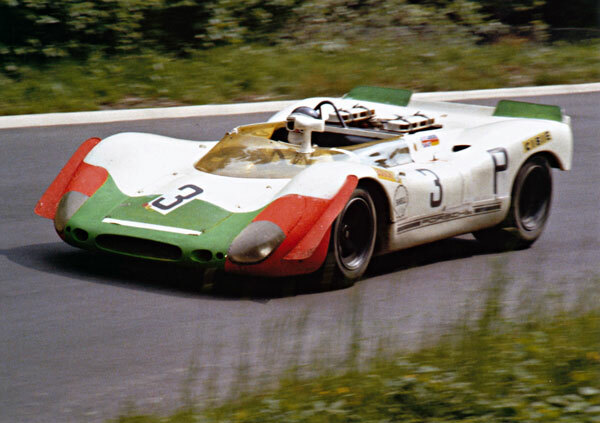 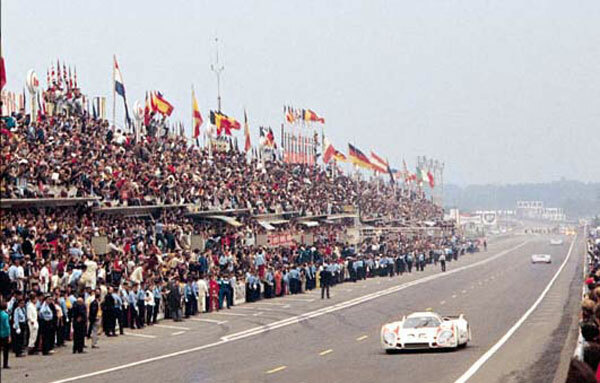 of Kurt´s Porsche 917 he shared with Vic ELFORD during the 1970 Spa 1000 km. 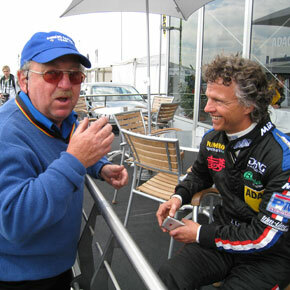 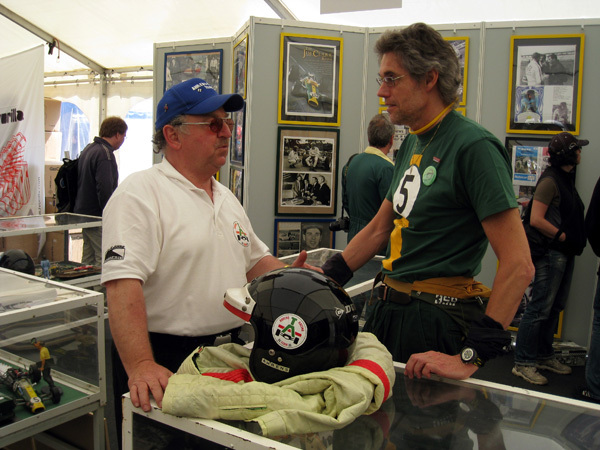 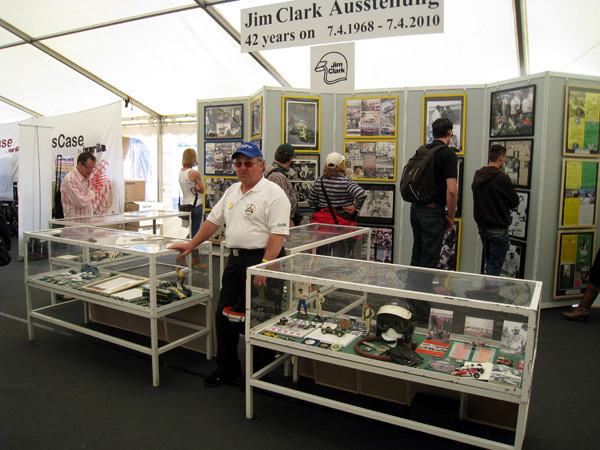 Swiss Jürg MALLEPELL and his impressive collection of Jim Clark memorabilia. 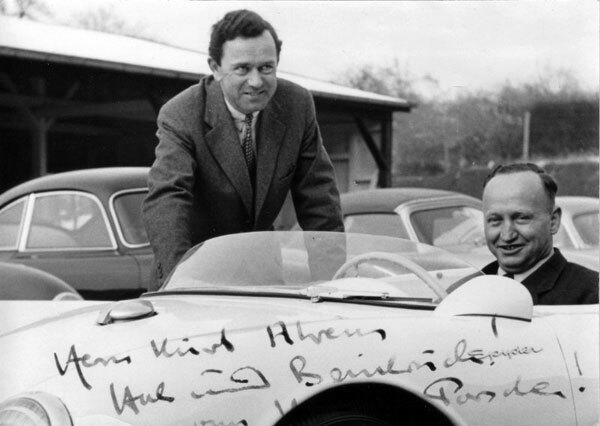 The car is owned by German Fritz KOZKA. 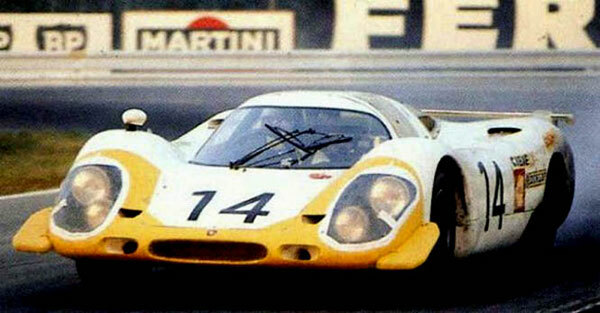 In 1970, teamed with Vic ELFORD, Kurt won the Nürburgring 1000 km race in a similar car. 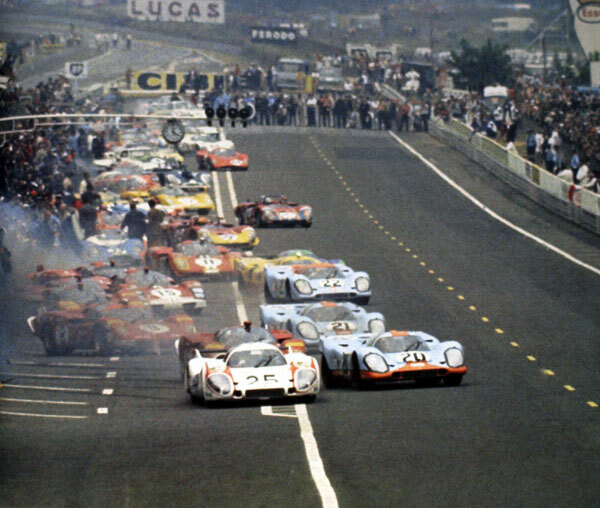 exactly 40 years lay between this picture and the above! 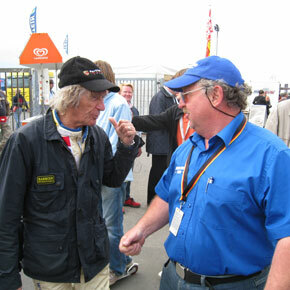 On his way to the track, Kurt meets Sven LAEVERS and Johan THEYS. 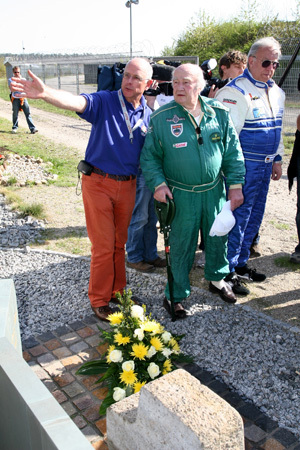 In 2004, Kurt was a surprise guest during Sven´s 25th birthday party near Diest in Belgium. 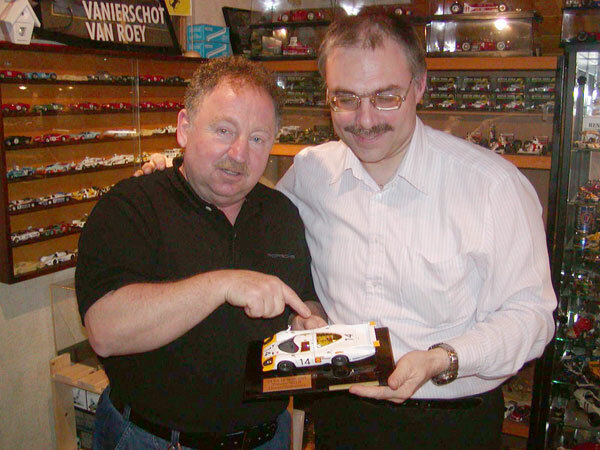 Sven was so impressed, he started an autograph and memorabilia collection. 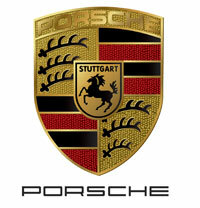 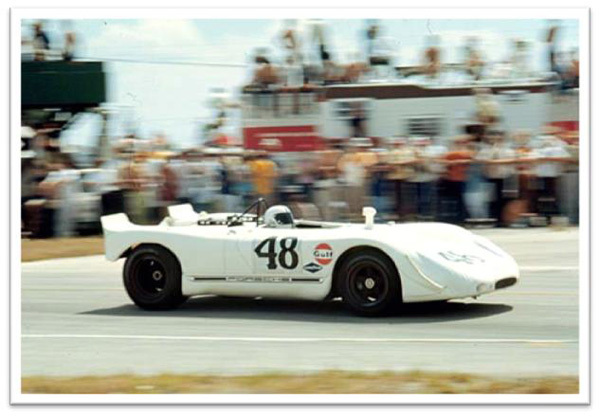 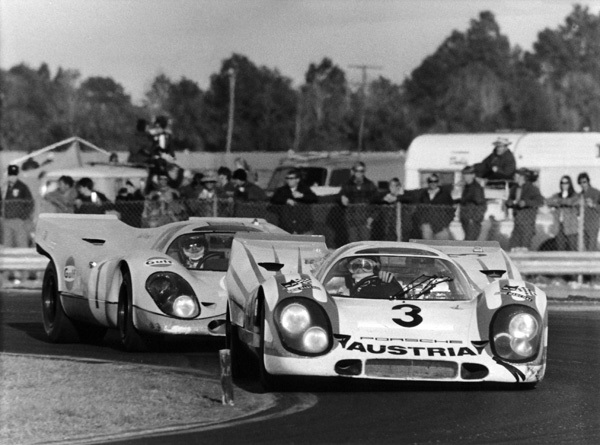 On Sunday, Kurt demonstrate a Porsche 908, driven by famous film star Steve McQueen during the 1970 Sebring 12 Hours. 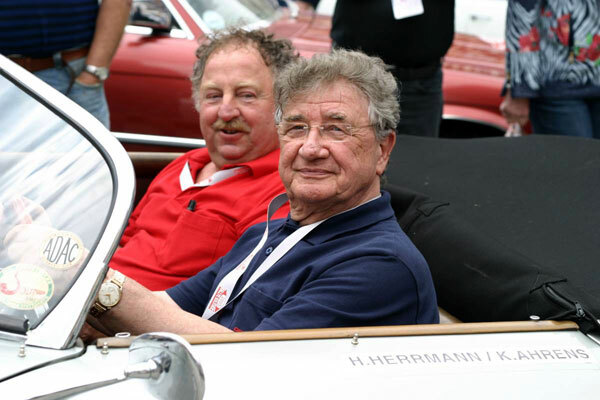 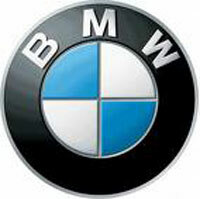 The car is owned by German engineer August DEUTSCH. 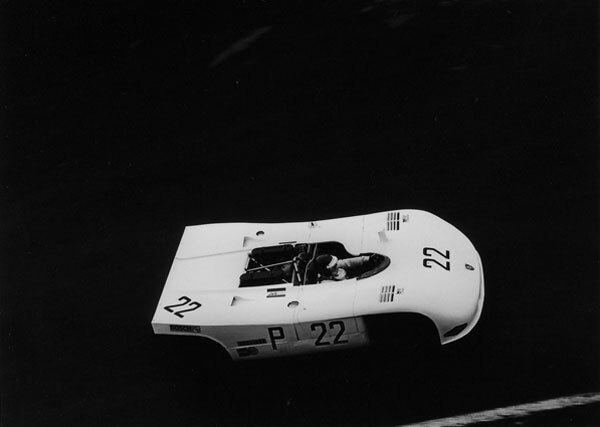 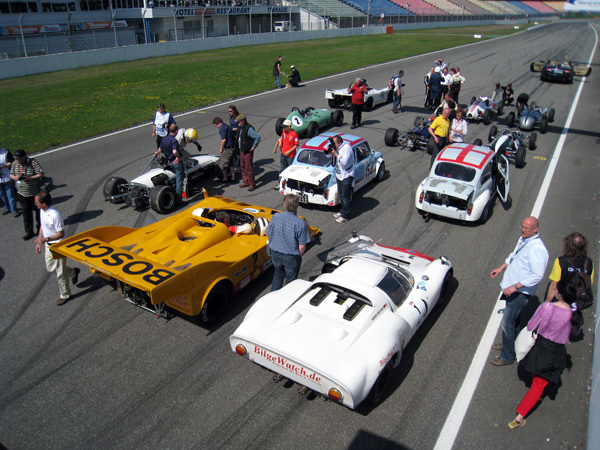 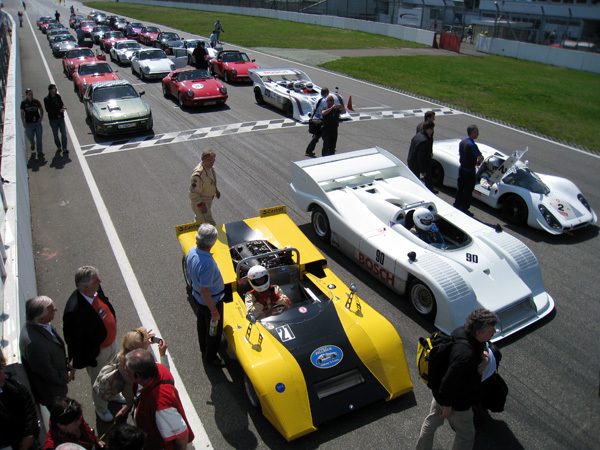 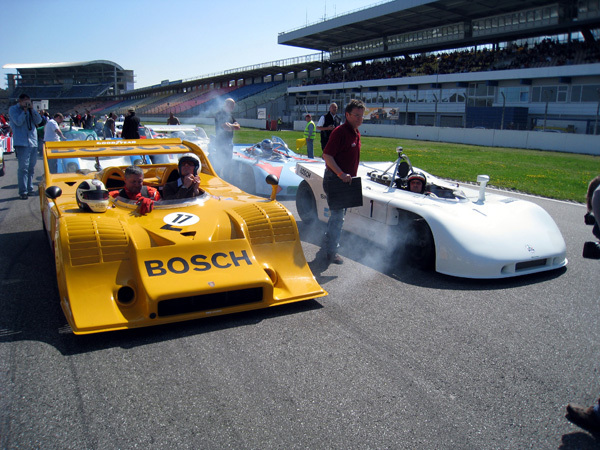 At the end, some thirty Porsches from the Braunschweig Porsche Club followed the racing cars led by Kurt Ahrens in an ex-Steve McQueen Porsche 908. 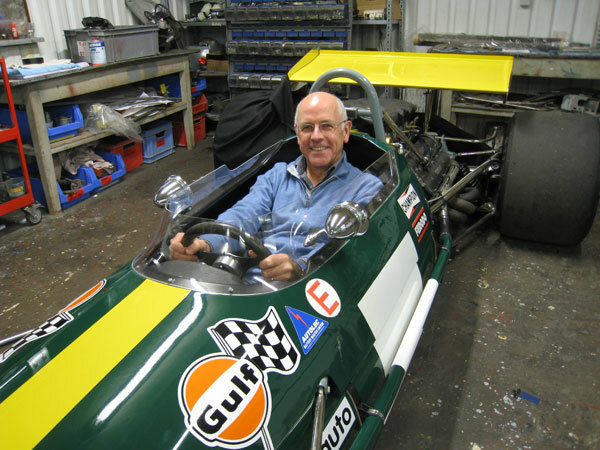 This beautiful car is now owned by David BROWN. 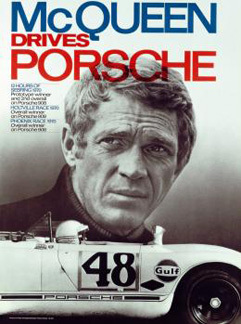 POWERSLIDE magazine 6/2010 (July 12th 2010). 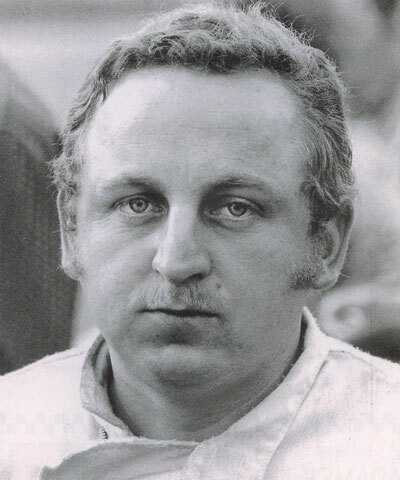 Article on Kurt AHRENS Jr. 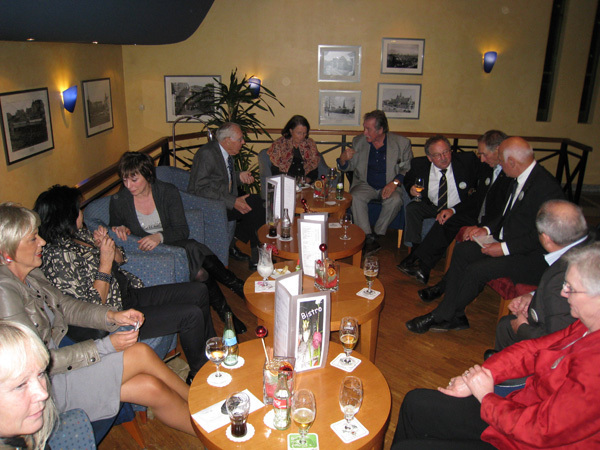 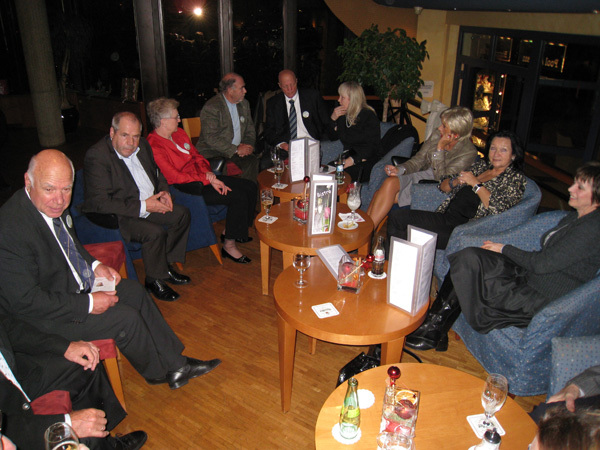 Together with Kurt AHRENS, Jutta FAUSEL, Udo SCHUTZ and Hans-Dieter DECHENT. 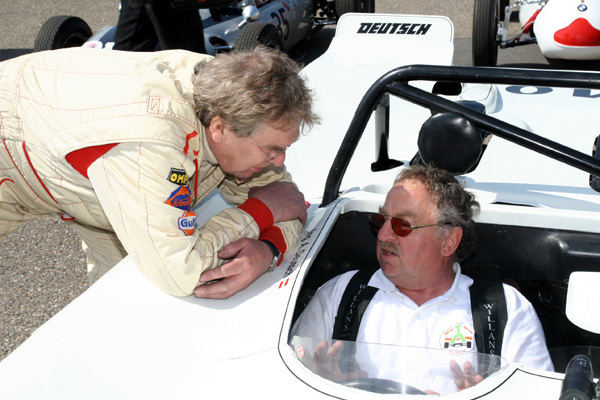 Kurt never forgets Jimmy Clark. 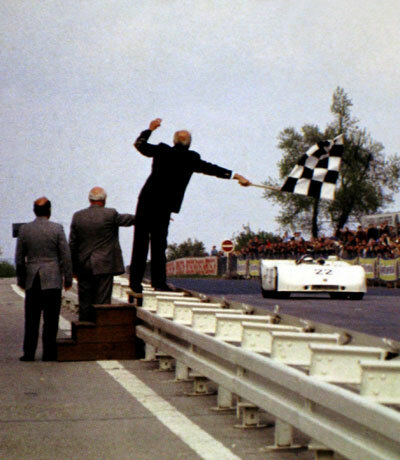 Here he's raising the Lotus flag in honor of his idol. 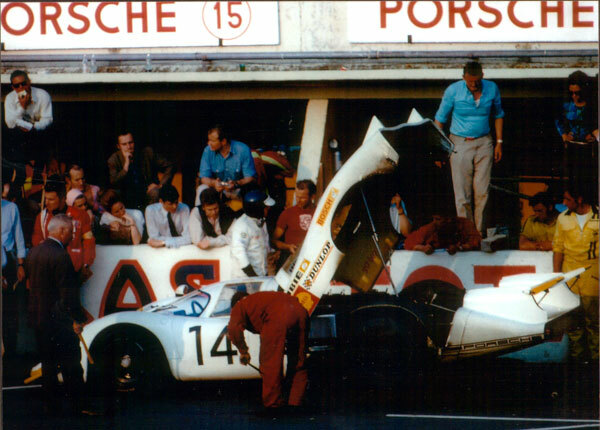 Porsche 917-021 was completely restored after it's last race in Kyalami 1970 (driven by Kurt AHRENS (left) and Jo SIFFERT). 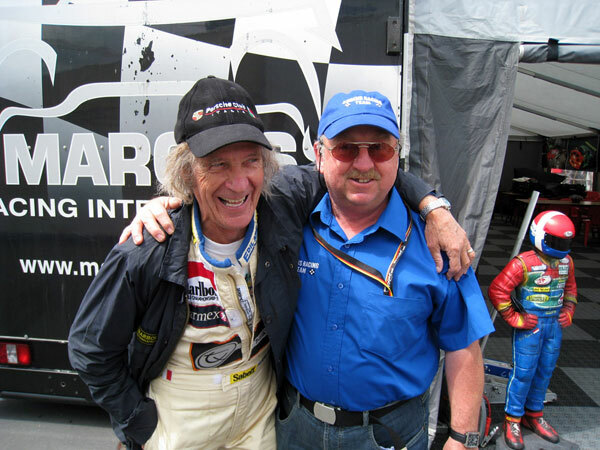 Fond memories for Kurt after more than 40 years! 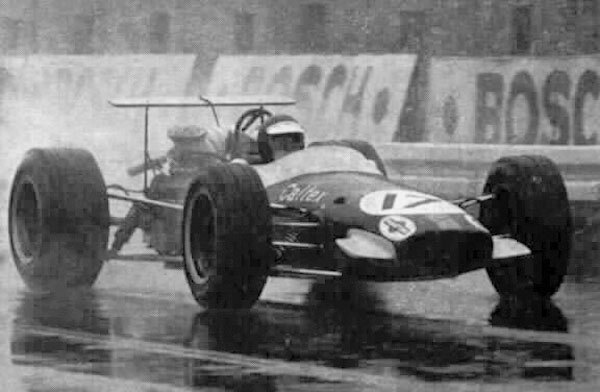 Kurt AHRENS and the Formula One BRABHAM BT26. 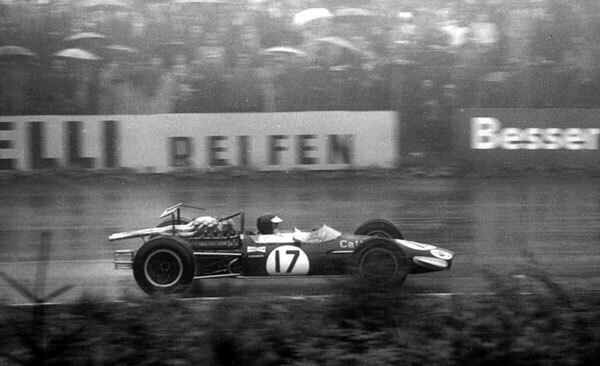 In a similar car, Kurt finished 12th during the rain soaked 1968 GERMAN GRAND PRIX at the NÜRBURGRING. 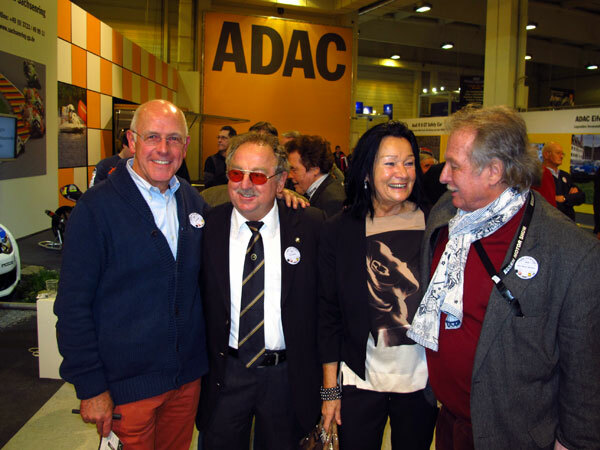 Posing with Kurt and Reni AHRENS and Hans-Dieter DECHENT.